We packed about as much into the last 3 days of our vacation as we possibly could. 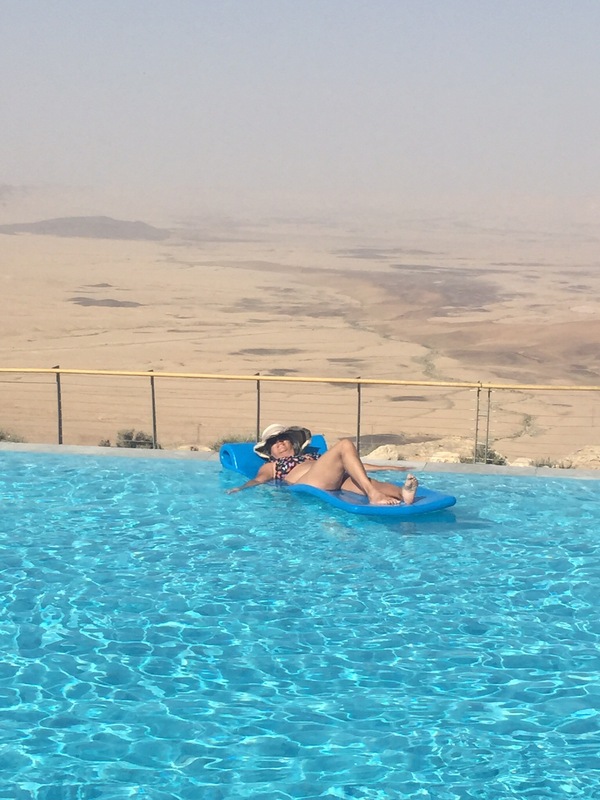 We left the pool at the Ramon Crater and were picked up by our driver Tovia Cohen for our drive to Eliat, at the southern tip of Israel. The drive took us through the crater. This is definitely a place to explore more at a future visit when, hopefully, the temperature will be well below the 110 degrees it was when we drove through. 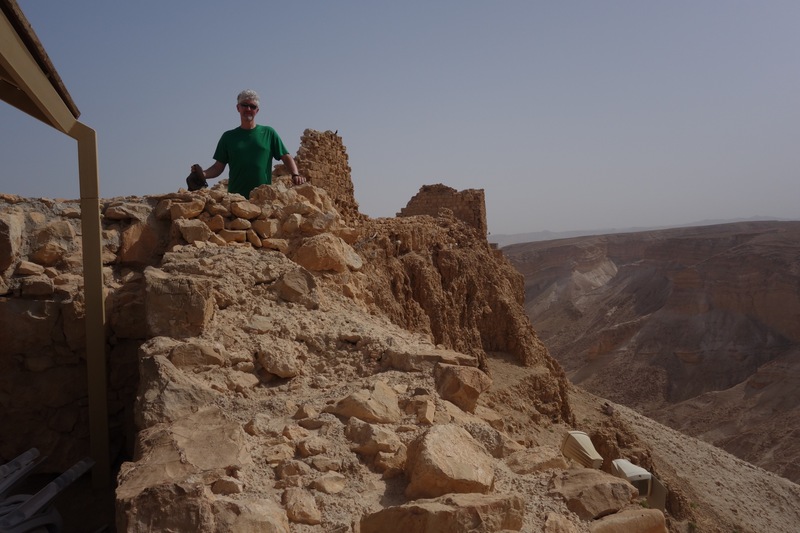 Tovia drove us about 2 hours through the Negev desert until we were just north of Eliat, and then we drove east for about 5 minutes to the Jordanian border for our overnight excursion to Petra. 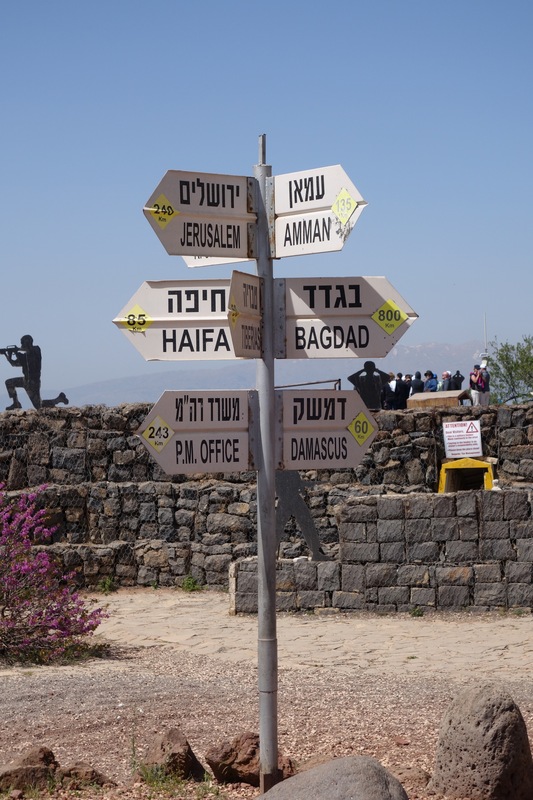 Crossing the border from Israel into Jordan was an experience. There are multiple steps and fees on both sides of the border along with a 50 yard “no man’s land” between the two. There was a line of people ahead of us, but we were probably the only Americans. We were met at the boarder by our guide, Marwan, and his driver Sam. 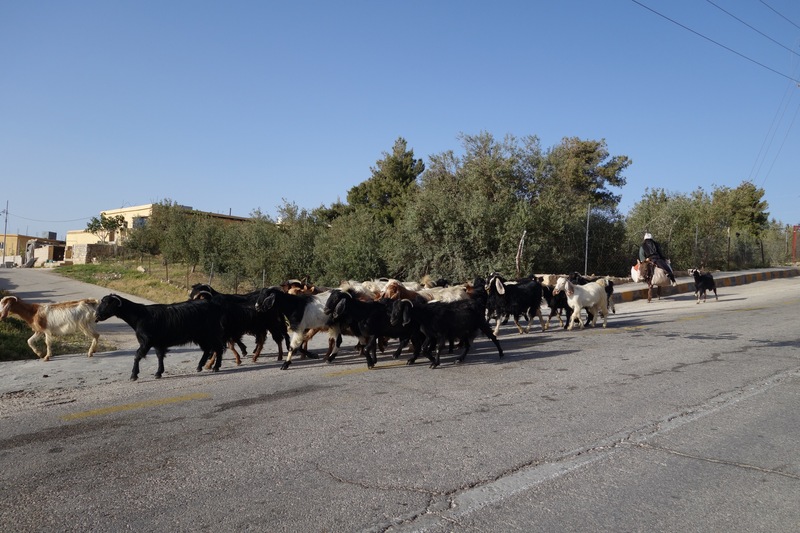 They were our excellent escorts to Petra. On the way they proudly showed us Aqaba (the modern Jordanian city that shares the north tip of the Red Sea with Eilat), before we headed north into the Jordanian side of the Negev desert and up into the Jordanian mountains. 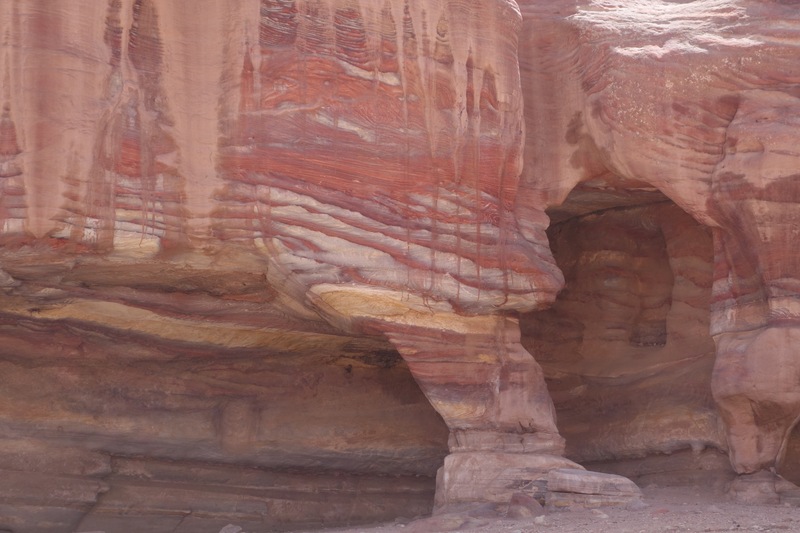 The 2 hour drive to Petra went through some interesting and diverse terrain. The mountains are unusual: red sandstone with diagonal stripes of black lava. From the barren desert we climbed into the higher hills where there was enough grass between the rocks for a few goats to graze. 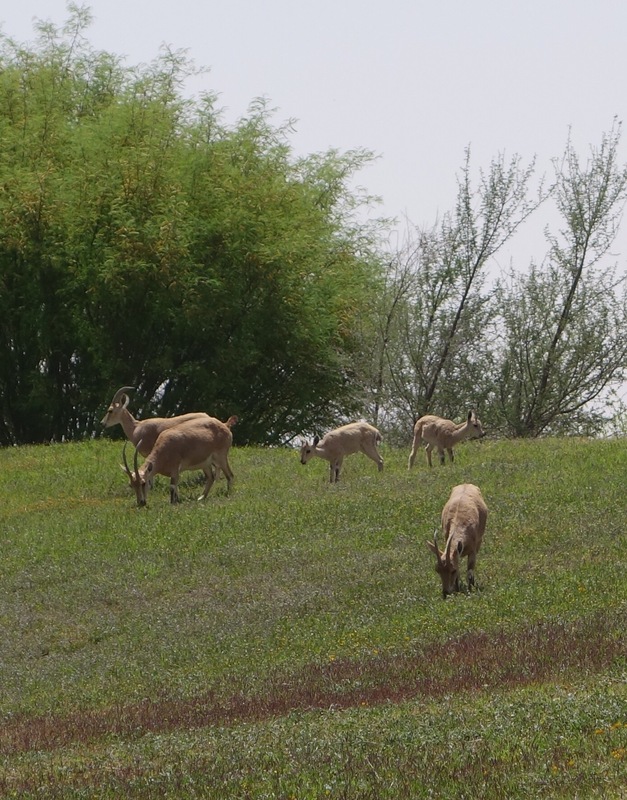 As we climbed to 4,000 feet, the temperatures decreased to the mid-80’s and there were a lot more goats, and even some sheep, camels and donkeys. We made a quick stop with a great view of the mountains falling away into the desert about 30 minutes from Petra. 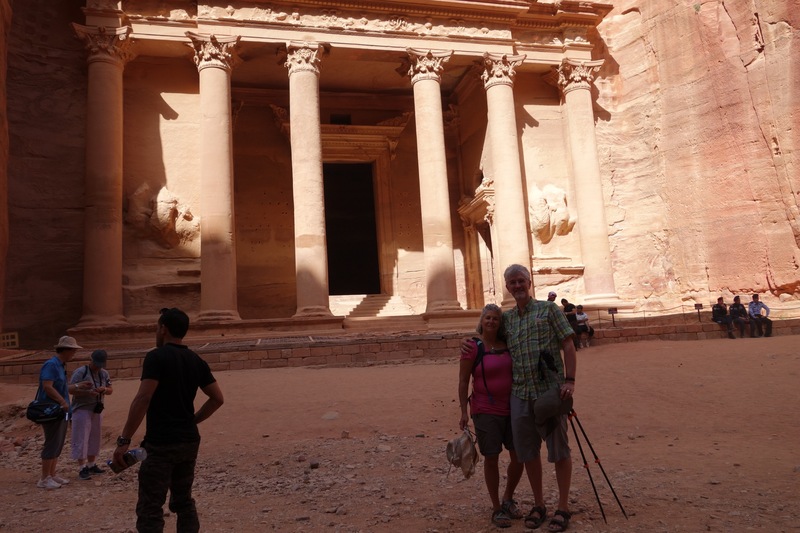 Marwan and Sam delivered us to our lovely hotel, the Movenpic, located right next to the entrance gate into Petra. 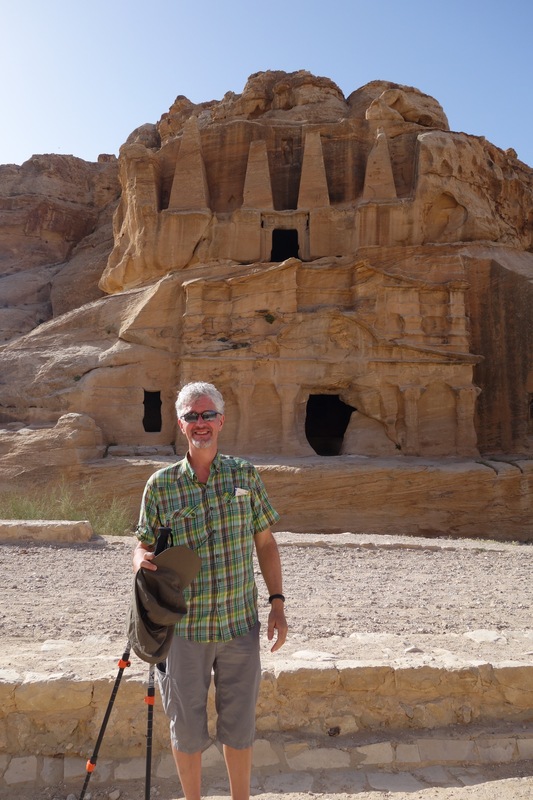 Petra is more than ancient carved sandstone temples, tombs and caves. Between 200 BC and 200 AD, Petra was a major crossroads city of over 20,000 people strategically located on the main “incense trade” caravan routes among Damascus, Constantinople, the Red Sea, and what is now Saudi Arabia (where incense such as frankincense & myrrh were manufactured for use in religious and burial ceremonies throughout the ancient world). 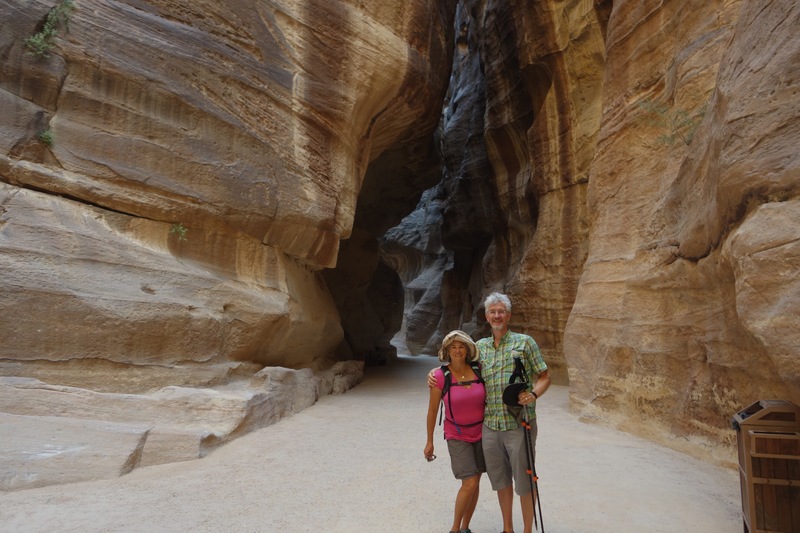 The narrow sandstone cliffs of Petra are very similar to Zion National Park in S.W. Utah. 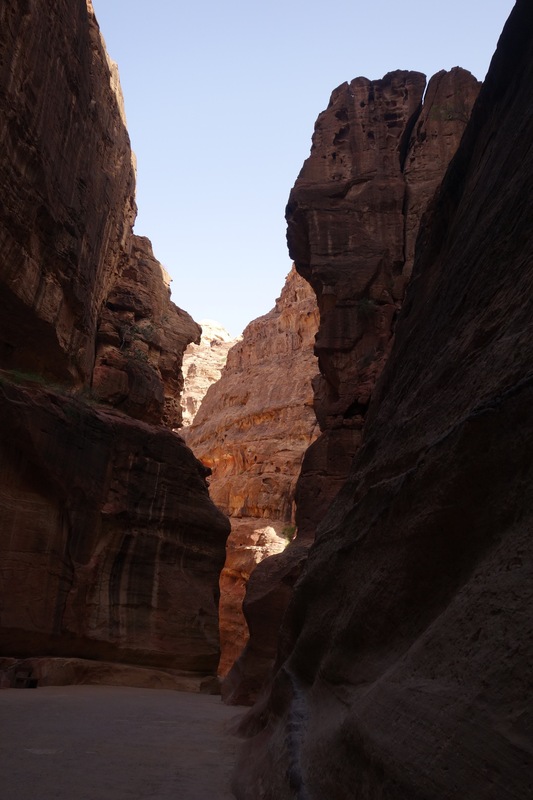 The Nabataeans who created Petra moved into the area from the northern Arabian desert after Israelites were taken as slaves into Babylonia around 500 BC, and the Edomites left the area to for the greener lands of southern Judea. 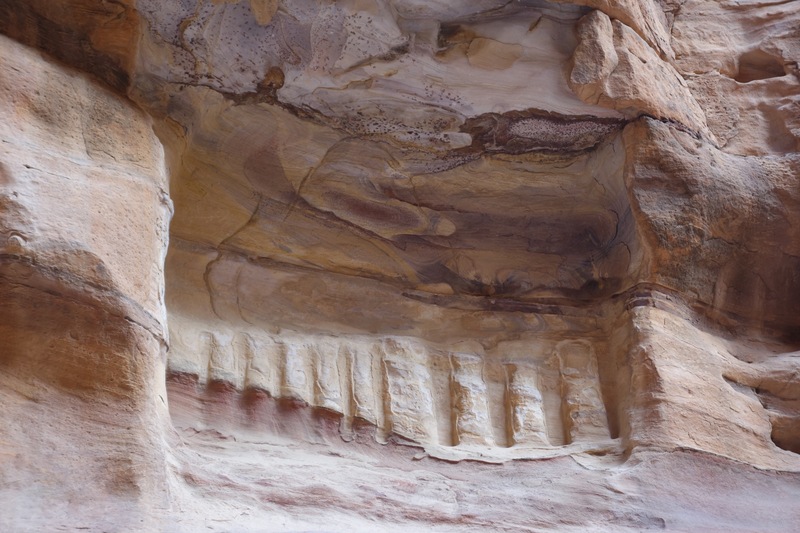 Although the classic Petra shot is known as the “Treasury” because many thought a treasure was hidden there, in fact all ruins carved into Petra’s sandstone cliffs are burial tombs varying in size according to the importance of the person buried there. 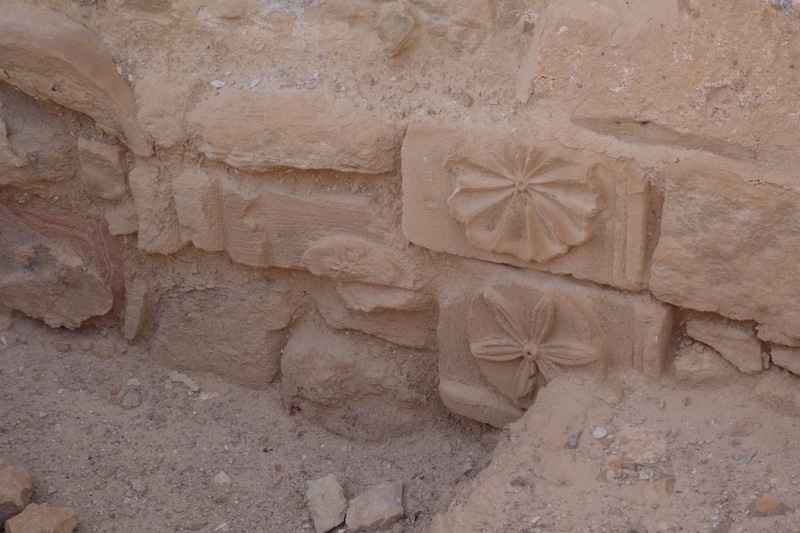 The Nabataens were one the most “modern” civilizations of their time. 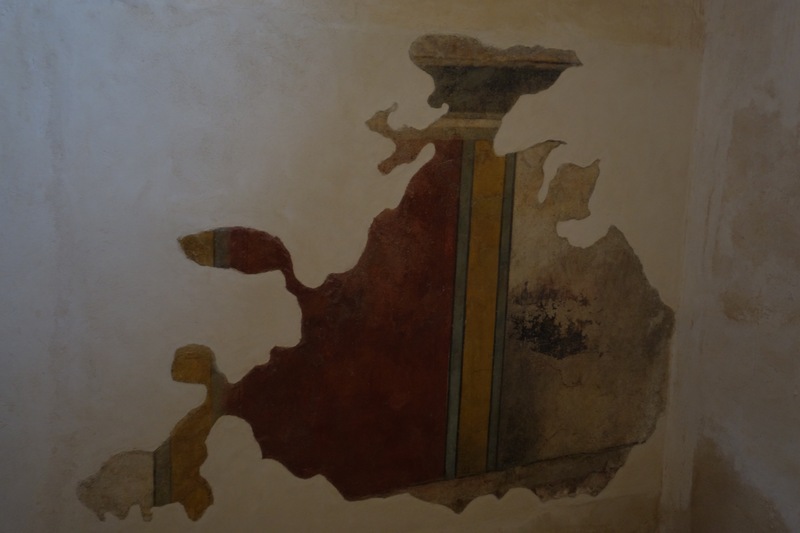 They were not a great military power, but their advanced knowledge about how to find and store water in the desert, plus their strong diplomatic skills when confronting militarily superior adversaries, allowed them to control the incense trade routes and become wealthy and prosperous. 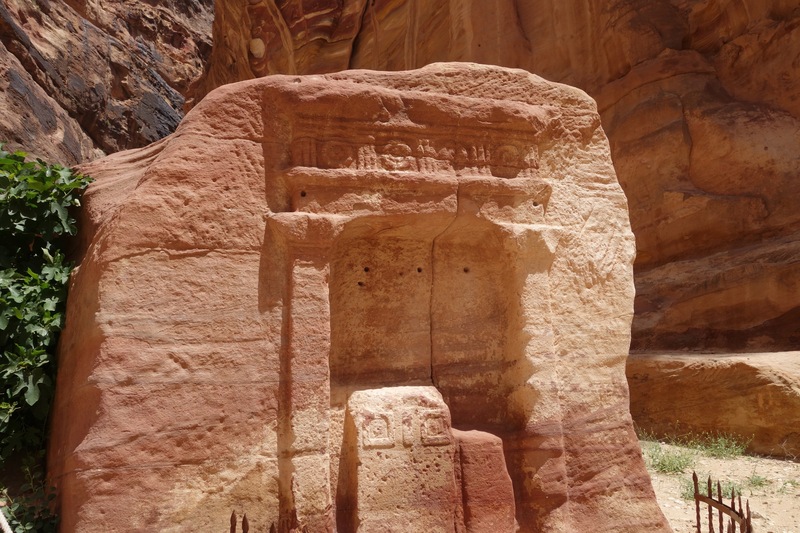 Because the Nabateans depended on trade, they respected all who traveled through the area (as long as they paid the “transit fees”). Most importantly and very unusual for this region even today, women had (almost) equal rights with men. Nabataen women routinely owned property and businesses, and Nabatea was the only kingdom of the ancient world where the King and Queen both appeared together on coins. 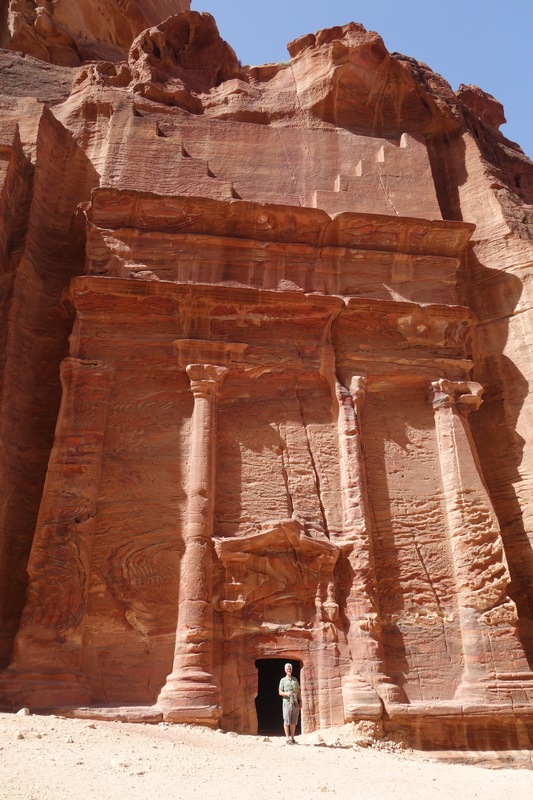 There are many countries in today’s Middle East that can learn a lot from the ancient Nabataens. We very much enjoyed our time with our guide Marwan who personally has chosen to follow the Nabataen philosophy for women regarding his wife, son and two college-age daughters. Jordan’s economy has been hit hard by the cost of supporting refugees from the Syrian civil war and by the spread of ISIS to western Iraq. Unlike other nearby Arab countries, Jordan has very few natural resources. Instead, the Jordanian economy depends mostly on tourism and on transit taxes levied on goods passing through Jordan, both of which have been hard hit by the violent conflicts nearby. As Marwan so eloquently stated: “The big problems in the world today are caused by those who want to dominate others.” Well said. 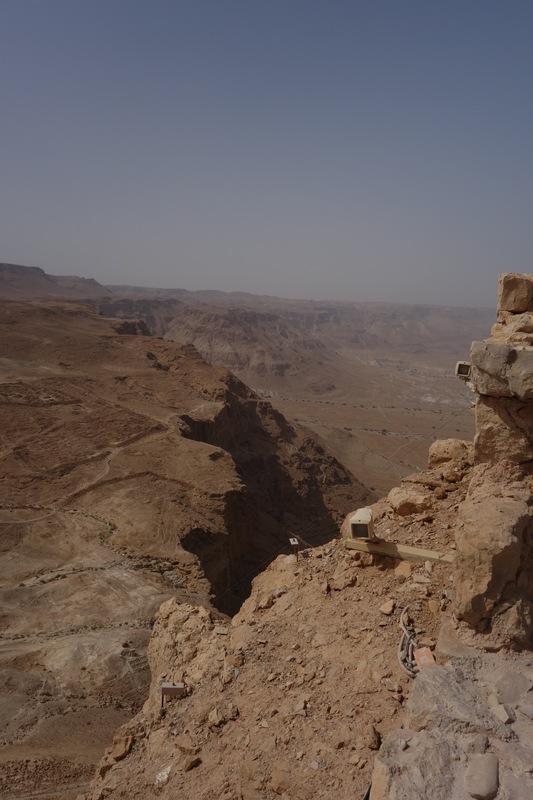 After our beautiful walk through Petra we headed back to Israel where we easily transited through the border and, thanks to a quick cell phone call, were promptly met by our Israel taxi driver Tovia on the other side of the border. This trip we bought local Israeli cell phone chips for our “unlocked” cell phones so we had working cell phones and internet the whole time we were in or near Israel. It made it a lot easier to call taxis or hotels or family back home when needed. 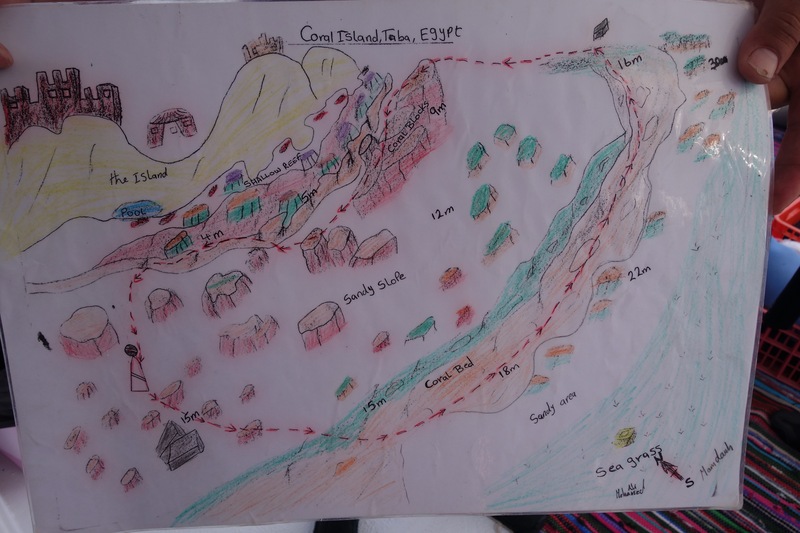 Eliat is a strange place on the Red Sea. The area at the southern tip of Israel is so narrow that you can stand at the water’s edge downtown and easily sea Jordan, Saudi Arabia and Egypt. Israeli young people come to Eliat to play. The boardwalk area is an “over the top” Las Vegas style playground of hotels, carnival rides, shopping and restaurants. 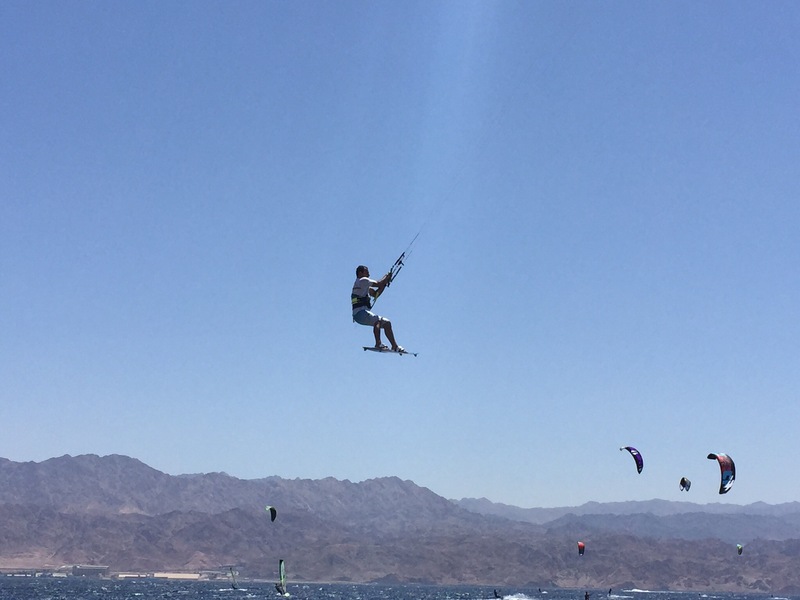 The most southern beach area (next to the Egyptian border crossing to the little resort city of Taba) is teeming with sunbathers, kite surfers, wind surfers, scuba divers and snorklers. Our hotel there was in the quieter, southern part of the city close to the scuba shop, which was good. Unfortunately, it was the only hotel during our trip that we didn’t like. We had to change rooms because the carpet in our first room was really gross. The Isrotel Yom Surf hotel is big, with big pools perfect for families, but not as clean as we like. Next time we would stay someplace smaller and cleaner. 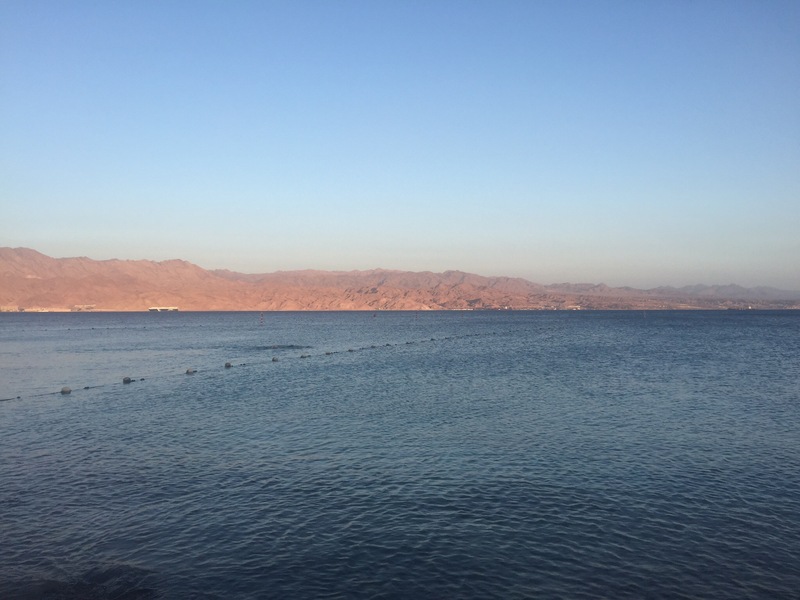 We really only had one day in Eilat for scuba diving the Red Sea which led us to our next adventure. We chose to dive from a boat instead of from shore, but this required crossing the border into Egypt. 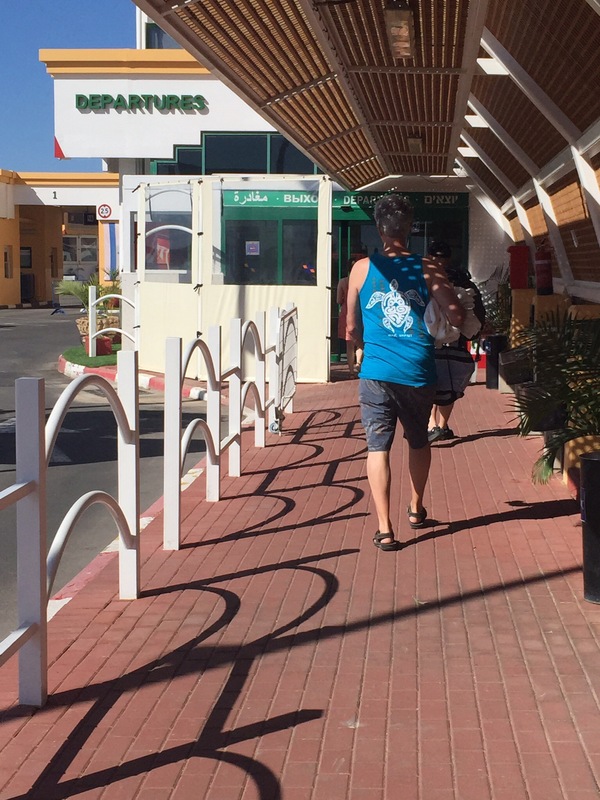 We were told by the Eliat dive shop to bring our passports “because we might need them”. That was a bit misleading. 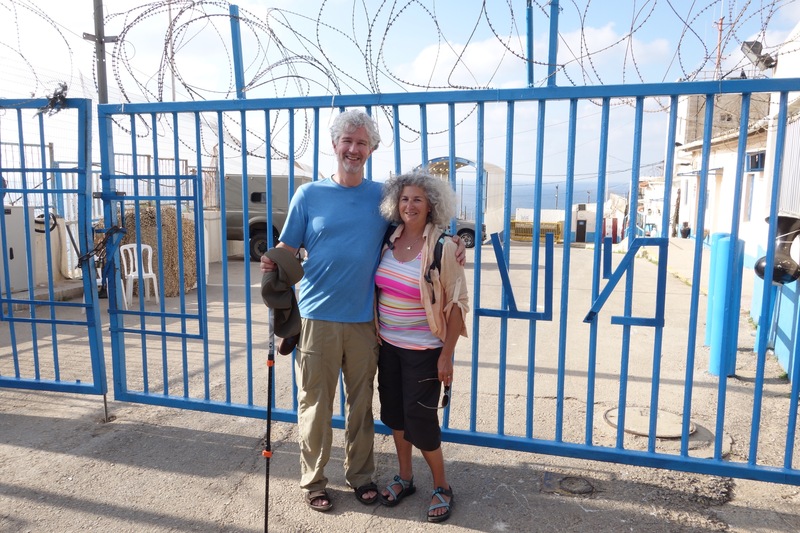 We absolutely needed them because we had to go through the official border crossing into Egypt before we could get on the dive boat — at this narrow part of the Red Sea, boats are not allowed to cross the well guarded border. Our boat left from the little 3-boat dock at the Taba Hilton which was just beyond the Egyptian side of the border crossing. Joining us were a French family whose daughter was working in Israel with an NGO. Unfortunately, her student visa did not allow her to leave Israel for day trips to Jordan or Egypt, even for a few hours. But after some tears and some special help from an administrator, they let her through. Apparently, Israel border security routinely “profiles” pretty young women, because terrorists have used them in the past to smuggle explosives, usually unknowingly. 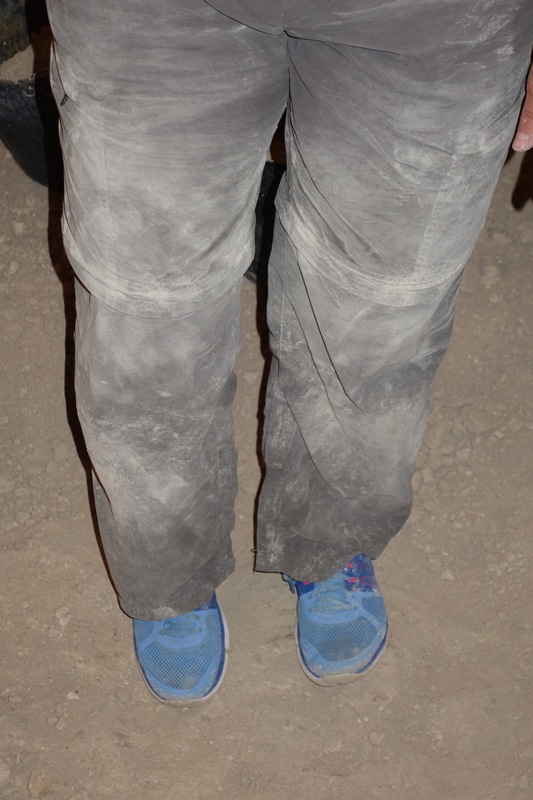 The border crossing was the same drill as for Jordan, with three different stops on each side and a “no man’s land” in between. The Egyptian side of the border crossing was very inefficient compared to the Jordanian crossing, with a large number of men (not one woman) at each station apparently doing nothing while we waited for them to notice that we were there. 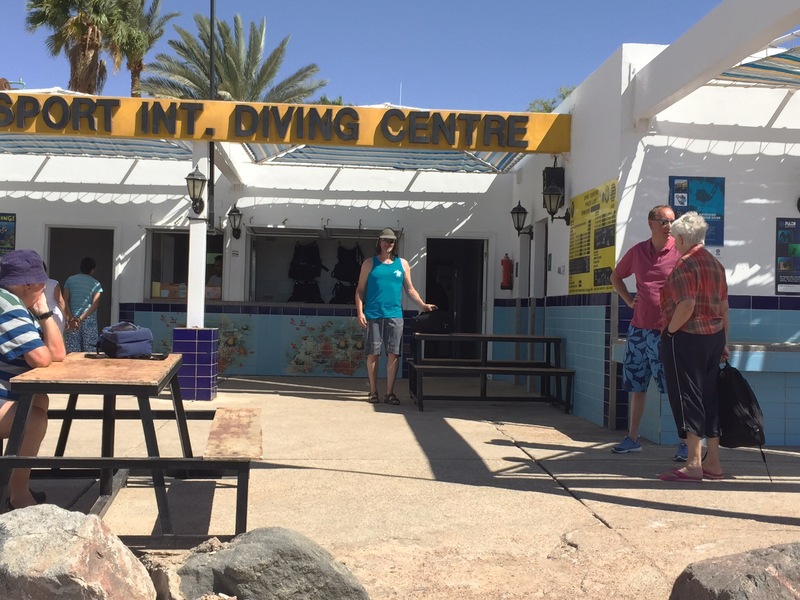 After finally making it across the border, we had to find our way to the Egyptian dive center at the hotel, which took a lot longer than it should have because there weren’t any signs and no one gave us clear directions. 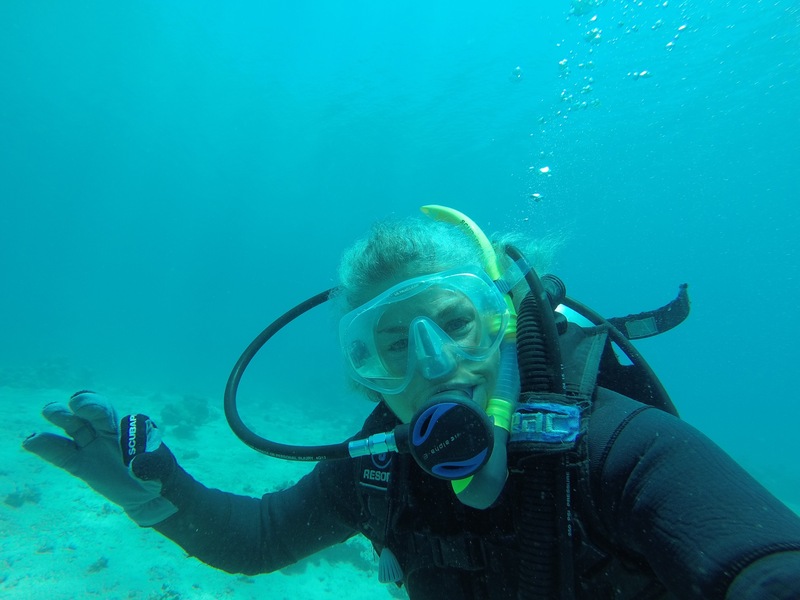 Although the dive equipment was a little old, the dive master, the dive boat, the scuba tank air and the diving experience itself were all great. It was wonderful being out on the beautiful blue water on a boat. We spotted flying fish next to our boat almost immediately. Our three dives were really beautiful with lots of interesting fish, pretty coral and crystal clear visibility. 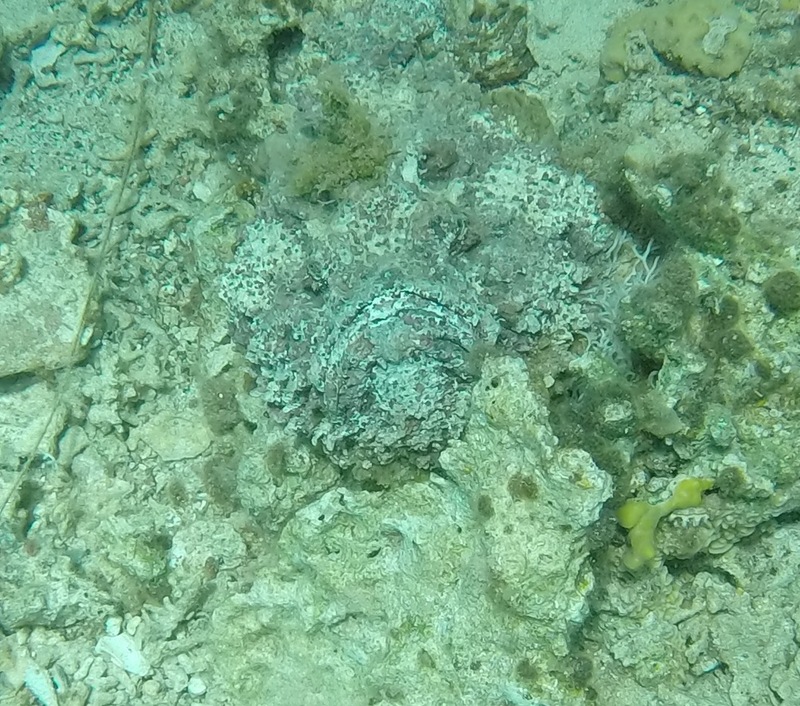 This area has lots of big lion fish, scorpion fish, rock fish and other similar camouflaged poisonous ground fish. We learned after our first dive that these fish are really quite venomous and we would have had to be rushed to the hospital if we were stung. (That propably would have been better shared before we dove our first dive!). Fortunately these fish are not aggressive at all unless you are aggressive towards them. 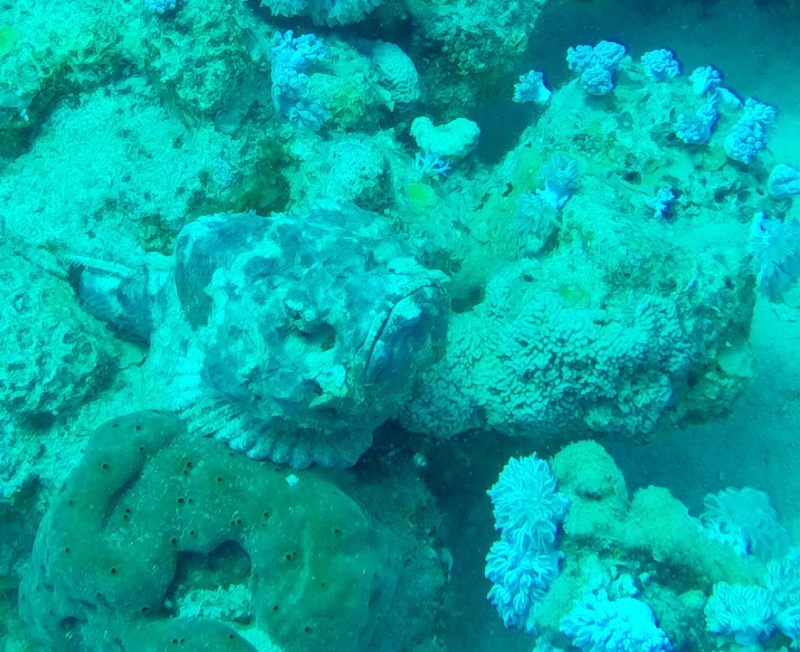 These fish are really hard to see in the photos because they like to hide in the sand or on top of the coral. Our last dive, at Coral Island, was our favorite. I didn’t want to leave the water! The trip back through the border crossing was easy but tedious and no one from the dive shop met us at the Israeli side of the border to drive us the mile back to our hotel. So we walked a bit and hailed a cab at another hotel. Back at the Isrotel Yom Surf we took a quick shower and rested before heading out for dinner. Although we were pretty tired we felt we had to venture out to grab a bite and see Eliat’s famed “boardwalk” area. As I described earlier, it was quite a show. We slept soundly and spent our morning at the busy beach watching the beautiful kite surfers expertly playing and jumping in the wind. 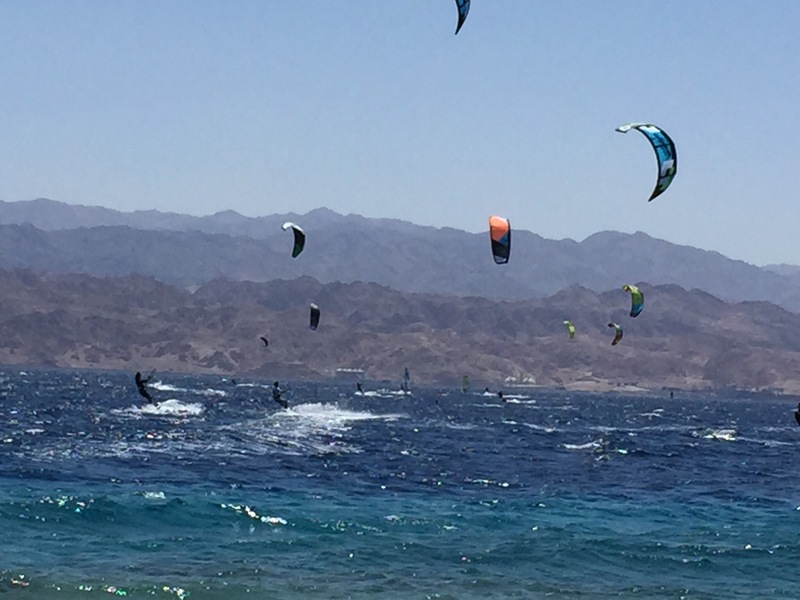 The Israeli side of the Red Sea is full of colorful activity as people play on the surf and beach. We didn’t see anything like that in nearby Jordan & Egypt. There are hotels there but not much playing, as far as we could tell. After our morning at the beach we took a 50 minute , super easy flight to Tel Aviv’s little “Dov” airport for our last night in Israel. We ended our trip where we began, at the “Shalom Hotel and Relax” which was our favorite hotel on our trip. 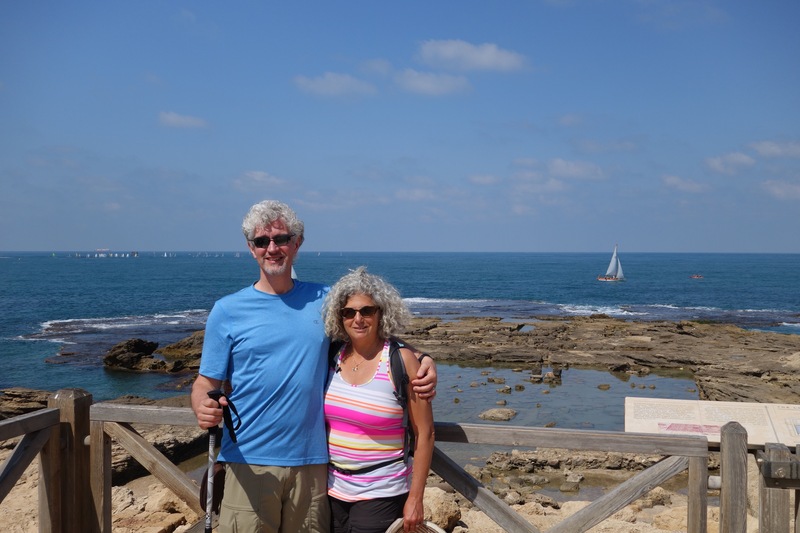 We deposited our bags in our room and took another walk around the ancient port of Old Jaffa while enjoying the much cooler temperatures and Mediterranean ocean breezes. We watched our last Israeli sunset from the lovely hotel rooftop deck and then headed out for a fantastic final meal at our favorite restaurant: Shila’s. 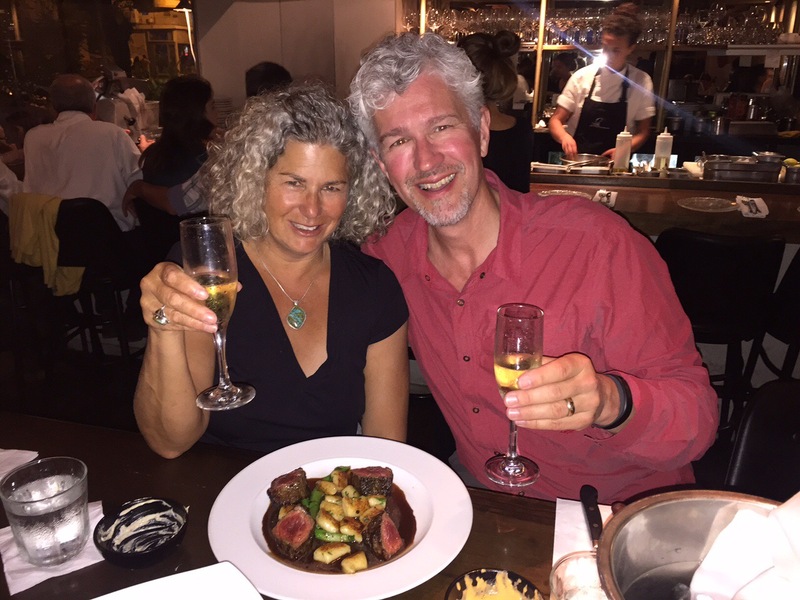 We called to make our dinner reservation several days earlier in the week but even then we were only able to reserve a couple of seats at the bar. But it turned out great because we loved getting to know our bartender/server. He was flying to Atlanta, Georgia the next day to try to sell a special switch for laser equipment to the U.S. Army that he and his cousin had developed. Although he looked so young, he had already finished his mandatory military service as an officer. He truly represents the young, intelligent, can-do entrepreneurial spirit of so many in Israel. Unfortunately, this was a sad and stark contrast from the news stories of riots and violence in America (which we were asked about often). Hopefully, these crises will lead to the reforms needed to improve the quality of life in America’s inner cities. Today, we woke early enjoyed our last big Israeli breakfast and were picked up by our driver and taken to the airport. As I write this we our on our first flight of the day, to London (5 hours because of a strong head wind), where we will get our next flight (9 or 10 hours) to Seattle. We left Tel Aviv on Sunday at 10 AM and should arrive in Seattle the same day at 5PM, but our trip will take 17 hours because Israel’s local time is 10 hours ahead of Seattle’s. We can’t wait to see everyone again! Jasmine, David and James will be picking us up at the airport so we’ll get to see them first. Overall, We’ve been blessed with a magical and amazing trip. 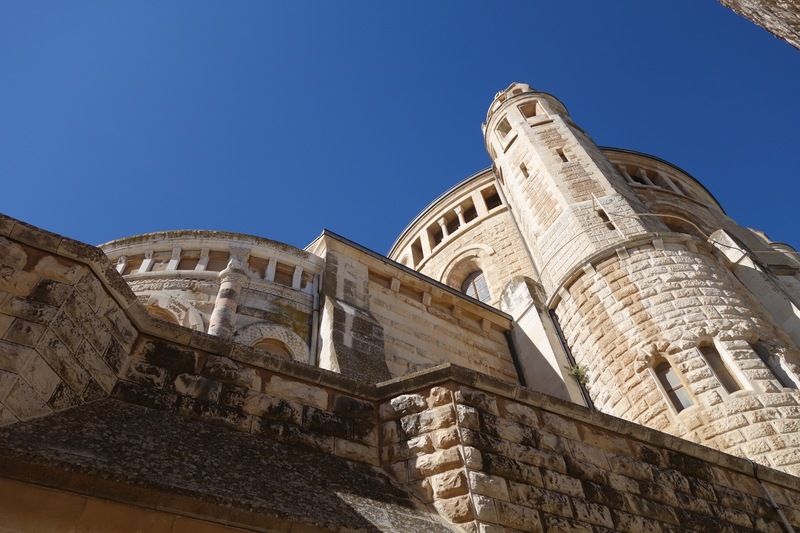 We thought we understood Israel and the area before, but it is hard to truly understand the complexity, mystery and history of the Holy Land without visiting it in person. We believe the best thing an average person can do to understand this area, support Israel and fight the terrorists (including ISIS and the others near here who want to dominate others) is to visit and see this beautiful and exotic land for yourself. A good way to support peace is to travel here among the countries that want peace. Meet the friendly people, enjoy the area and the wonderful vibe. Many thanked us for being brave or courageous for visiting. We didn’t feel brave at all, and would not have visited if we didn’t think it was safe. Instead, we feel fortunate, humbled and proud to learn more about the people, culture and history of this amazing area, and to be able to share it with our family and friends. Thanks for reading! PS. We are home! Posting our last blog from the boat. 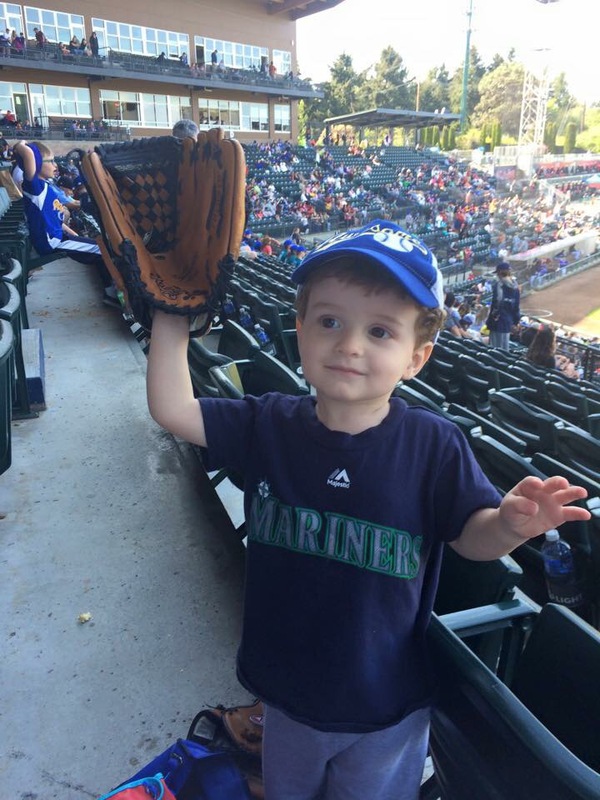 As Jim said last night, “we love traveling, but our souls’ home is here in Seattle. And there is nothing better than being picked up at the airport by your grandchild! 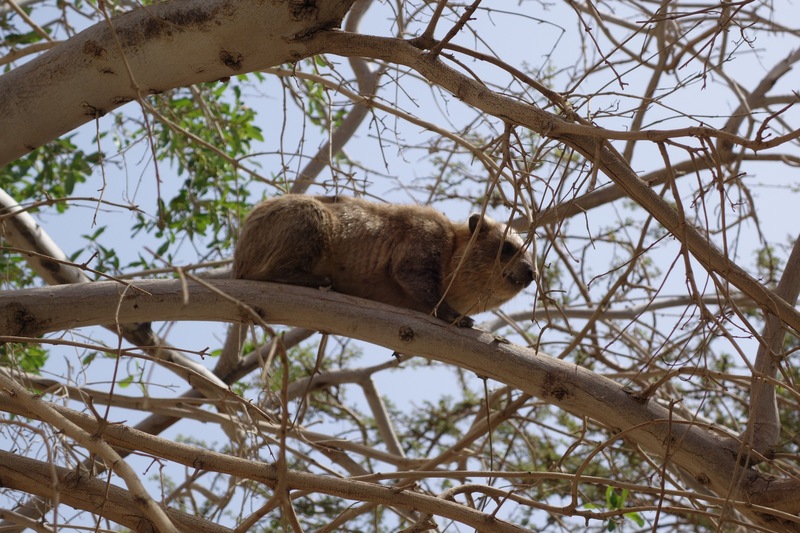 Yesterday we drove out of town for an adventure near the Dead Sea. On the way down we passed the spot in the hills which marks sea level. The Dead Sea is 1400 feet below sea level — the lowest dry land on Earth. 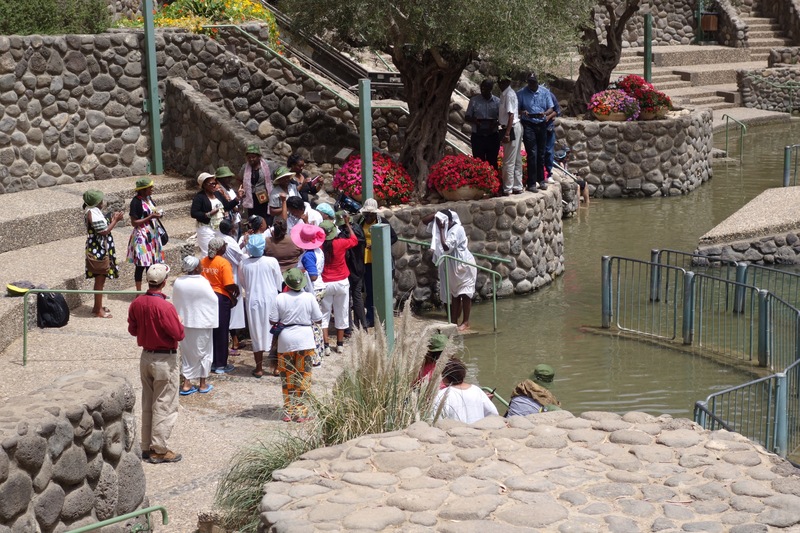 Our first stop was at the spring at En Gedi. For Washingon State it’s barely worth noticing, but in the desert, adjoining the Dead Sea, it’s mana from heaven. The surrounding hills are barren but still quite lovely. 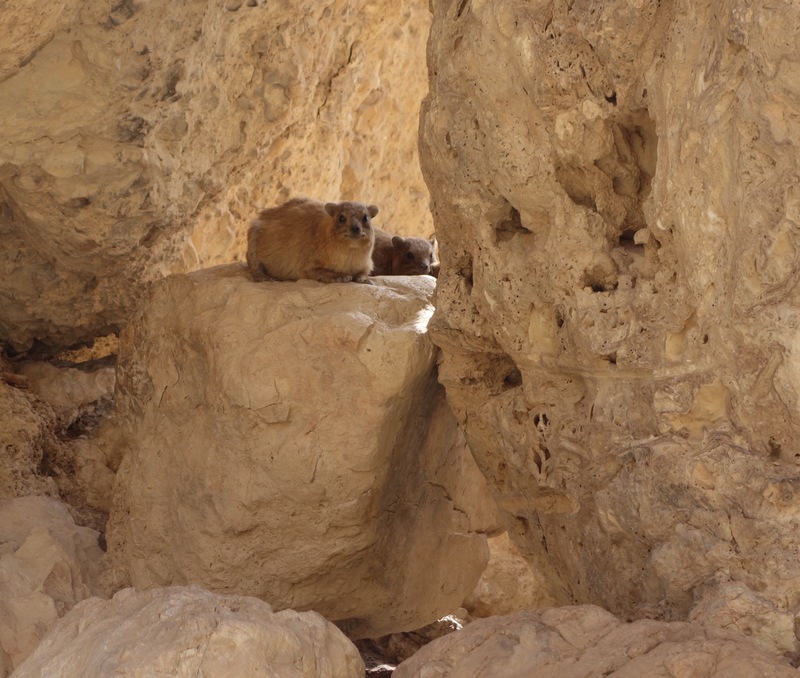 Almost immediately we saw local “Rock Rabbits” which come from Africa. I of course played in the water with the visiting school kids. 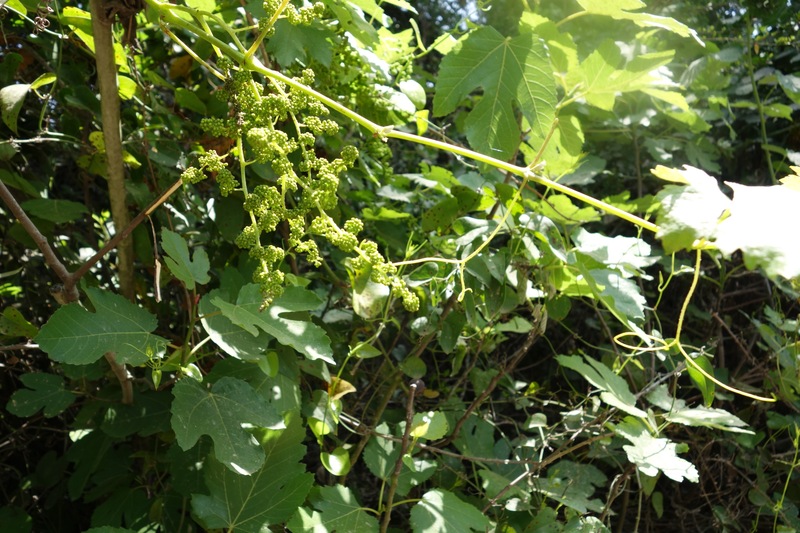 Ari showed us where capers come from. 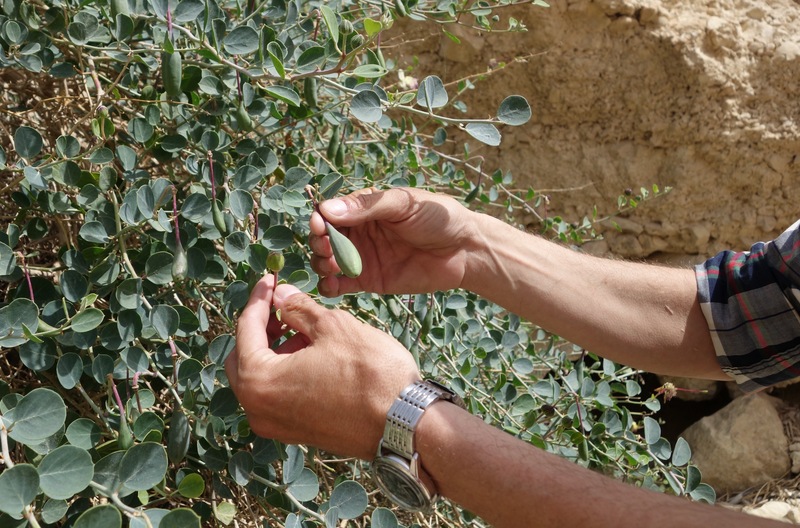 First, the pod (the caper); then the flower, and finally the long seed which is also edible. 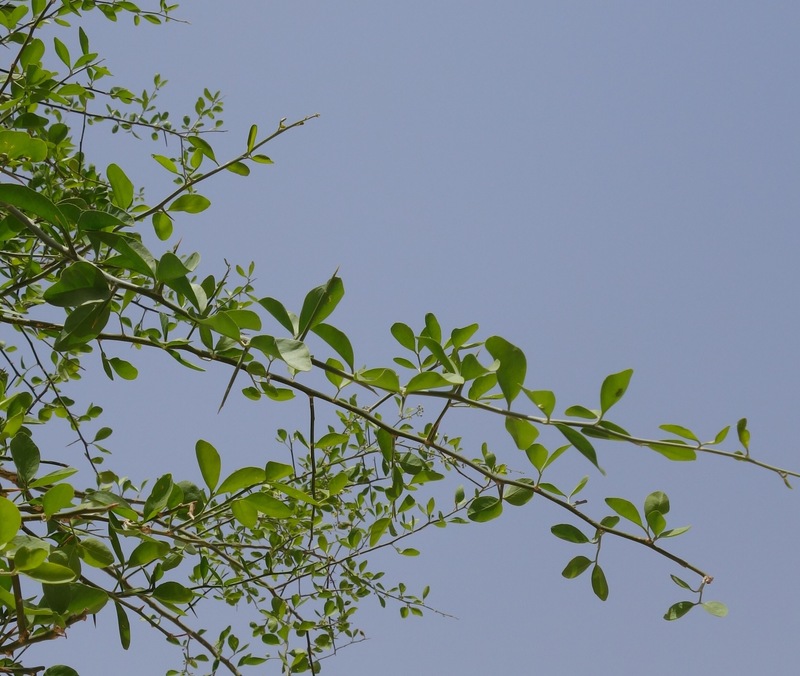 Here is the tree that was most likely used for the crown of thorns put on Jesus before the Crucifixion. The thorns are huge. 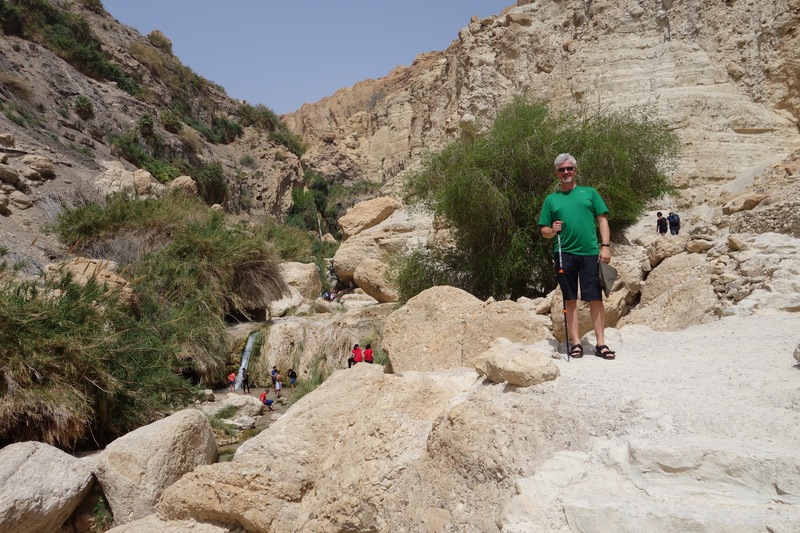 From En Gedi we proceeded about 20 minutes south to a nearby hotel to experience the Dead Sea and have lunch. 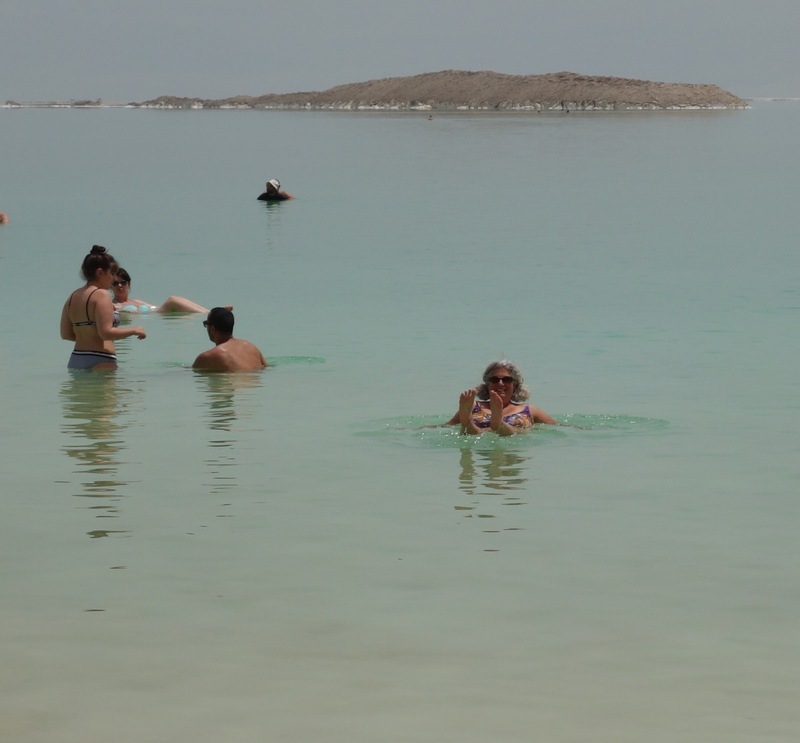 We’ve all heard about floating in the Dead Sea but it is amazing to experience it. You feel unweighted from the minute you walk in the water. Jim didn’t like the feeling of the concentration of chemicals in the water slowly burning off his skin. If you drink a cup of the water, you’ll die. A bit of it will make you throw up, so most people experience the incredible bouyancy without splashing or getting your head in the water, and even then for no more than 30 minutes. Your skin definitely feels scrubbed clean when you’re done (but without any scrubbing). 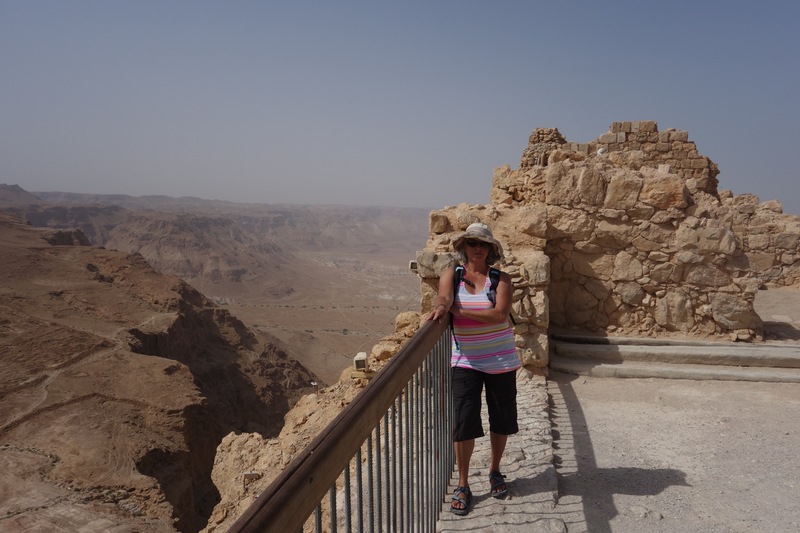 We rinsed in the beach showers before swimming in the hotel pool, showering again at the hotel spa, before having lunch and heading out to our final stop of the day: Masada. It was late in the afternoon and extremely hot, but empty. 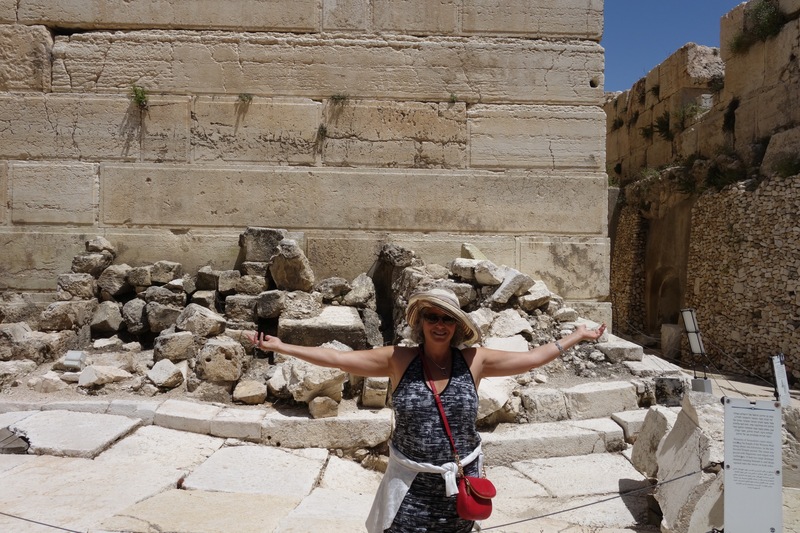 Again, Herod out did himself with the construction of this mountaintop palace and fortress. The system for capturing rainwater in the 14 huge cave cisterns was remarkable. 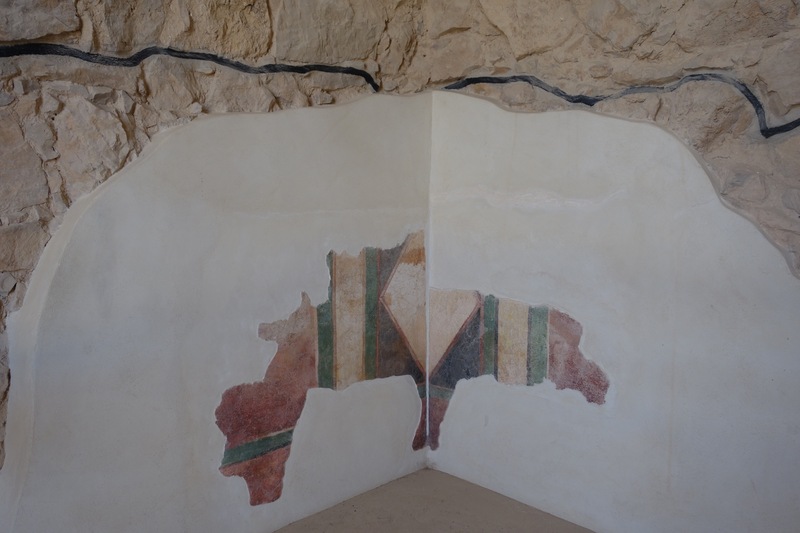 Not only is Masada an amazing example of ancient military engineering, it is decorated and plush with both a Southern and Northern Palace so Herod could stay in the part of Masada that was warmer in the winter and cooler in the summer. It took the a Roman Legion (10,000 troops) 8 months to finally defeat 1,000 Jews (most of whom were women & children). 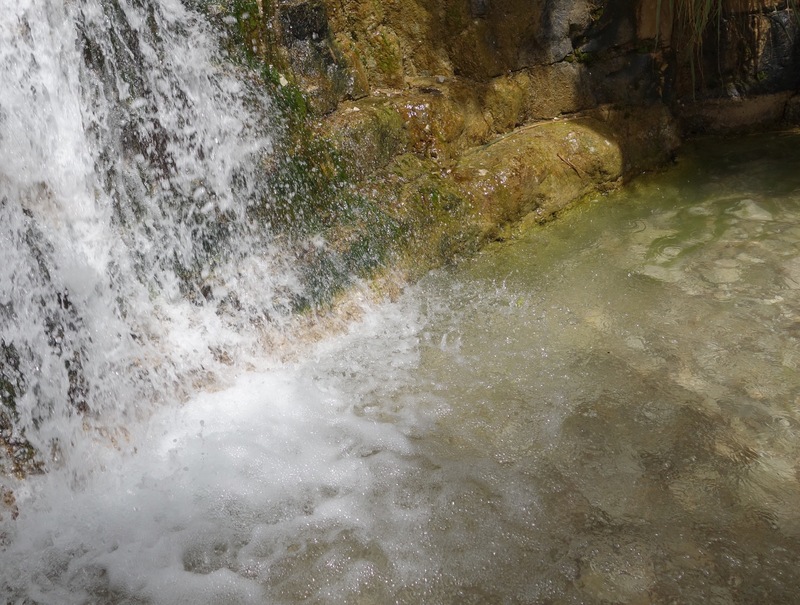 The only reason the Romans were able to sustain a siege that long in the Dead Sea wastelands was the nearby fresh water from En Gedi. Eventually the Romans were able to build a massive ramp to carry a huge mobile assault tower to the “only” 700 foot high walls on the western side. It must have been terrifying to watch the slow progress of the dirt ramp and wooden assault tower over the months. Ultimately, all the Jews chose suicide over being being raped, tortured and at best enslaved for life. Each Jewish defender killed his own family, and then 10 men were selected by lot to kill the other men. The last ten soldiers then decided who would kill the other 9 before falling on his own sword. We know this because one woman survived and told the Romans, who then recorded it in their historical documents. 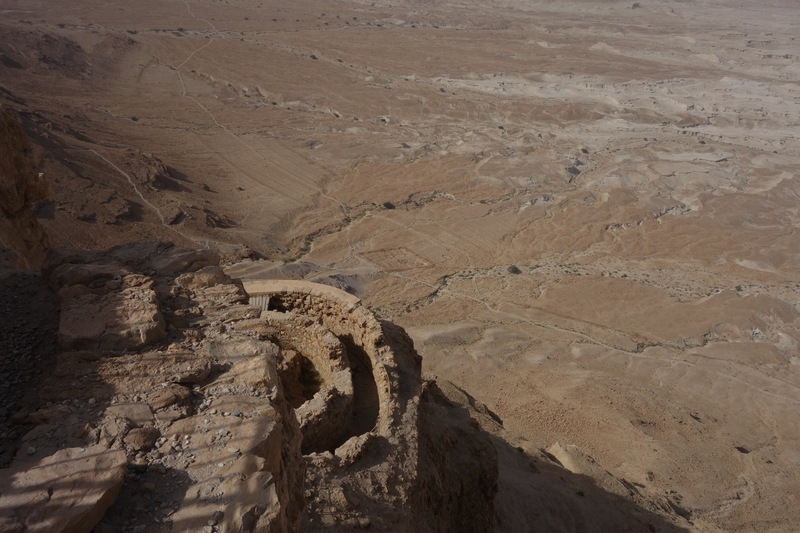 Before the war which followed Israel’s Independence in 1948, the young zionists used Masada as a symbol and training ground for the young men and women who would become the soldiers needed to defend Israel from the likely all-out attack by the neighboring Arab nations that most people thought would follow Israel’s independence. This morning (our 35th Engagement Anniversary! 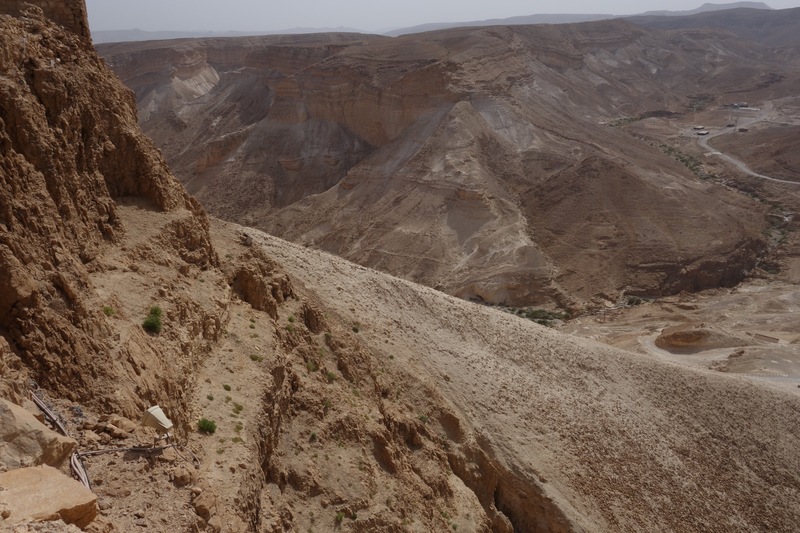 ), we left Jersulam to head south into the Negev Desert. 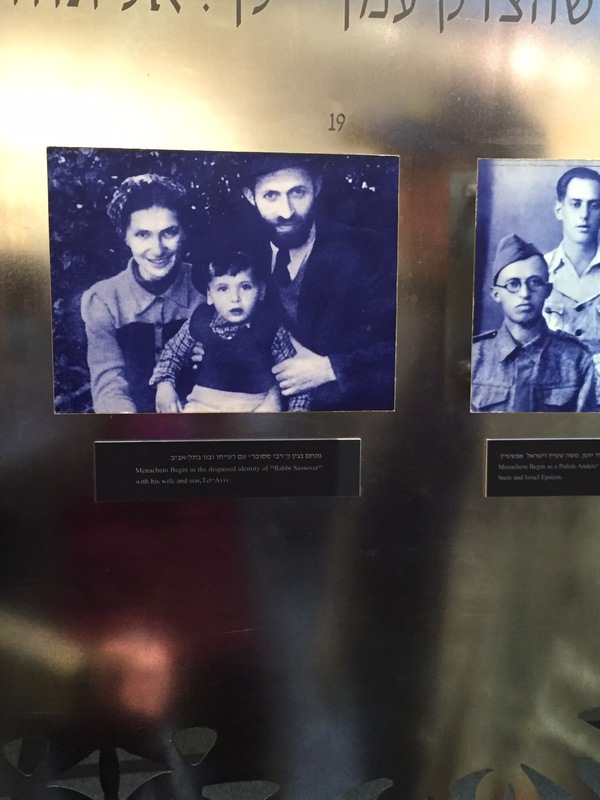 We stopped briefly at the national monument and museum honoring Israel’s first Prime Minister: David Ben Gurian. Young soldiers were their doing leadership training. 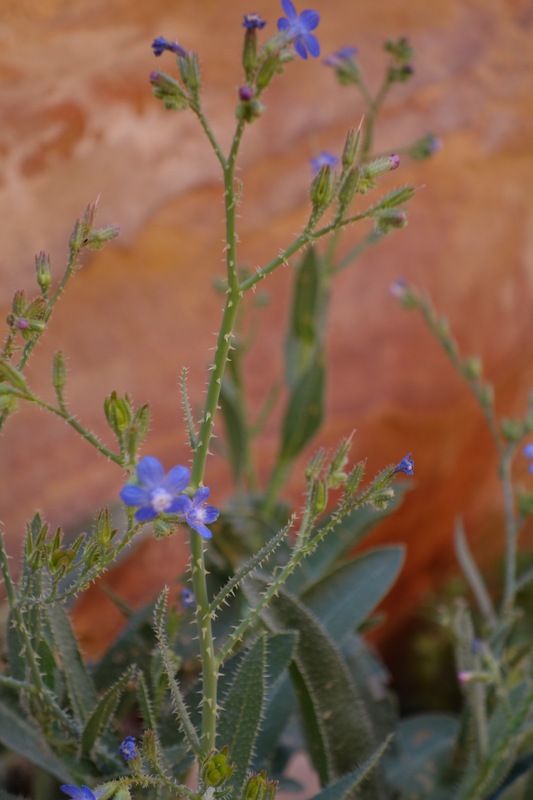 The views of the desert were beautiful and during a different time of year Ari said the hikes are beautiful. 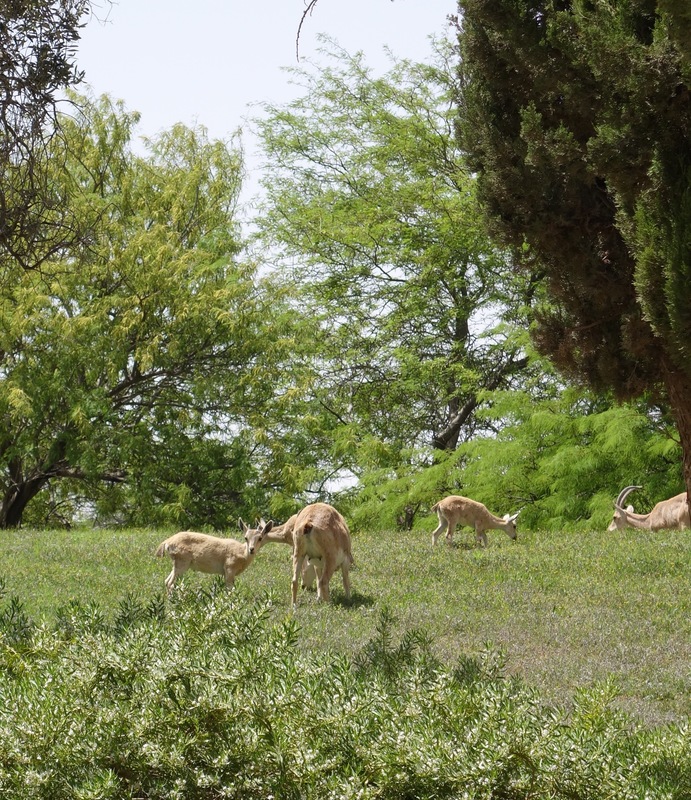 A group of wild mountain goats escaped the desert for a green treat in the park like setting. This evening and tomorrow morning we are enjoying a lovely respite at the Beresheet Hotel at Ramon Crater. It’s a truly lovely hotel with an awesome pool. Originally, they thought this crater was formed by a meteor strike but it’s actually a geological formation caused by the receding ocean long ago. After grabbing lunch we said goodbye to Ari Ram. We will miss him, but I know we will meet again. 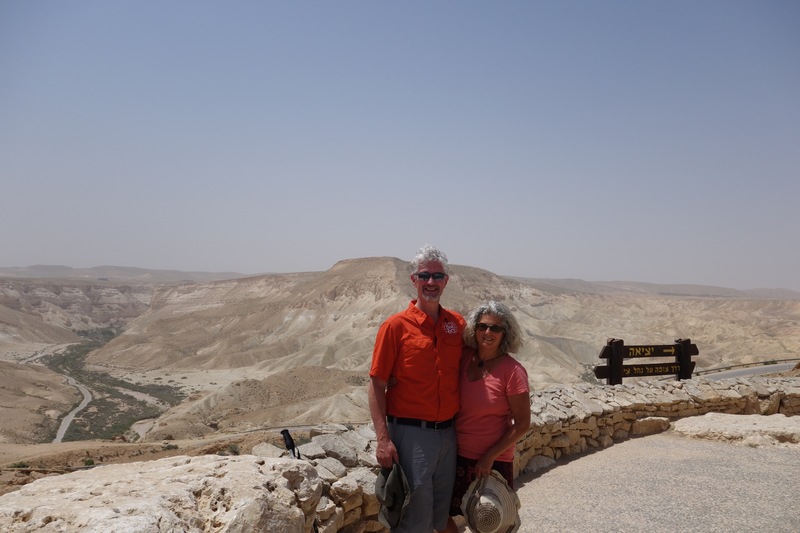 Tomorrow, our True Love Adventure continues with a long drive further south, past Eilat, then north-east into Jordan to the ancient city of Petra where we overnight before returning to Eilat at the southern tip of Israel which adjoins the Red Sea. 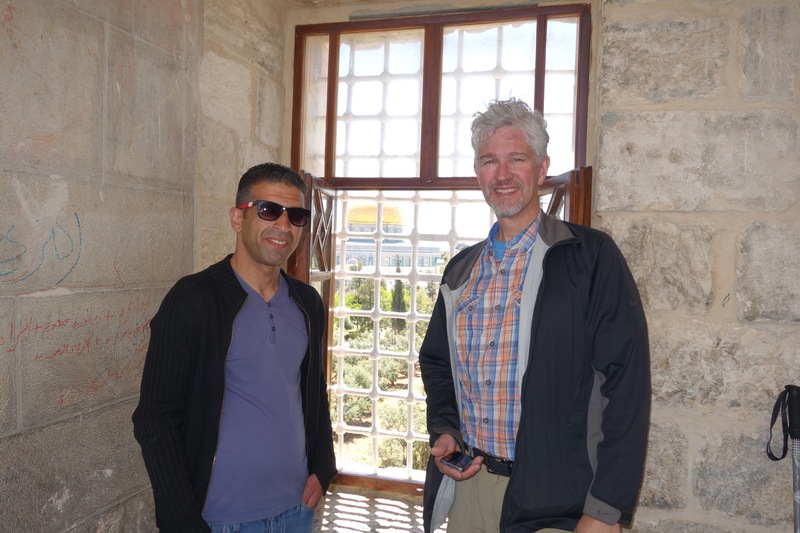 The last 2 days we have been guided through the old city by our Master Guide (and now dear friend) Ari Ram. 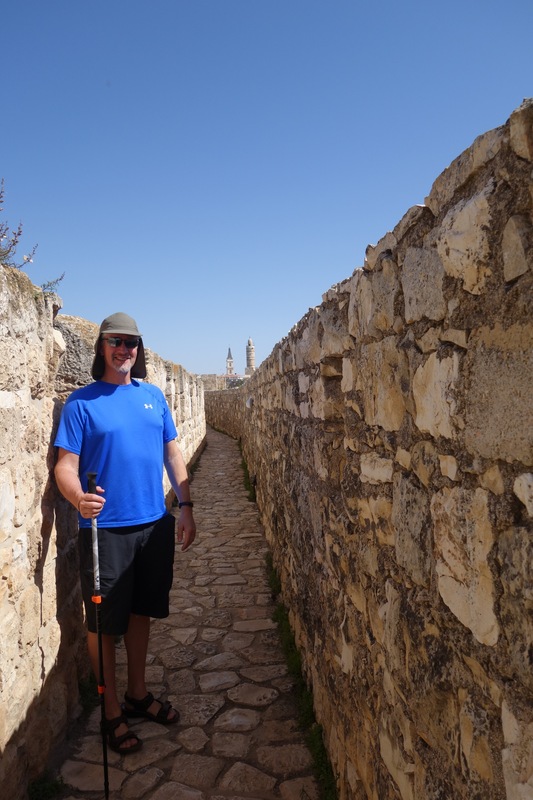 I think it is virtually impossible to understand Jerusalem without experiencing it in person and with a good guide. 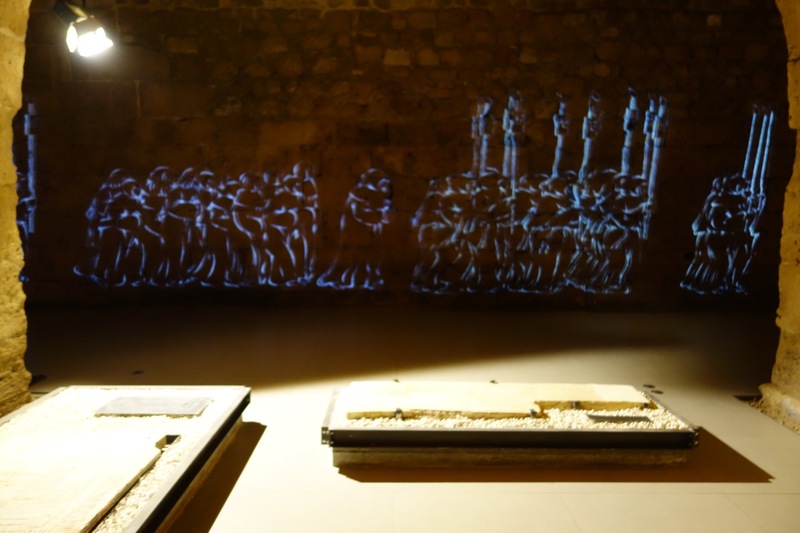 Over the last week we have experienced Jersualem in depth, both casually and intensively. It’s such a complex place where you can feel all the good and the bad, from ancient to modern times, swirling around you. Among the many things affecting you as you walk through the Old City are: (1) the underlying tension and mistrust among the various modern religions and tribes; (2) the flood of tourists & pilgrims sweeping through narrow streets, about half of whom are smoking; (3) the cars which are allowed, unbelievably, to drive down any street that is barely wide enough for a car; the countless little shops every 15 feet, most with salespeople at the street bombarding you with a sales pitch honed over the ages in the crowed walkways. Mix it all up with the crazy, often counterproductive, Israeli, Palestinian & International politics and you get a sense of what it’s like to walk the streets of the Old City today. Yesterday, we focused on the Via Dolorosa (“Way of the Cross”), the path taken by Jesus in Jerusalem from condemnation, to crusifiction, to burial. 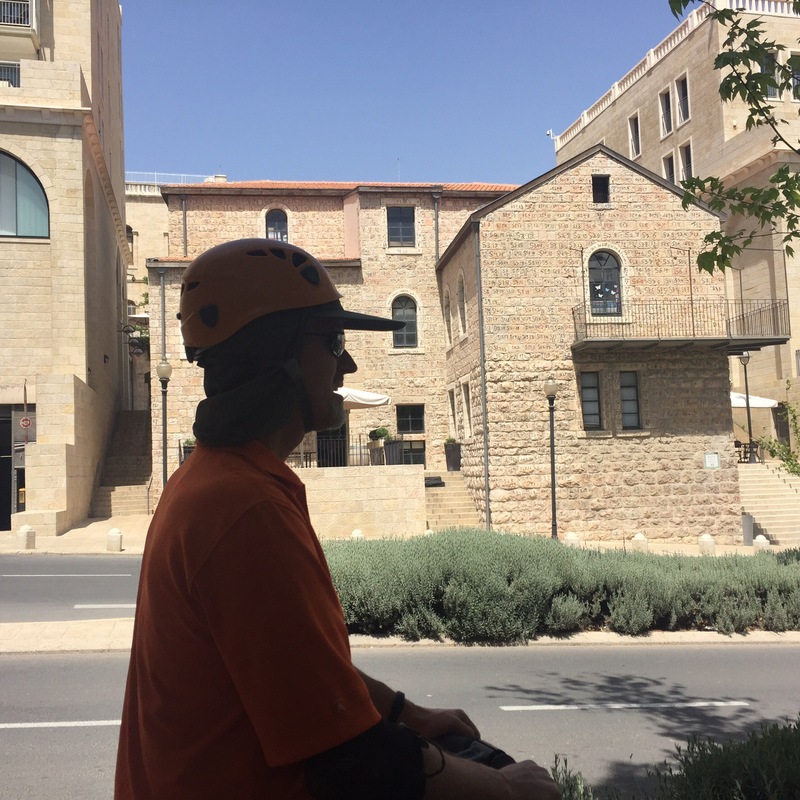 We entered the Old City at the “Zion” gate where there is a single building that houses a synagogue on the ground floor, an Armenian Church on the second floor (which claims the Last Supper was held there) and a Mosque Minaret on the roof. Now for a political interlude. It’s important to remember at this time that a mere 67 years ago, when Jordan took the Old City of Jerusalum in 1948 after Israel was invaded immediately after it was granted Independence by the UN, Jordan destroyed all of the Jewish synagogues and homes and expelled all the Jews who live there and in East Jerusalem. 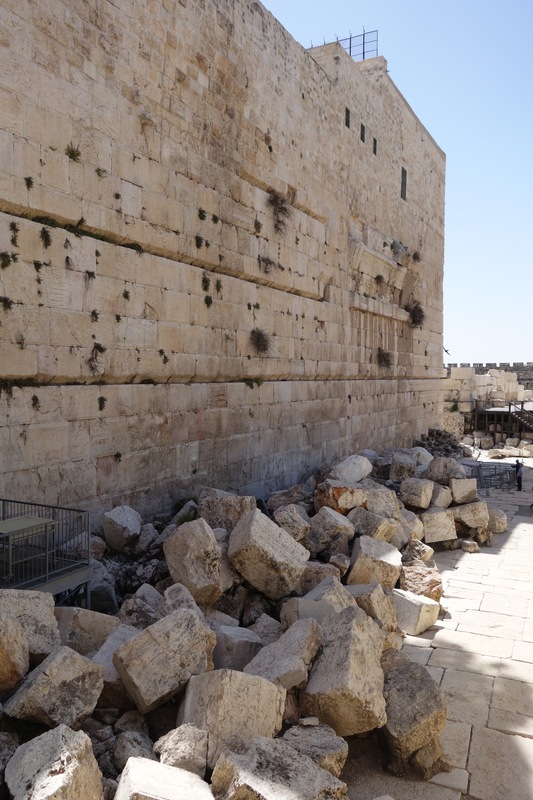 Israeli Jews were forbidden to enter the Old City for 19 years, when Israel reclaimed the Old City and East Jerusalem as part of the Six Day War in 1967. 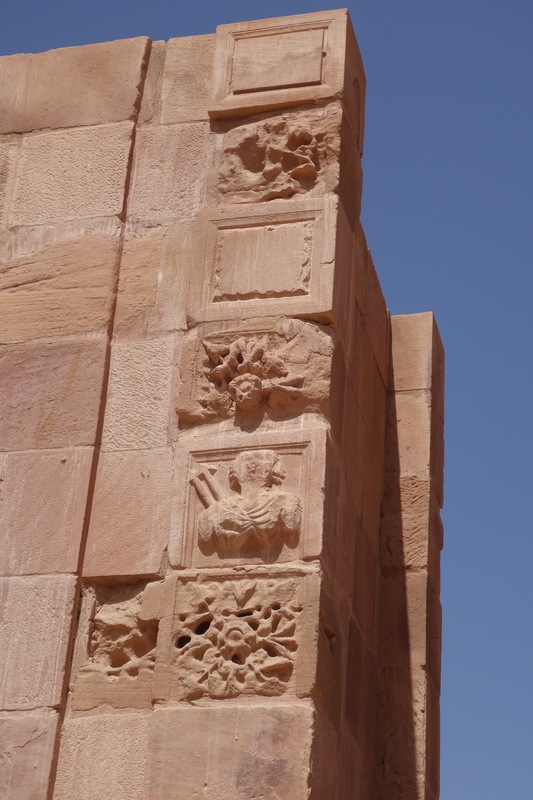 Did Israel then expel the Muslims and destroy all of the Islamic religious sites? Of course not. Although Israel has controlled all of Jerusalem, including the Old City, since 1967, all religions are respected. And even though Muslums do not allow non-Muslims to visit the key Muslim sites (the Dome of the Rock and the Al-Aqsa Mosque) even though they are built on top of the rubble of the ancient Jewish Temple that once stood on the same spot, Muslims are free to visit the Jewish holy sites, and do so every day. It was only 5 years ago the the main Synagogue in Jerusalem, destroyed by the Jordanians in 1948, was finally re-built. Under the circumstances, it’s not surprising that most Israelis aren’t interested in “sharing” Jerusalem with Palestinians, many of whom helped the Jordanians expel the Jews and destroy the Jewish quarter of the Old City in 1948. Can you imagine if Canadians came to NYC 67 years ago and destroyed all the synagogues and killed or expelled all the Jews from Manhatten? After finally winning back Manhatten 19 years later, would we trust them today, if they “promised” to be good this time even while they continued to preach that the only good Jew is a dead Jew? The question answers itself. 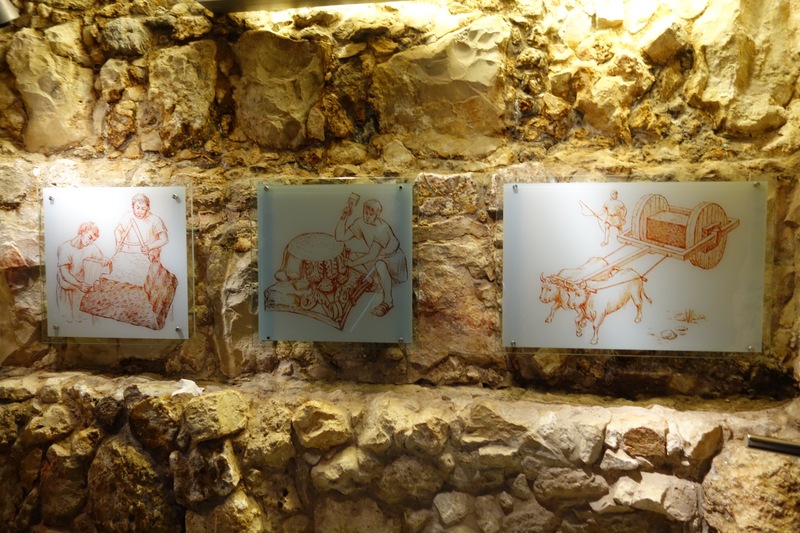 Now back to the Via Dolorosa ( also called the “Stations of the Cross”). 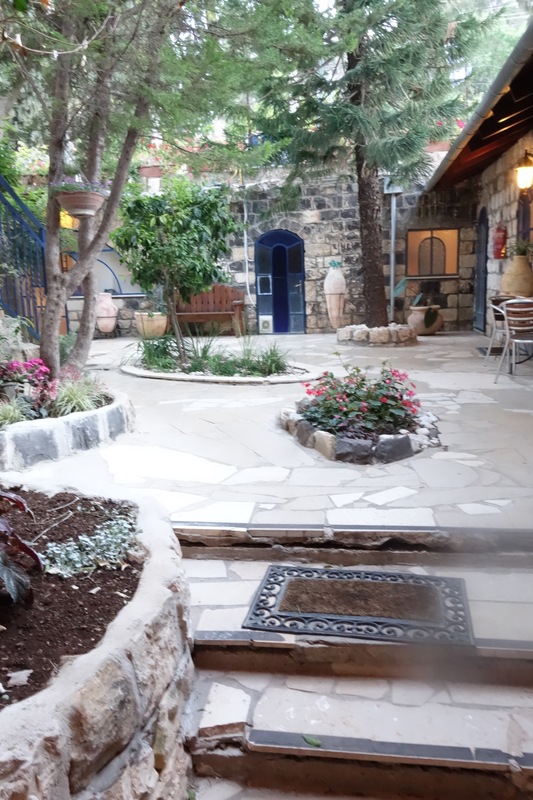 At station 1 (where Jesus was condemned by Pontiius Pilate), there is a courtyard and a small chapel. At station 2 (where Jesus was given the cross to carry to his own crucification) we ran into an Armenian shop owner who lives in peace and harmony with the Muslim elementary school upstairs. He brought us through the school to an upper courtyard with a beautiful view of the Dome of the Rock (which is sacred to Jews, Christians and Muslims as the place where Abraham proved his faith to God by his willingness to sacrifice his son Issac; and again to Muslims as the place from which Allah, in a dream, may have ascended to Heaven to receive the Koran). We then spent time with the Armenian merchant in his shop (the “Palace”) and made a purchase. 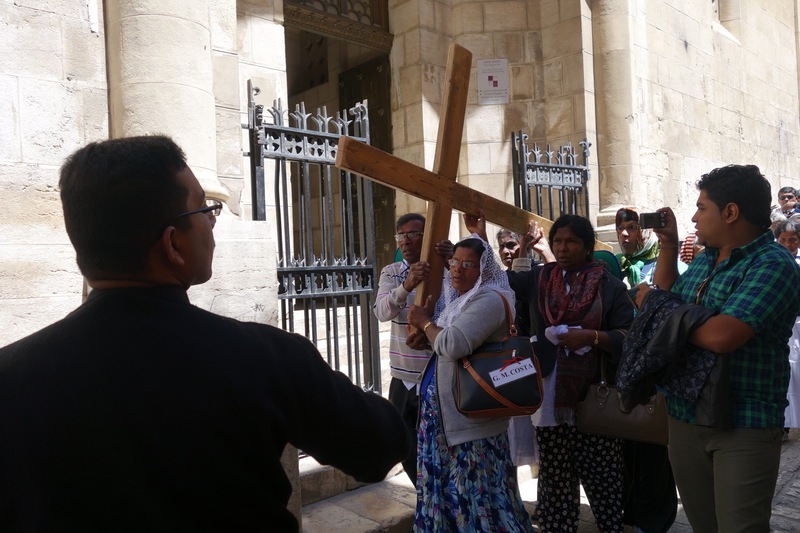 Although many of the 14 stations of the cross are based on tradition and not biblical text, all of the stations are followed by most groups of Christian pilgrims. Some groups gather, carry a cross and pray and sing while making the trek. 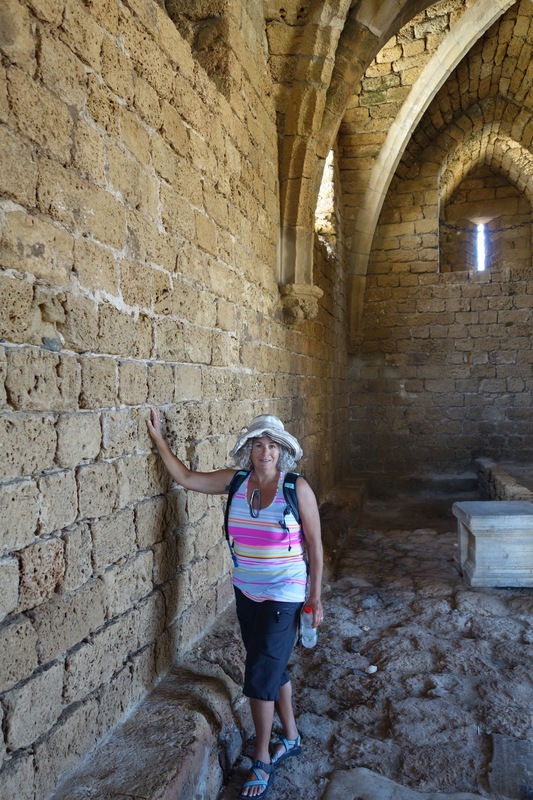 Ari did a great job of leading us and sharing the history and perspective of each of the stations until we reached the final stages which are all located within the Church of the Holy Sepulcher. 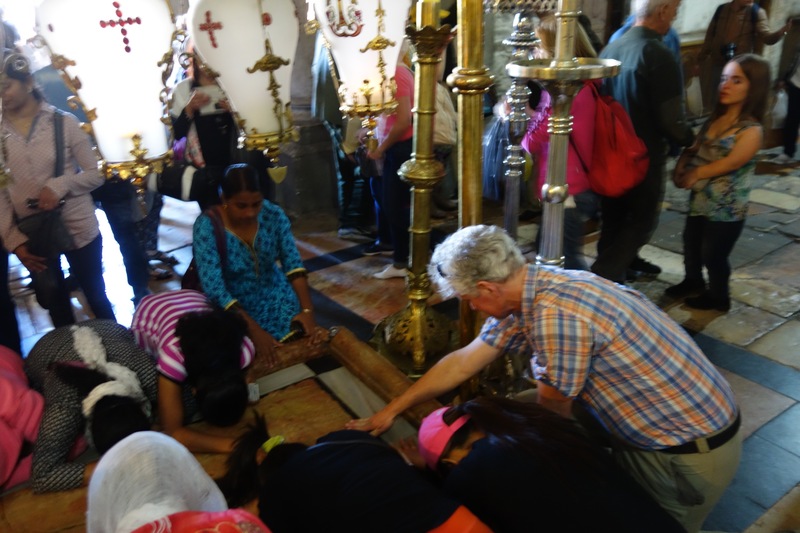 Jim even got to touch and pray at the place where, according to centuries old legend, Jesus was laid to rest on a flat stone following the crucifixion. 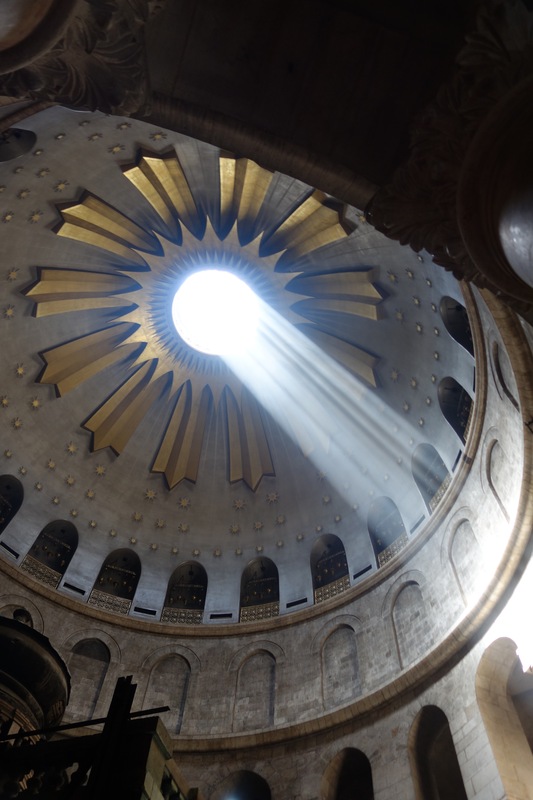 As we looked above the final station (the tomb of Jesus), sunlight was streaming in the oculus at the top of the domed ceiling. 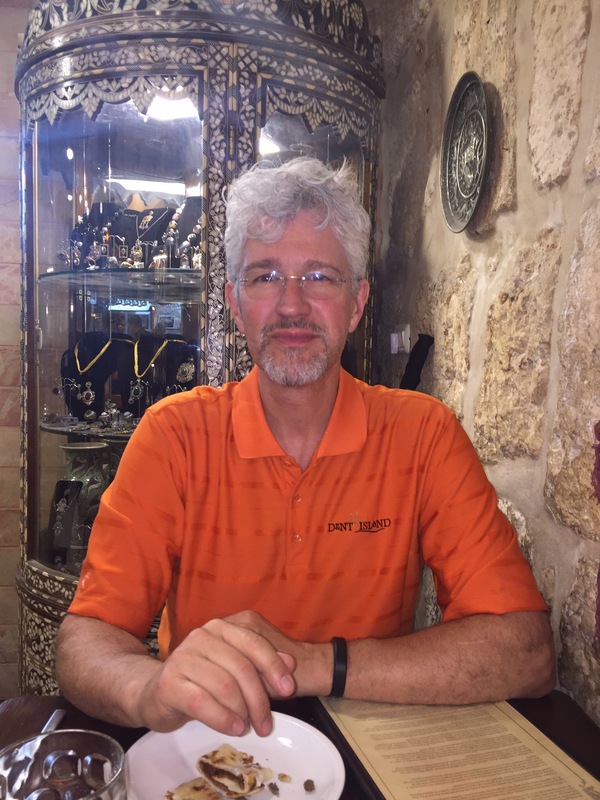 We ended our tour at the Jaffa gate, and then decided to leave Old City to find a quiet restaurant. Choices are limited on the Sabbath in Jerusalem, but we lucked into a table at Mona, a lovely restaurant near downtown with yummy food. The cold weather has finally left Jerusalem so it as warm enough to watch the sunset from the hotel’s 3rd floor sundeck. 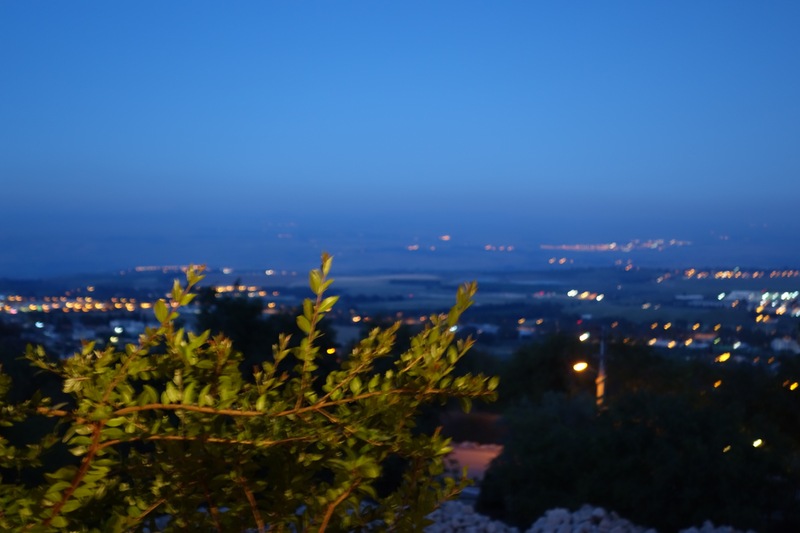 A few miles away, near the Mount of Olives, we heard gun fire and saw black smoke. No one seemed to notice or care. 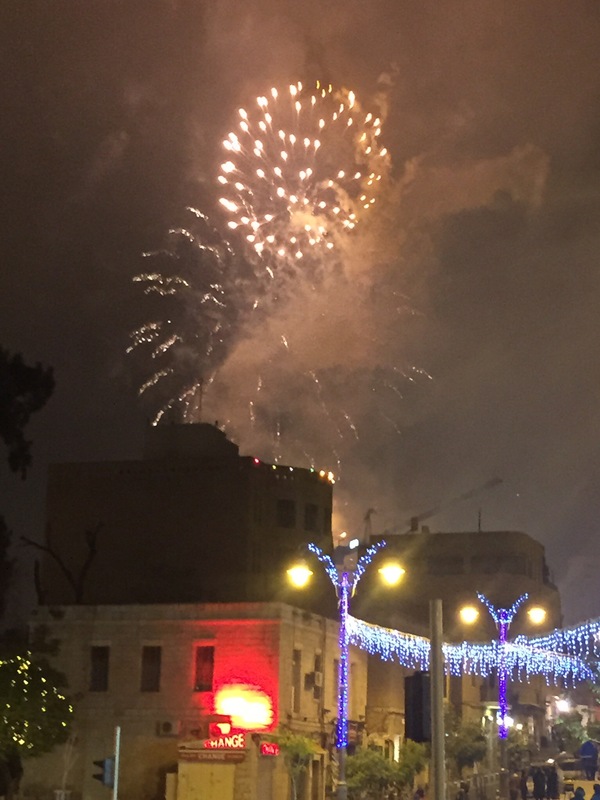 But we learned today that there were three violent incidents around the city culminating with Molotov cocktails thrown by terrorists at Israeli police cars at the Mount of Olives (which is the hill directly east of the Old City). 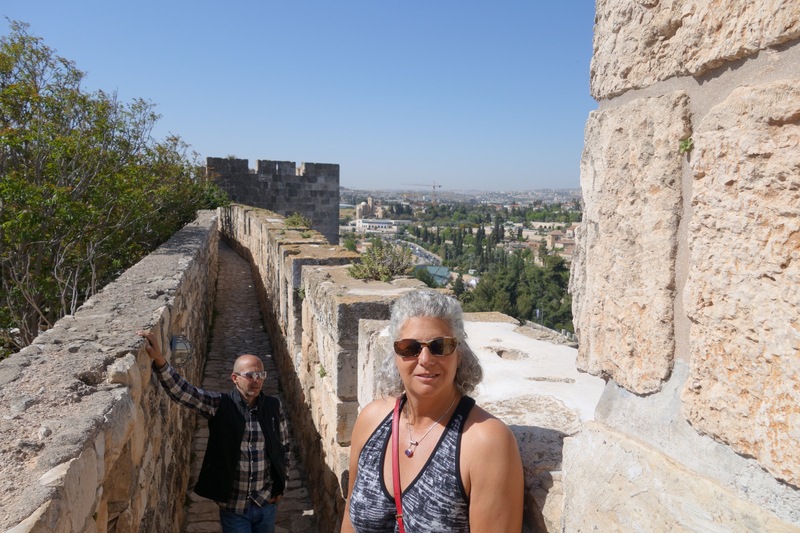 So today we had to skip our tour of the Christian shrines on the Mount of Olives, and instead went Immediatley to the “Ramparts Walk” high along the top of the outer walls of the Old City. This is something most people don’t do, but I highly recommend it. It was just us and a few small church groups (including a very sweet Danish church group reading from the Bible, singing hymns and trumpeting with shofars). 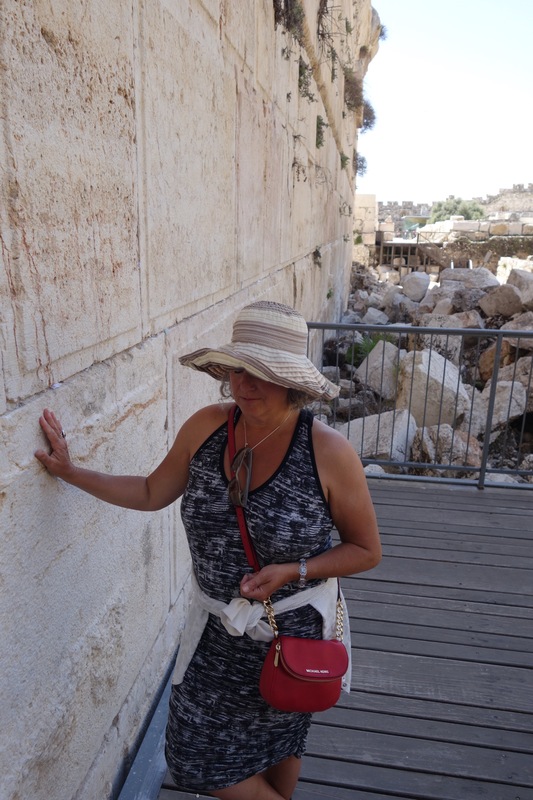 From there we explored the one part of the Western Wall where there is no gender segregation so Jim and I could visit it together. It was peaceful and virtually empty. On our way there, we passed a joyful Bar Mitzvah procession complete with dancing and music. I wish I heard more music around the Old City. 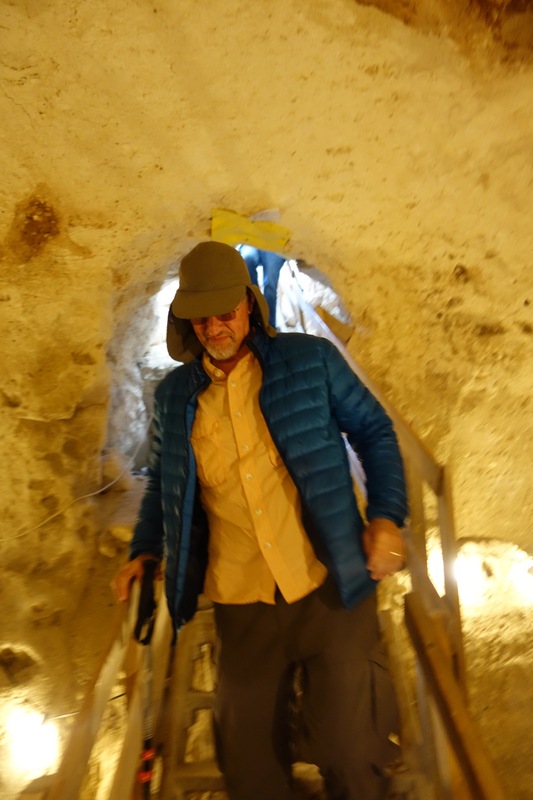 We continued our historical exploration in the ancient “City of David” which lies below and just outside the “more modern” Old City. 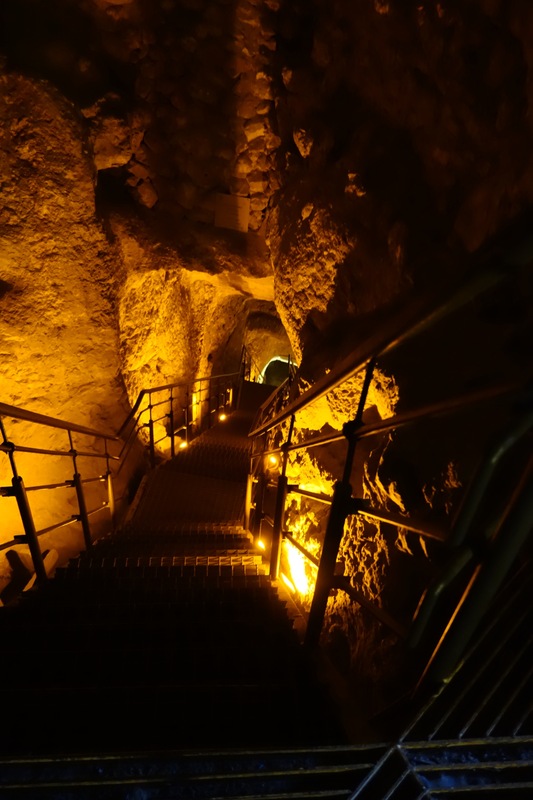 This is a huge archaeological site that exposed the original, underground spring that has provided Jerusalem with drinking water for over 3,000 years. It’s an amazing place. Other than groups of local students there are very few tourists. 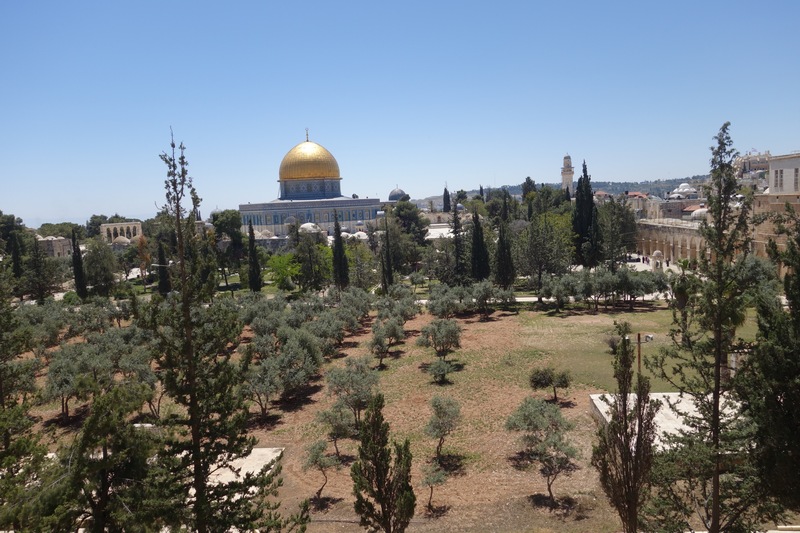 From the bottom of the City of David you look out and up at the Mount of Olives and the now Arab area of East Jerusalem. 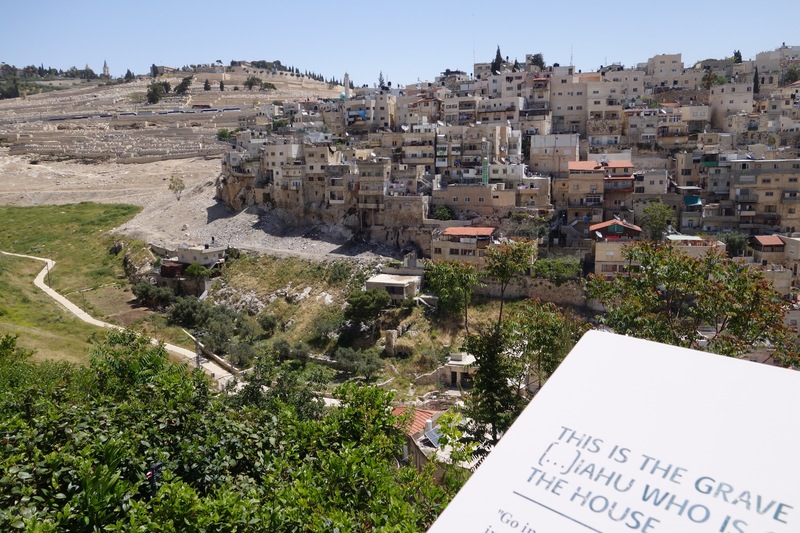 Unfortunately, almost all of the homes in East Jerusalem were built on top of ancient Jewish tombs during the Jordanian occupation of 1948-1967. 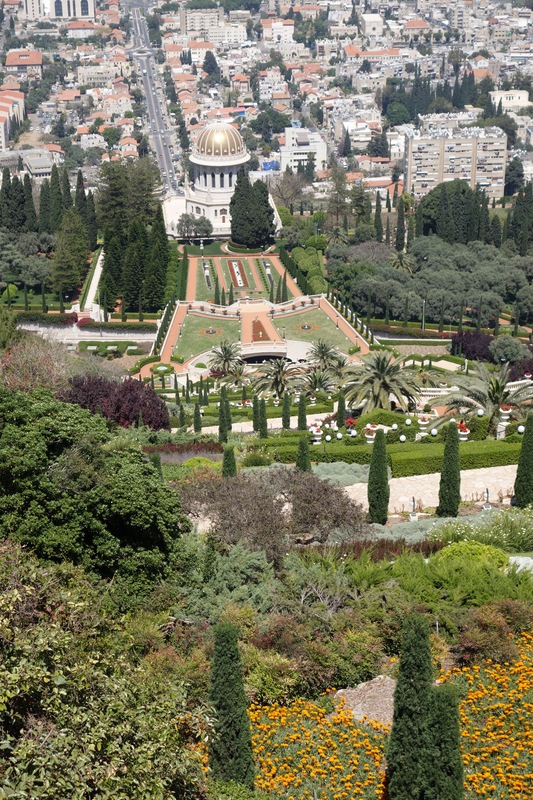 In a just world this area would be returned and the sanctity of the ancient Jewish tombs reestablished within a park. 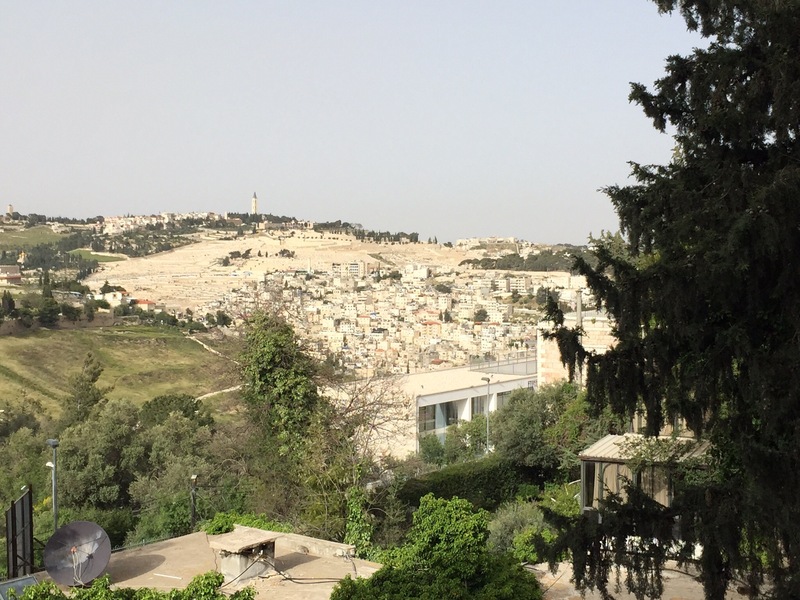 This could be done by building new apartments elsewhere in East Jerusalem for the Arabs currently living on the lower slopes of the Mount of Olives. 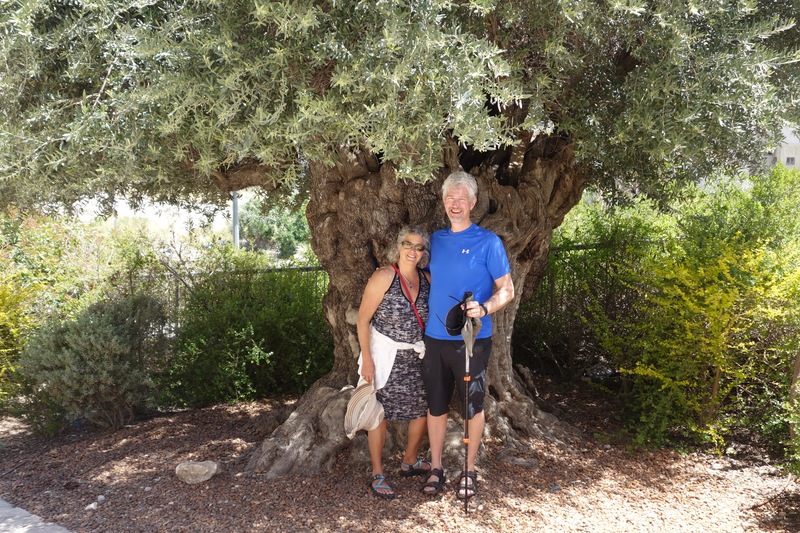 We even passed Olive trees that were over 1000 years old. 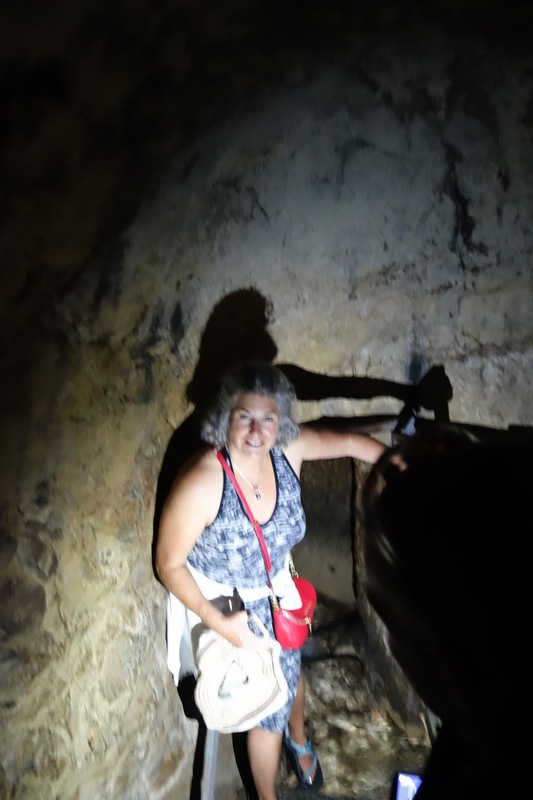 From the amazing tour of the ancient spring that was the life blood of the City of David, we walked underground back to the Old City through a narrow and now dry aqueduct built by Herod around 20 BC at the same time he built the Second Temple. From underground you can see the giant stones that fell onto the aqueduct during the destruction of The Second Temple by the Romans in 70 AD. The aqueduct comes out close to where we began our tour near the original base of the Western Wall of the Second Temple. Some of these stones are mammoth. We ended our tour for the day in the City of David Musuem, next to the Western Wall, which has some good videos and displays. By this point we were exhausted and starving. 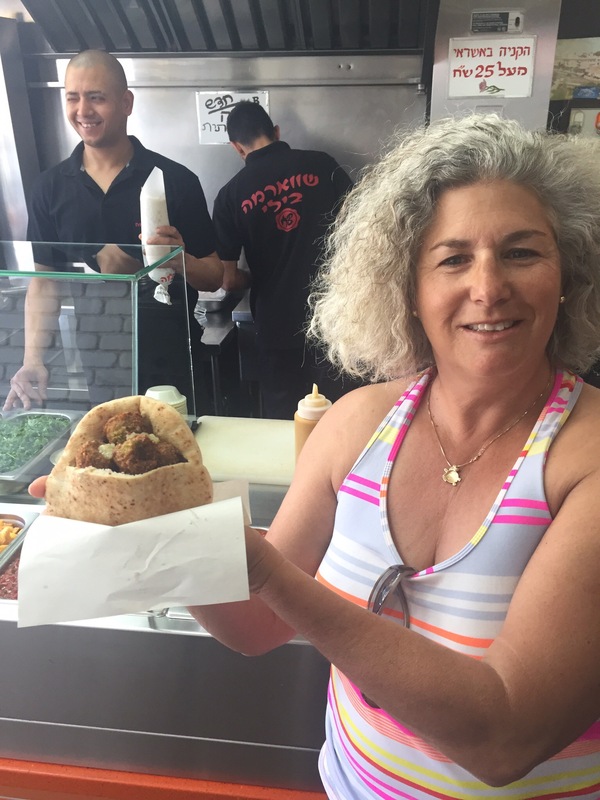 I chose Falafel and the guys chose Shwarma from a great little restaurant in the Jewish Quarter. Once back in our magic van we drove briefly out to a view overlook of Bethlehem (which is just a few miles from Jerusalem) and the security wall protecting Jerusalem from snipers and suicide bombers. This part of East Jerusalem is considered an “illegal” settlement according to the UN, which is ridiculous. Our tour of Jerusalem is now over. 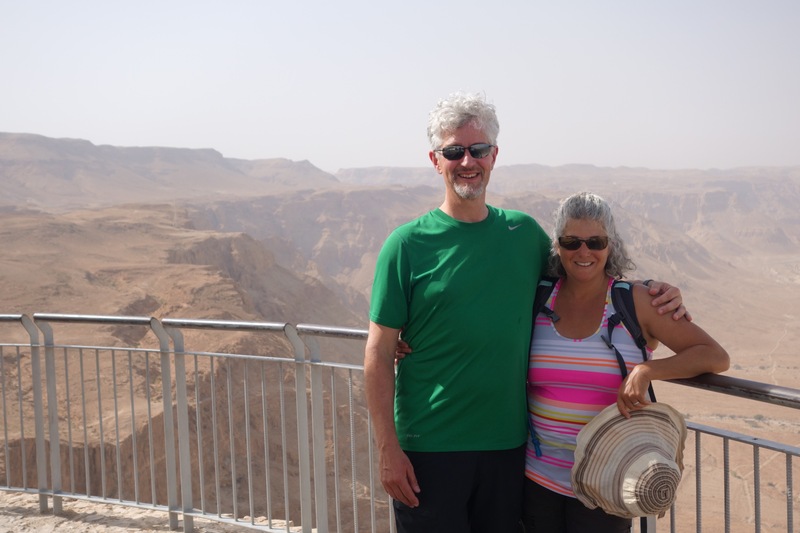 Tomorrow we head out for a long day trip to visit the Dead Sea and Masada. Yesterday we tapped into our inner archaeologists. Ari picked us up and we drove about an hour through the beautiful countryside southwest of Jerusalem. Until relatively recently , this was an unsafe area because of terrorist attacks (starting as early as the 1920’s) so it was planted with trees and is now mostly park land. The original trees were not native, but they grew tall and although they didn’t reproduce they created shade for the natural forest to regrow. A true rebirth of the desert. This is a picture of the width of Israel in this area, 20 miles. At its widest, Israel is 45 miles wide. At its narrowest, only 6. We made a quick stop at another ruin, which was particularly beautiful because of the clouds and the sky. We drove by the area where David had his epic battle with Goliath. We stopped in the rolling hills nearby where there was once a small, walled city. 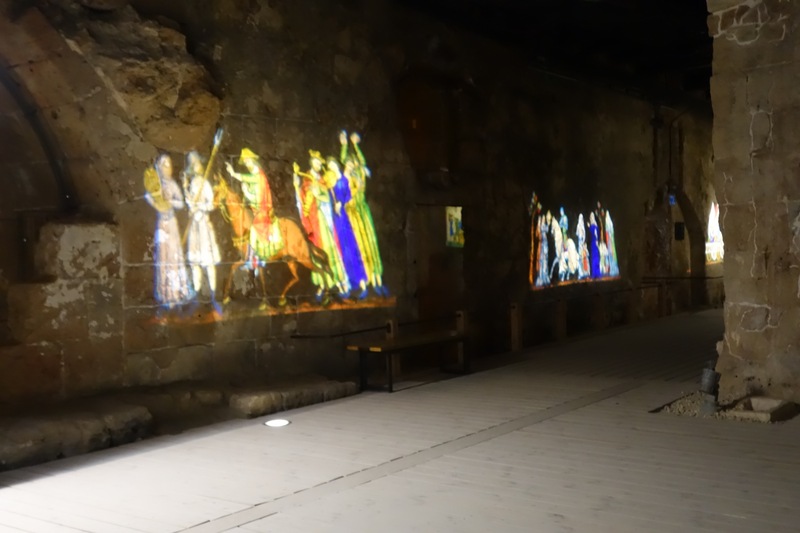 Today, the city walls & structures are gone, but the elaborate basements (hand-carved caves) that were under the buildings remain — over 500 — and they are filled with interesting stuff. 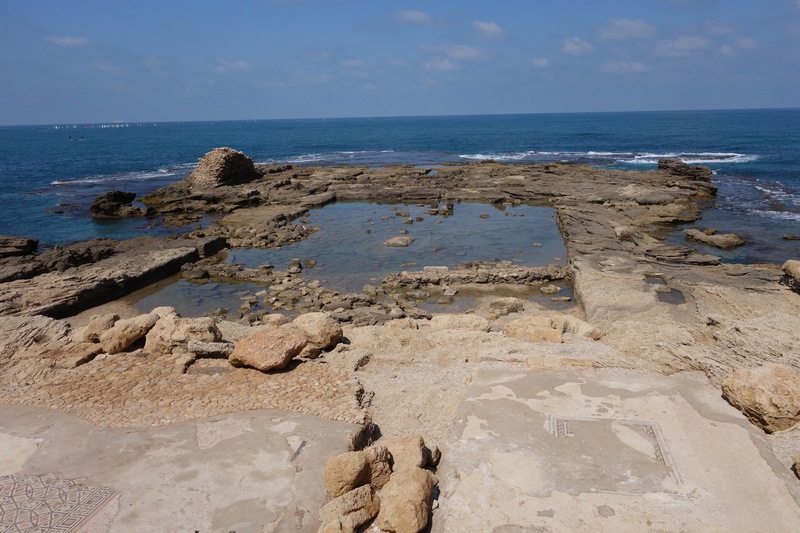 This is area is now known as the archaeological excavation at Tel Maresha, Israel. 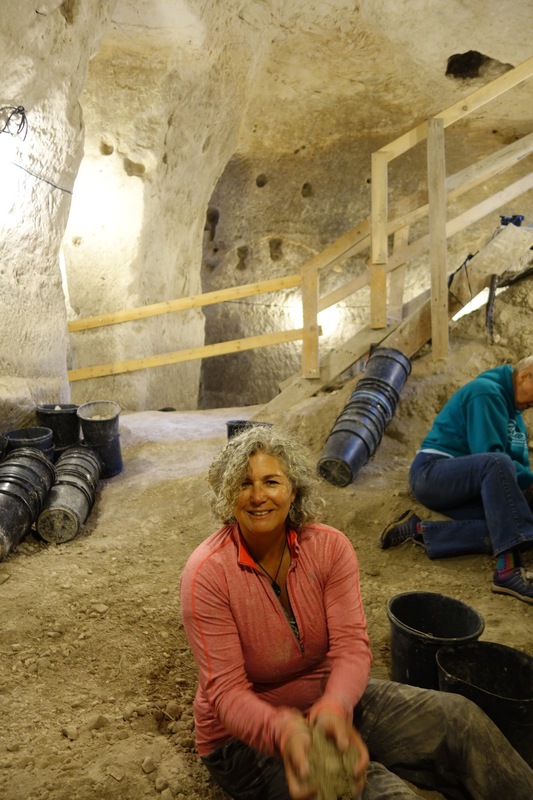 Most finds date back to 200 BCE, 2200 years ago! 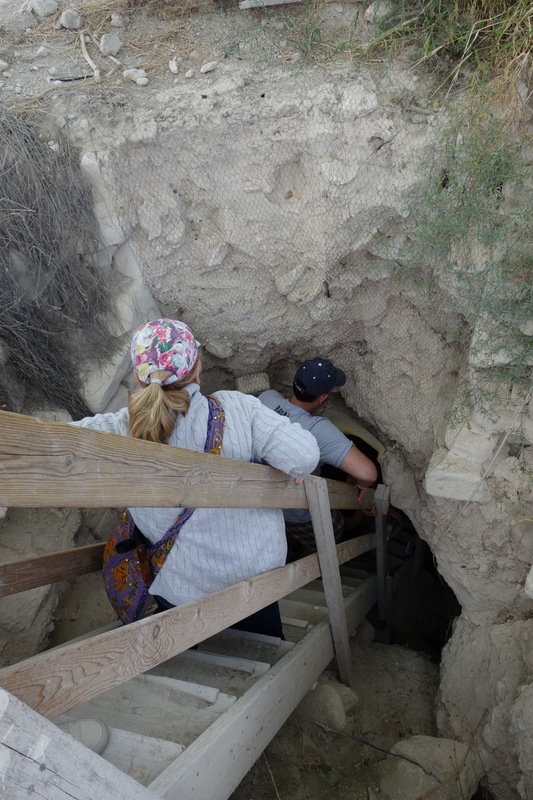 This is where Herod’s Grandfather (an Edomite) chose to become a Jew when the Macabees conquered the city and gave everyone the choice of assimilating or leaving. 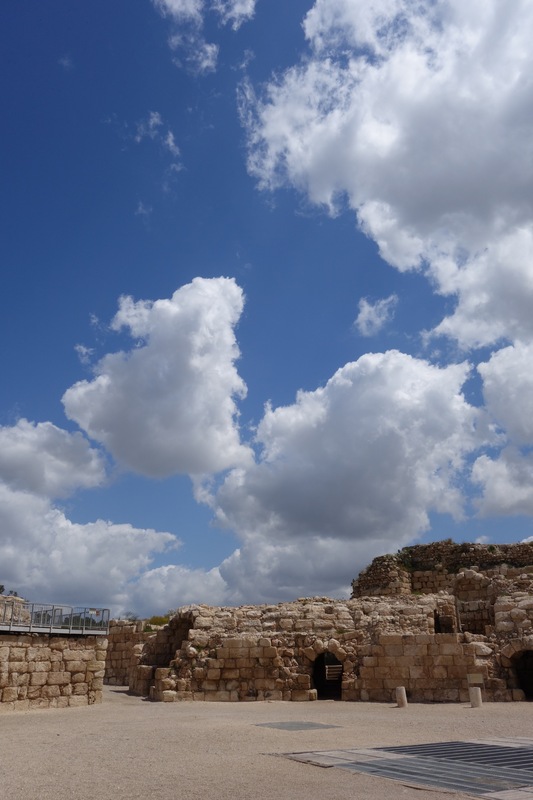 It is also the place where Herod was probably born. The ground here is all chalk stone (a kind of limestone). And when you carve blocks of it to build your house, you get a basement at no extra charge! 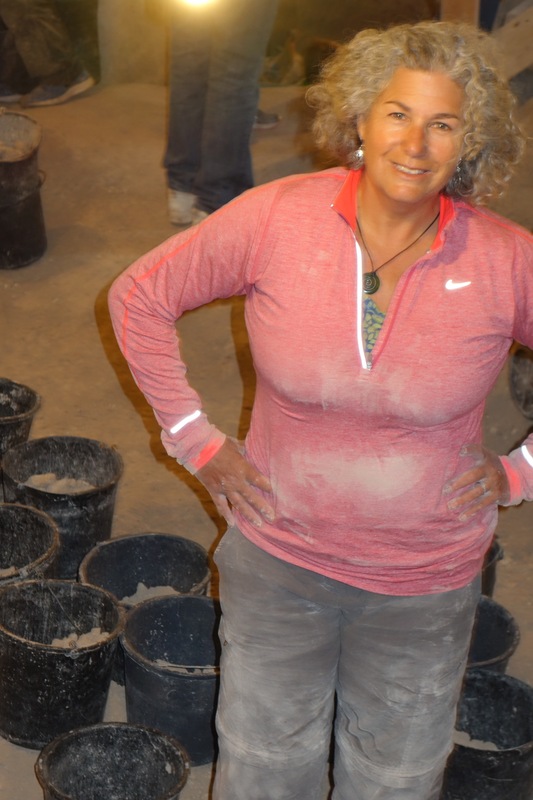 Each house, as a result, had a mini quarry in their basements which they used for water storage, food storage, and pressing olives into olive oil. Chalk Stone is amazing. It’s easy to carve, it holds water, and you can also quarry large stones from it. 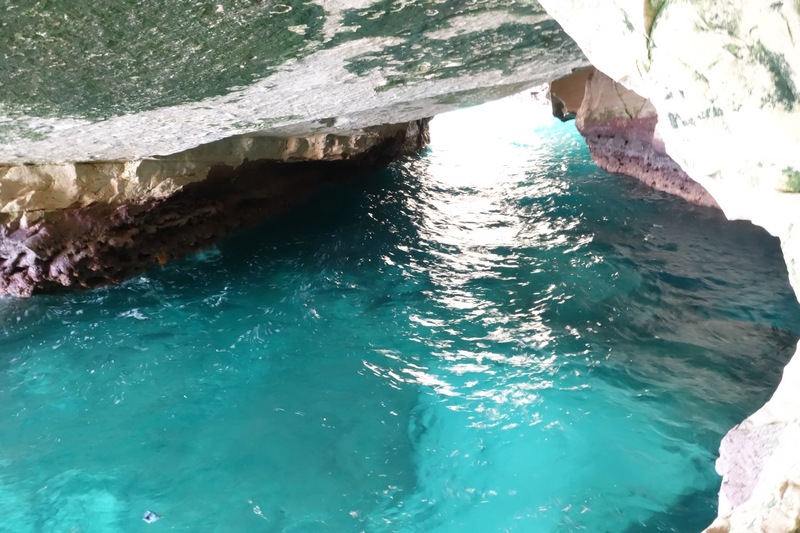 The series of caves is now a UNESCO protected site. 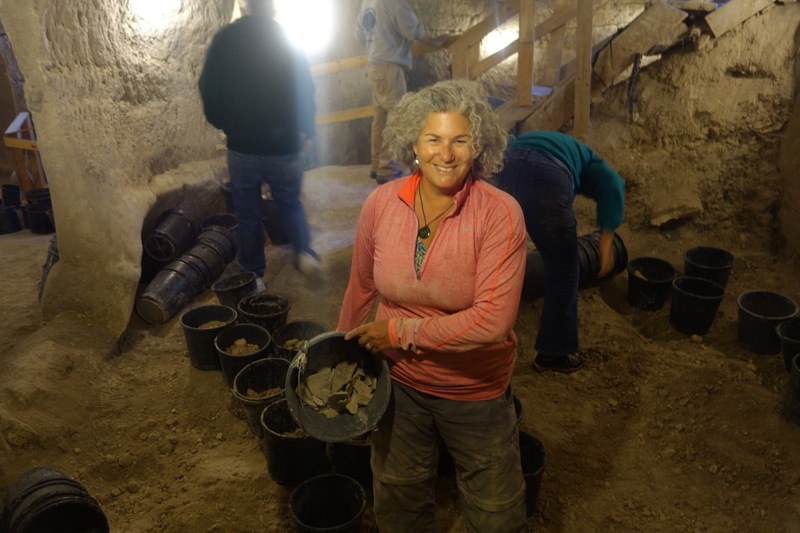 The archaeologists here had a brilliant idea of charging groups like ours to help dig the dirt out of the caves and look for artifacts. Because the sites are a really like ancient garbage dumps and not stratified chronologically they don’t need experts to dig. Which is a good thing because there is a lot of digging to be done. I loved it! I could do it once a week. I got right Into it with my hands. 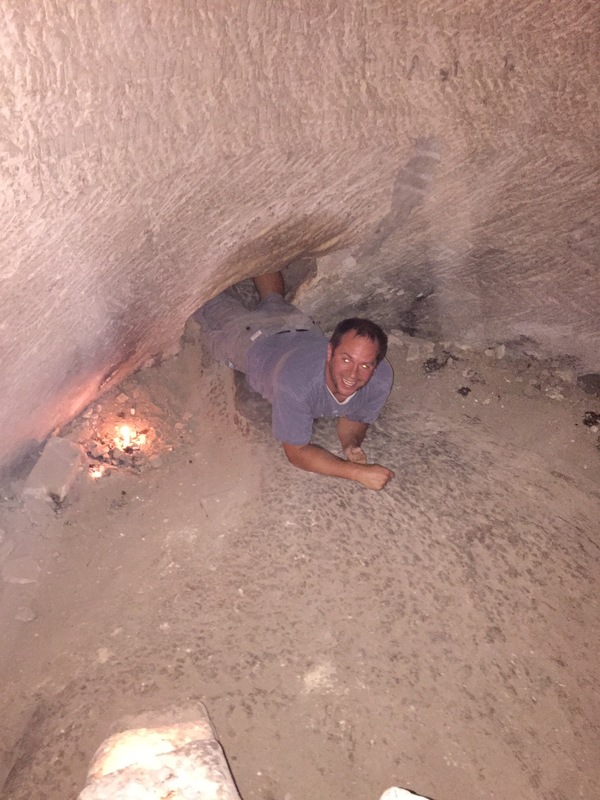 Jim and I were able to dig down to some original flooring which means they have probably reached the bottom of this particular cave. The archeologists was pretty excited. We got to stand where no one has stood for 2000 years. I could have dug longer. We found pottery, shells and bones. After the digging comes the schlepping and we all did a bucket brigade to get the dirt up the steps to the surface. Finally, we did the the sifting where you sift through the dirt in the daylight. This is actually where you find most of the cool little things like shells and flint. We found shells, flint and old charcoal from a fire. It truly is touching history. The final step is done by the experts where they wash and analyze the pieces, looking for writing and other important information. 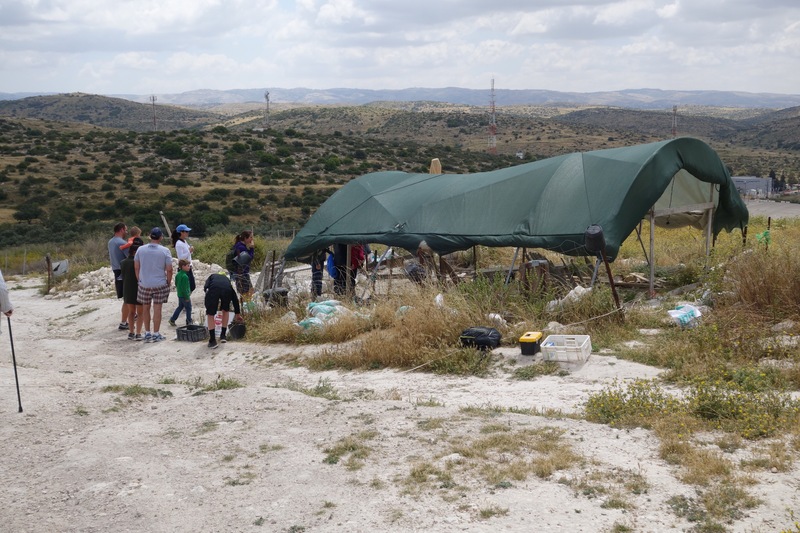 Then we split up and some people went to a totally excavated site while others went to a site where the excavation is just beginning. I choose the site where we had to crawl and Jim choose the other. My area was lit with candles and was a kick to go through. A family with young children joined me. We ended our day back in Jerusalem for an early meal before the sabbath and a good shower. 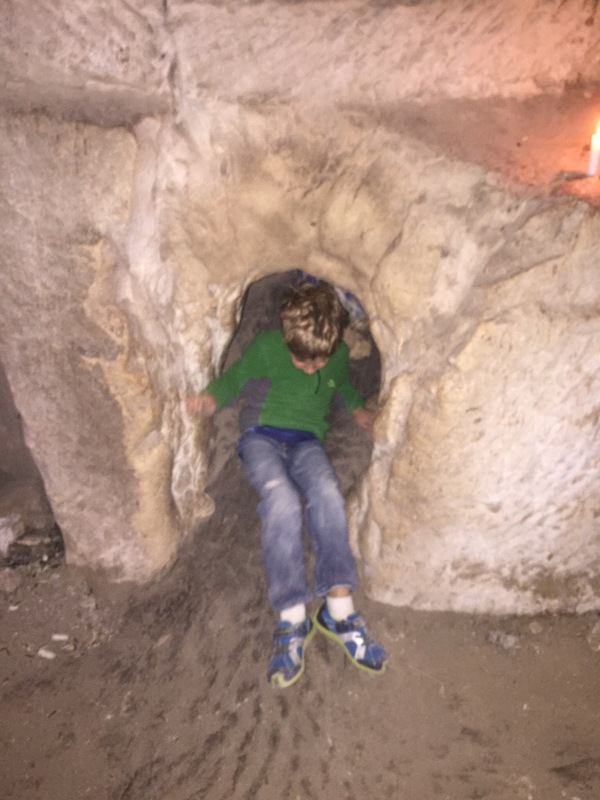 At first glance we thought that a week in Jerusalem might be too much. Wrong. It’s been so nice having time to wander the city on these last three days and experience it both as a tourist but also as a part of the community. Yesterday, after seeing our friend Elie Pierpz again during breakfast, we headed out for a tour of the Menachem Begin Museum. Right before the tour there was another Remembrance Day Siren at 11 AM. Once again, people paused throughout Israel for two minutes. Longer ceremonies are also held throughout the day. We had a small ceremony at the museum before our tour began. As is expected in a “Presidential-style” museum we got a very specific story about the personal and political life of the leader. But given what we learned earlier this week about the 1973 Yom Kippur War, it was fascinating to follow the post-war story about the first time lsrael’s Labor Party lost a national election since Independence in 1948, and the center-right Likud Party’s first win. to his imprisonment by Russia in Lithuania (where he had fled to escape the Nazis), to his journey to Israel during WW2 as part of the Free Poland Army (ironically supported by Russia, which had invaded Poland at the same time as the Nazis, but then was itself invaded by the Nazis 2 years later), and eventually his leadership of the militant “Etzel” Israeli Independence Movement. His group was responsible for the attacks against the British occupation of Israel prior to its Independence, including the bombing of the King David Hotel. His election as Prime Minister of Israel followed his 29 years in various minority parties and ultimately led to the Peace Agreement with Egypt’s President Sadat. They both shared the 1978 Nobel Peace Prize. Although he lived very modestly, he donated his $50,000 cash prize to help disadvantaged Israelis attend college. How modestly did he live? 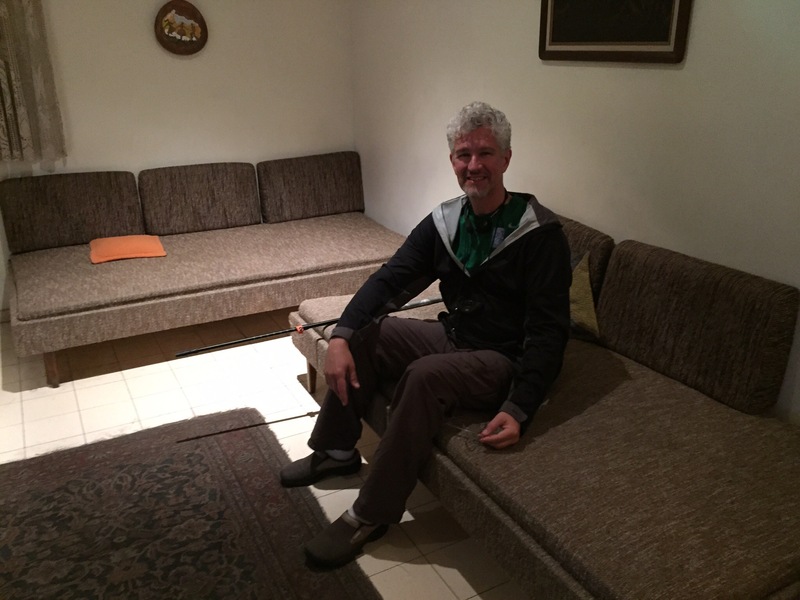 in part of the museum we got to sit on the two very modest living room couches that he and his wife pushed together to use as their bed after their three children went to bed in the only bedroom in their one bedroom apartment, which they rented, not owned, and where they lived most of their lives. He was responsible for convincing the Russians to eventually allow hundreds of thousands of Jews to migrate to Israel, as well as the “lost tribe” of African Jews from Ethiopia. 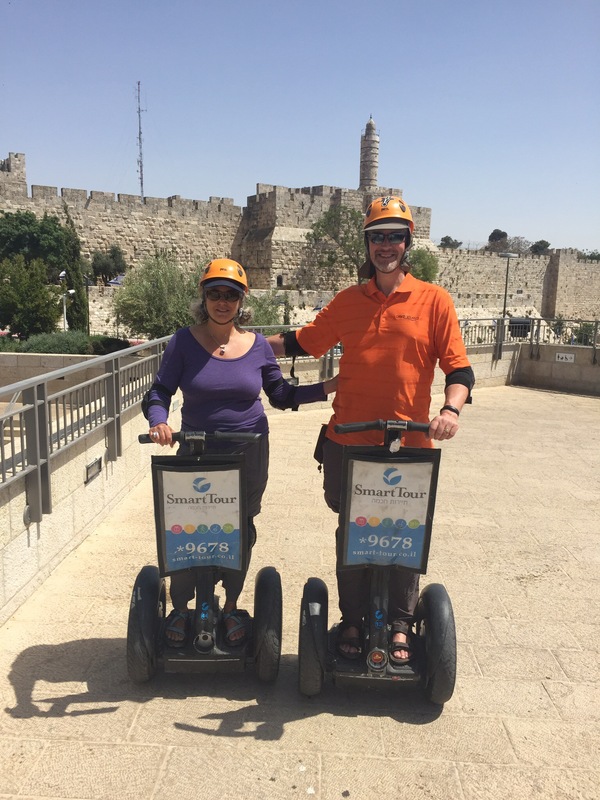 After finishing our tour of the museum, we took another Segway tour on the new Promenade Park with its fabulous views of the new and Old City. This is also where you can see the big wall separating the West Bank from Jerusalem and Israel. 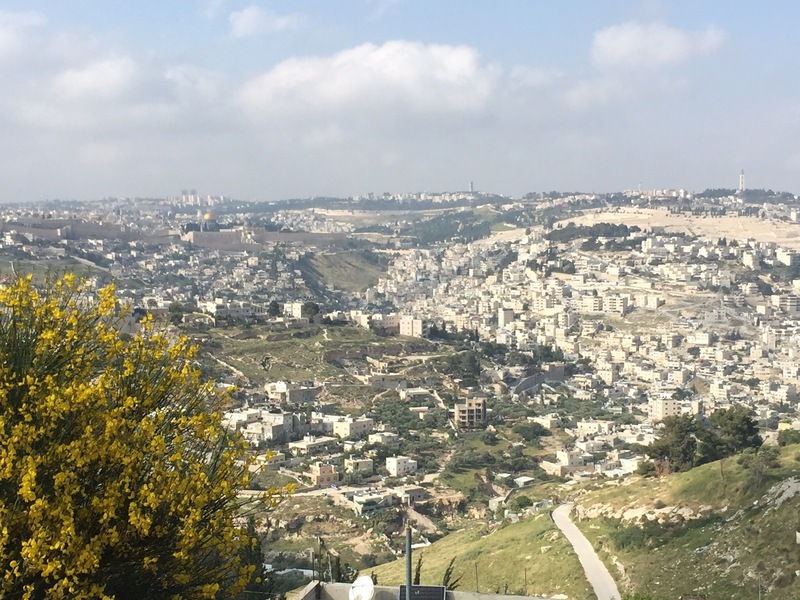 You can also see the large UN facility (on a very nice piece of view property) where the UN still monitors the 1948 War’s cease-fire line (the “green line” that used to divide Jerusalem Into its Israeli & Jordanian halves). 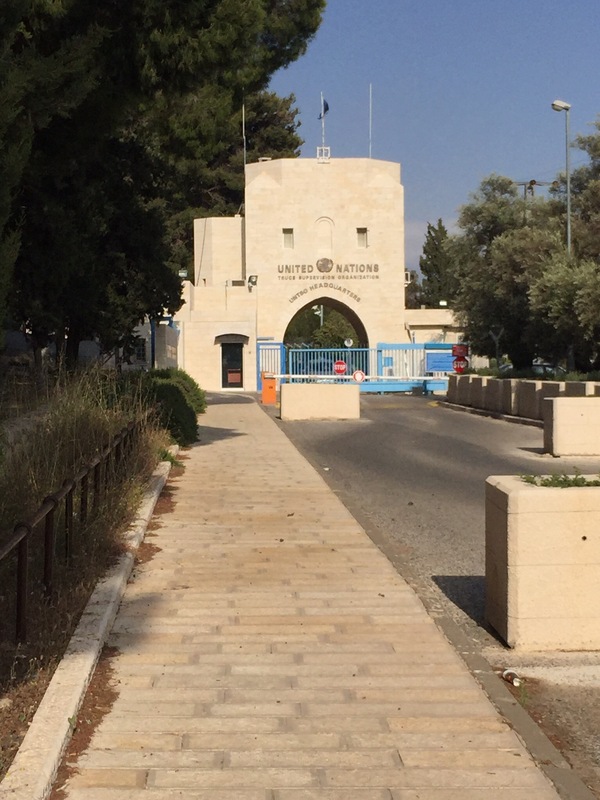 The UN is still there, in the same place, even though the border with Jordan moved 10 miles east to the Jordan River & Dead Sea in 1967 (which later became the official border after the Israeli-Jordanian Peace Treaty more than 20 years ago). Because the USA is the largest funder of the UN, this is an unfortunate example of your Amercan tax dollars being wasted overseas. After resting we headed out to experience the fun and celebration of Israel’s Independence Day (like other Israeli holidays, the holiday begins at sundown, and then continues for 24 hours until sundown on the next day). We had a great time walking around and experiencing the music, the dancing and the joyous celebration. There were fireworks at 10:30 PM and again at midnight and the party went on well into the early morning. Our evening ended much earlier, just after midnight. As the Independence Day holiday continued today, people here usually celebrate in parks with picnics and BBQ’s. But today’s weather was very unusual: it was windy, rainy and cold all day. 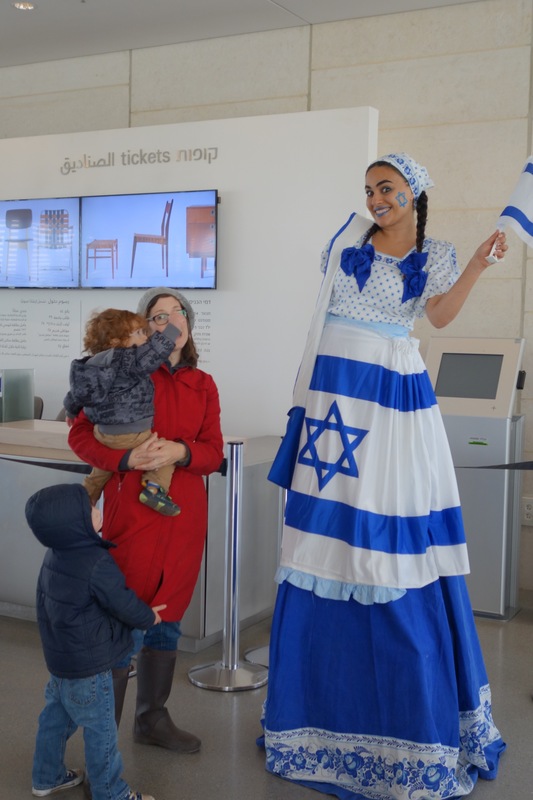 So it felt like almost everyone in Jerusalem had the same idea: visit the huge Israel Museum and enjoy today’s free admission. Although it was crowded it was also fun and we were happy to share the museum with thousands of local families including lots and lots of children. tell you that you have to allow at least 4 hours for the museum and we can tell you now that this is a big underestimate, as we spent 4 hours and barely saw half of the exhibits. Although it was cold and windy we spent almost an hour outside looking at the huge model of ancient Jerusalem before the Romans destroyed it for rebelling in 66 AD. 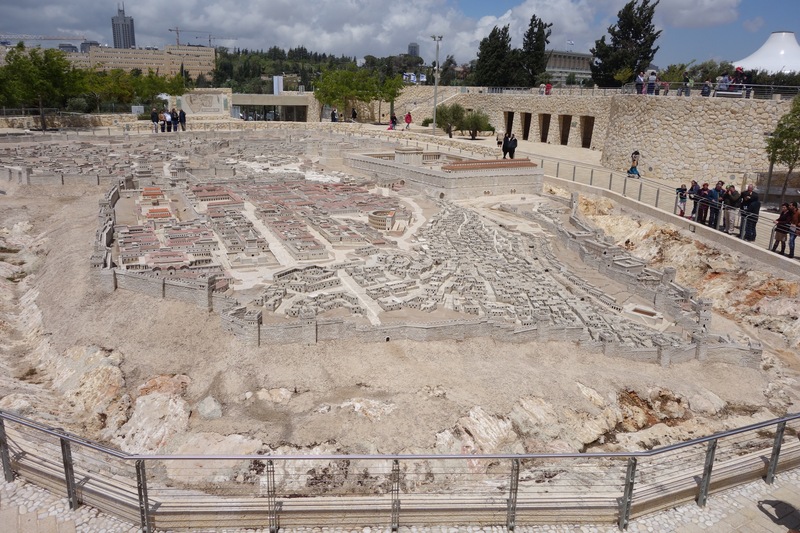 The model, which is almost an acre in size, gives you an incredible overview of this incredible, historic city of the ancient world. 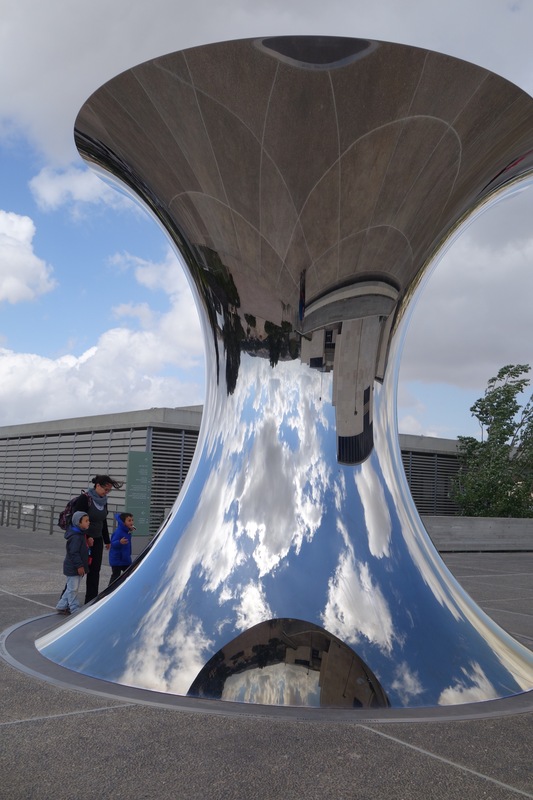 I love the reflection of the clouds in this sculpture. After taking a break to warm up and get a snack we headed to the massive archaeological exhibit. 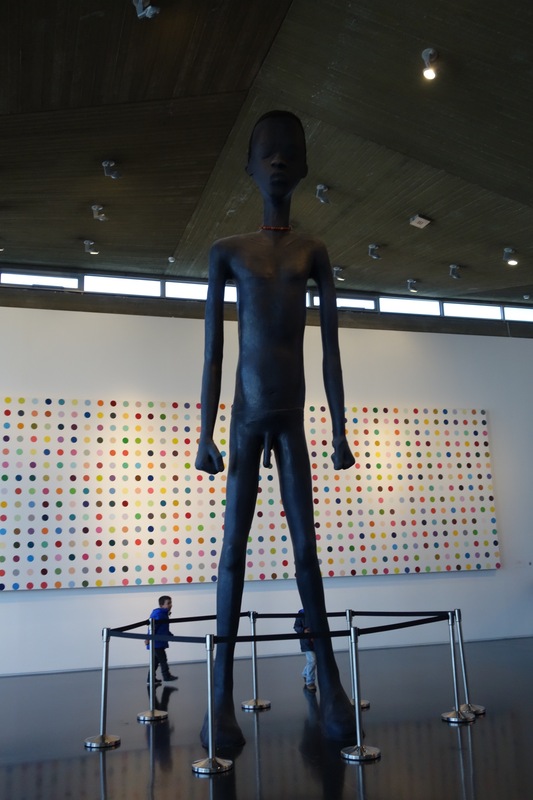 But we wandered into the modern art exhibits and it was so cute watching 2 young boys giggle at this giant statue and his “pee pee” as they called it. We only made it through 4 of the 7 sections of ancient artifacts before my head began to explode with too much information. It begins 10,000 years ago and we only made it to about 200 AD. 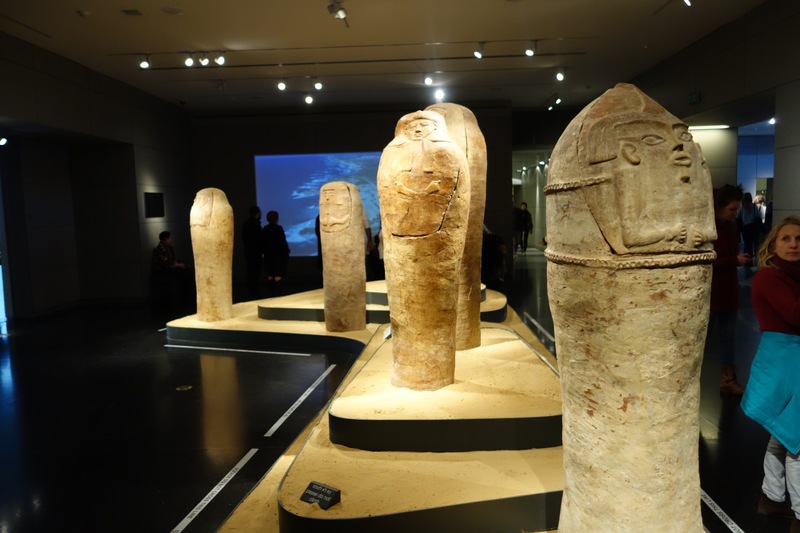 Although we have seen many other antiquities, in other great museums such as the Smithsonian Museum, the British Museum and the Vatican Museum, seeing the Israel Museum here in Jerusalem, having just visited the area and learning the history, created the perfect expiriential learning experience for us. It was very meaningful. Tomorrow we meet up again with our guide Ari. I think we are going to “get dirty” at an archaeological dig. Tonight we are sitting in our hotel room at the Dan Boutique Hotel overlooking old Jersulam. It feels light years away from where we came from yesterday. 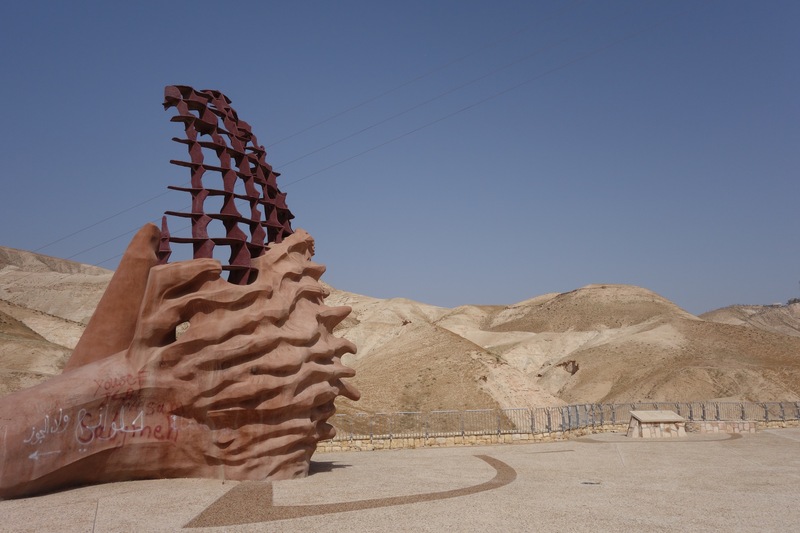 Tonight at 8pm the siren will usher in Israeli Remembrance Day which is immediately followed by Israeli Indepence Day. We are looking forward to experiencing the next 24 hours here. 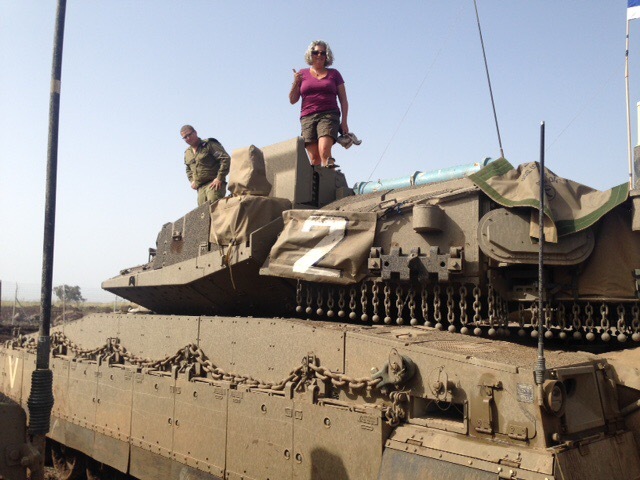 Yesterday, we checked out of our peaceful hillside oasis in the Upper Galilee and headed for a special tour of an army base with an Israeli tank brigade and their equipment.
. Our guide Adam is extending his service after being injured in battle. The soldiers are in base cleaning and repairing the tanks in between deployments. 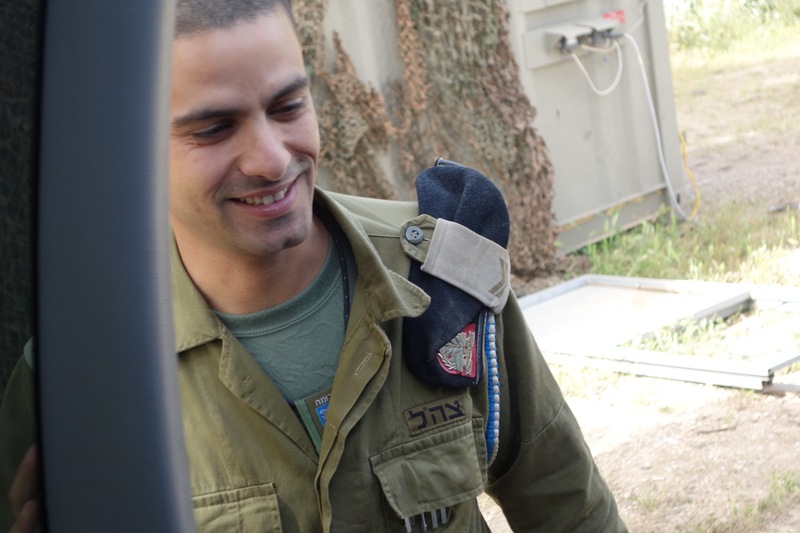 Our guide, Ari is filled with pride as he shares the base, the equipment and the soldiers with us. Now for something completely different. 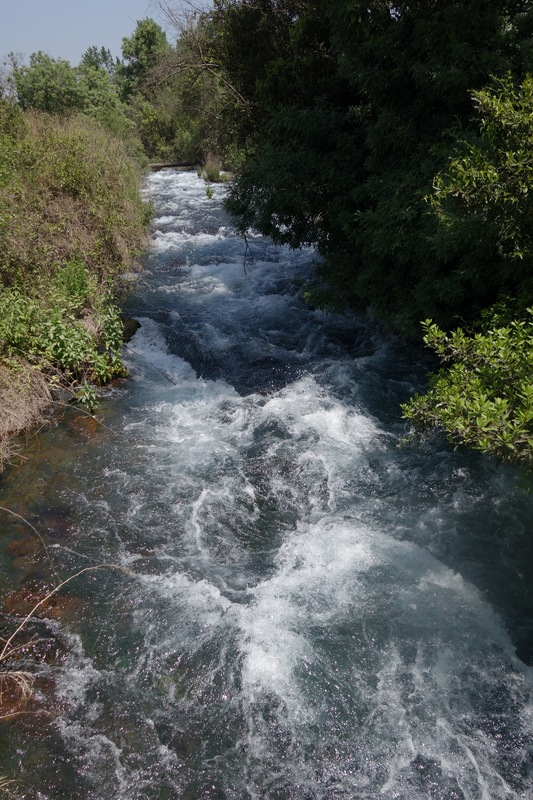 We transition quickly as we drive towards the Sea of Galilee and the spot where Jesus first met Peter. 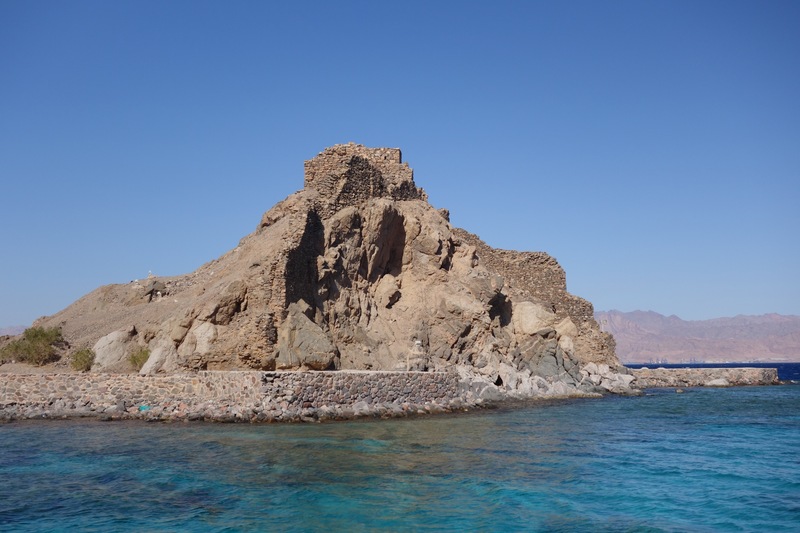 This a fishing village and the archeological site shows what is believed to be Simon’s house. The site was purchased and run by the Catholic Church as are many we will visit. Typical for the area, there is a large historic remain of a large Byzantine Church built much later. 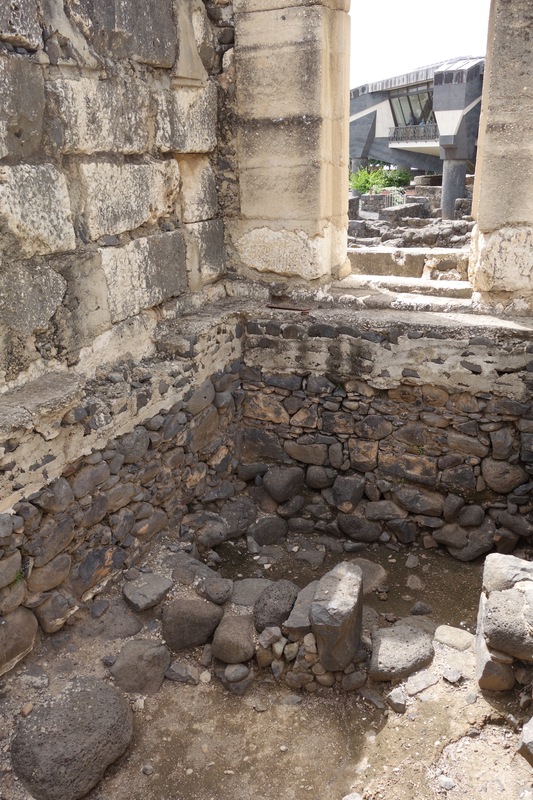 However when the Rabbi Jesus began his preaching it was most likely in a small room in the layer below the “new” building. 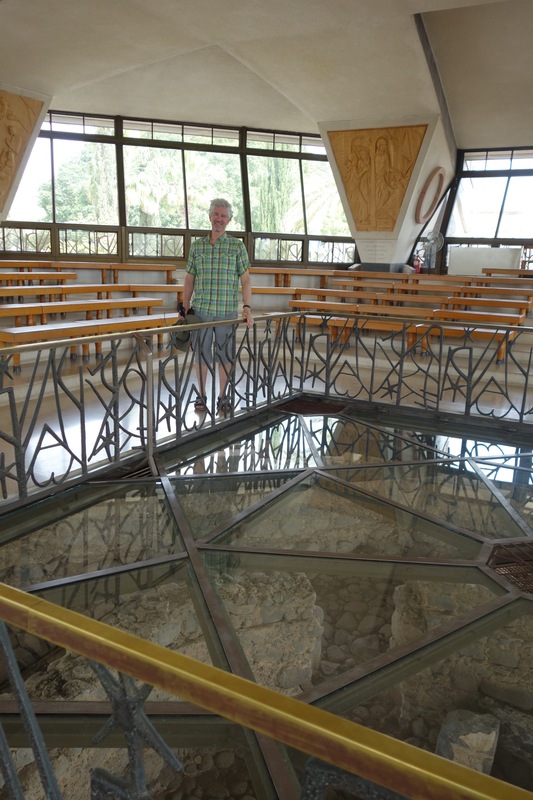 The new, modern Catholic church here is beautifully built above the ancient ruins with the middle of the floor glassed over so the congregation can both see the alter and the remnants of Peter’s lakeside house. From here we drive up the hill a few miles to where Jesus is believed to have delivered his famous Sermon on the Mount. Once again the site is owned by the Catholic Church. The grounds are manicured and modern. But if you look out to the sides at the natural land sloping down to the lake you can more easily imagine Jesus speaking to a large crowd of the faithful who had walked up from the fishing villages along the lakeshore. Back on the manicured gardens, there are small services scattered around the grounds in different languages. 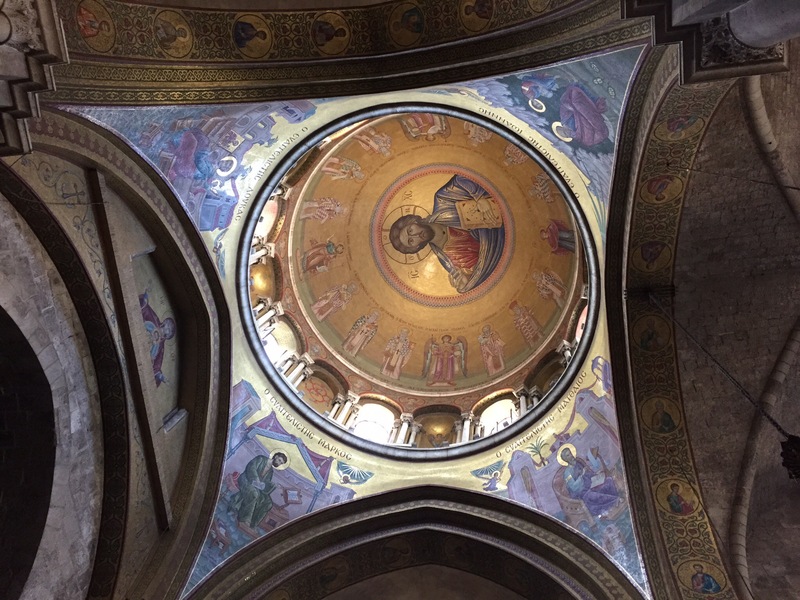 In the largest chapel, visitors from the U.S. were singing beautiful hymns. It was very peaceful. People were visiting from all over the world. 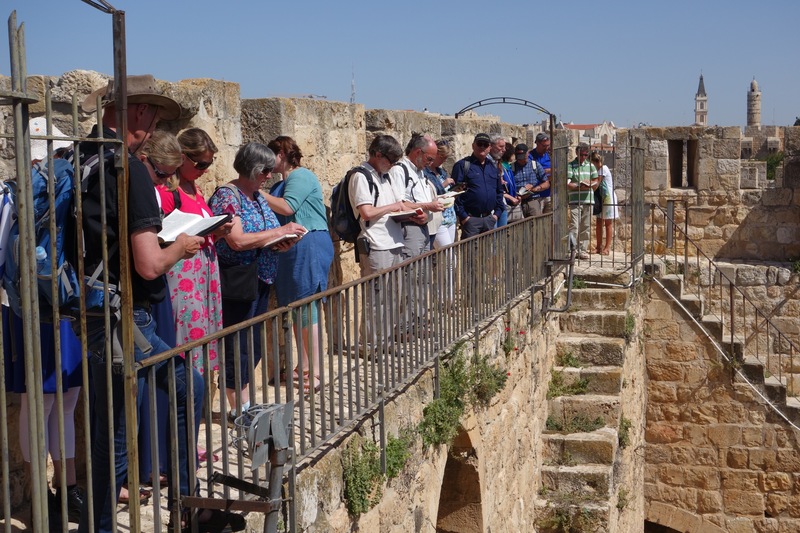 As Ari said, a Jewish Rabbi gave a sermon over 2000 years ago and was so powerful that people from all over the world are still coming here every day to mark the event and better understand Jesus’ message of love, peace and faith. 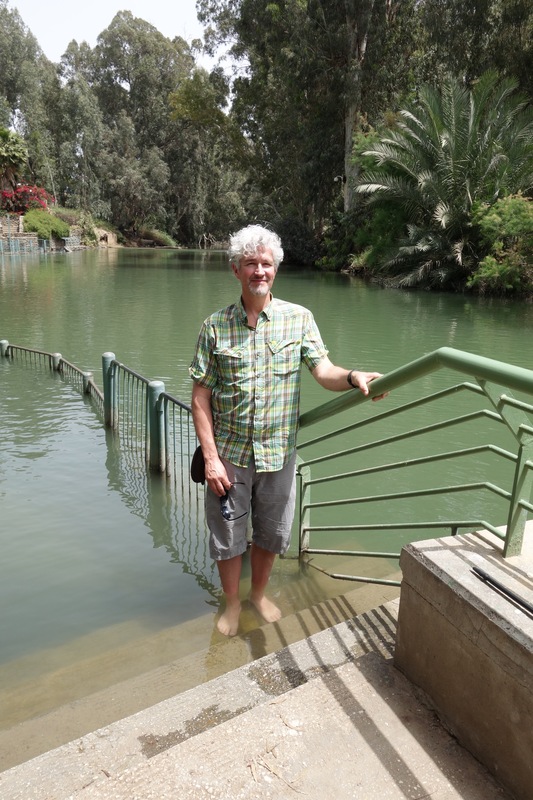 Our finall Christian stop for the day was a spot on the Jordan River where many Christians come from all over the world to baptized in the Holy Land in the same river where Jesus was baptized at the beginning of his ministry. 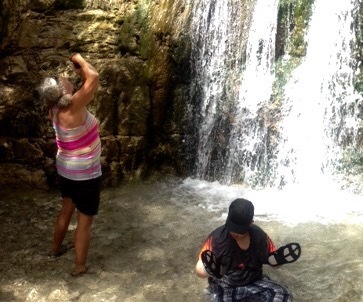 Jim put his feet in the waters as other pilgrims were joyfully being baptized nearby. 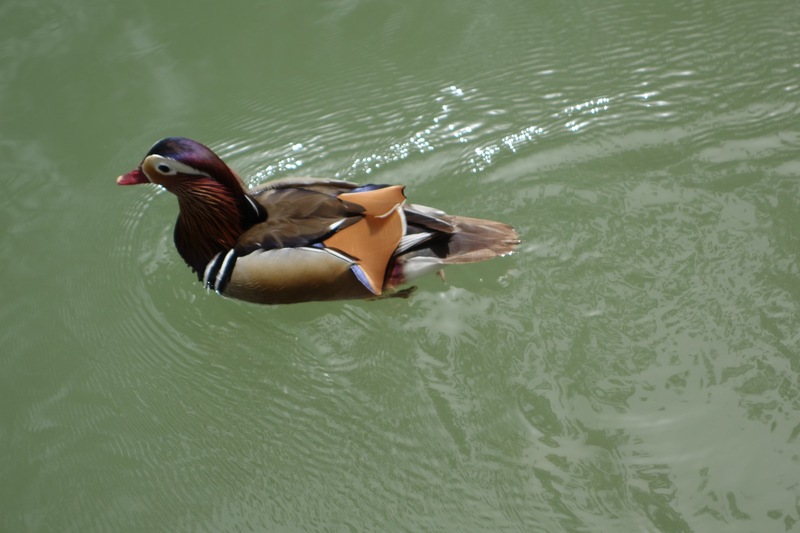 At about the same time, we were treated to a beautiful duck swimming by and several giant catfish swimming near the surface of the baptismal stairs leading into the river. 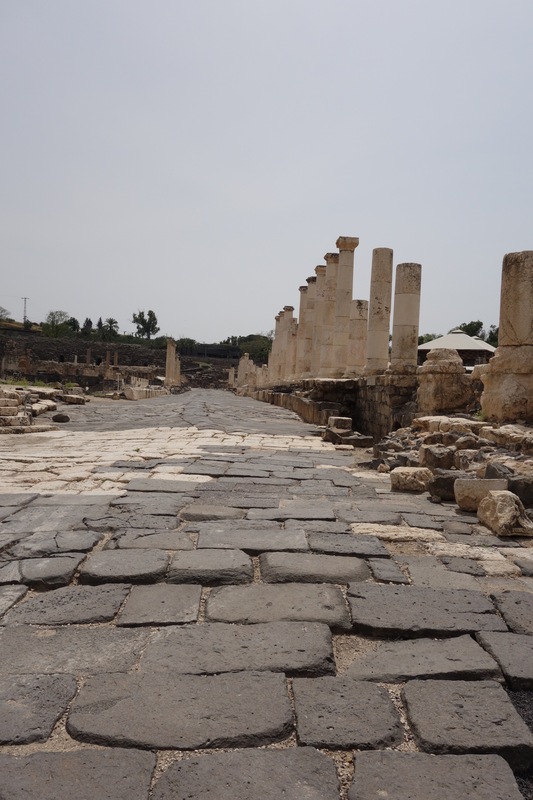 On our way to Jerusalem we made our final stop at a very large Roman archaeological site: Bet Shen. 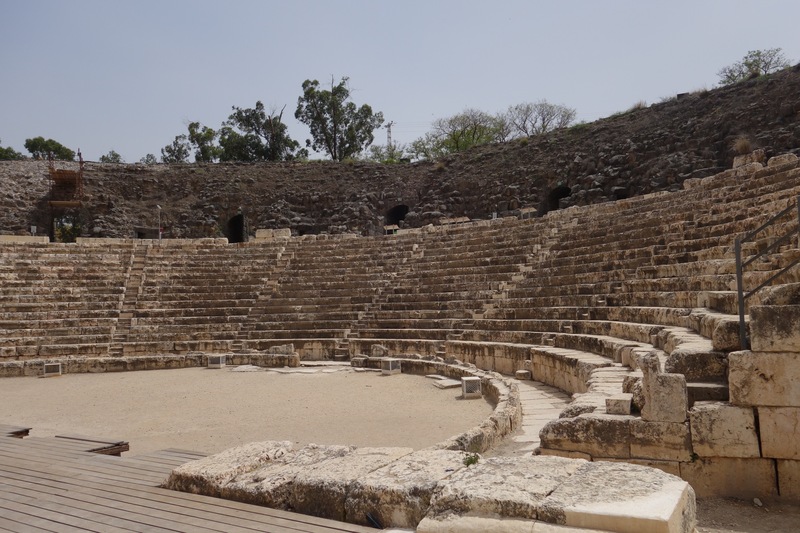 At its peak in the second century, over 20,000 people lived there and enjoined its flowing waters, fountains, public baths and an outdoor theater that seated 7,000. Of course, after it was built it became a target for takeover by others, and was abandoned after a big earthquake toppled most of its stone buildings and columns. The city’s remains are still beautifu and impressive, but it was hot. Interestingly, the Sea of Galilee is well below sea level in and I really felt tired from the sun and warm temperature. 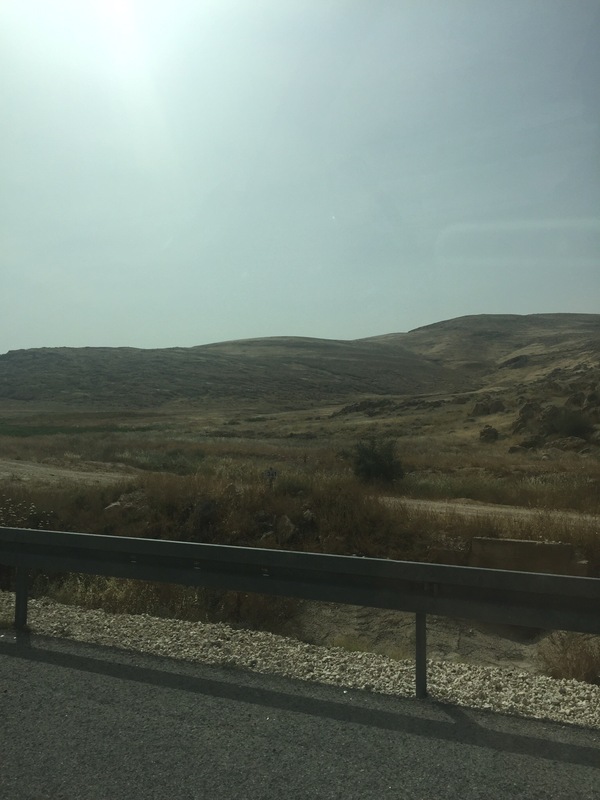 It was about an hour and a half drive from there to Jerusalem through the West Bank as we followed the Jordan Valley south on Israel’s longest road: route 90, which runs only 300 miles from north to south. 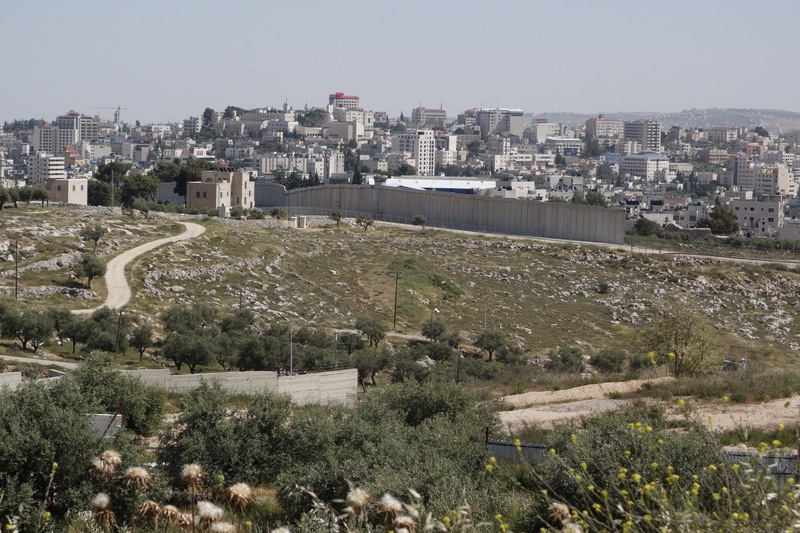 This part of the West Bank is virtually empty. Passing through the check points into the West Bank and out of it into Jerusalem were easy, we only had to slow down briefly to about 5 mph as we drove through each checkpoint. Driving to our Jerusalem hotel we got our first glance at the walls of the Old City. Ari dropped us of at the hotel before driving back to his home in Haifa for a needed rest before we join up again on Friday morning. After settling into our modern hotel room with a view of the Old City, we showered and rested and then walked to the original Jaffa-Jerusalem train station, built in the late 1800’s by the Ottoman-Turk Empire. The old station was recently converted to a place where you can shop and eat. 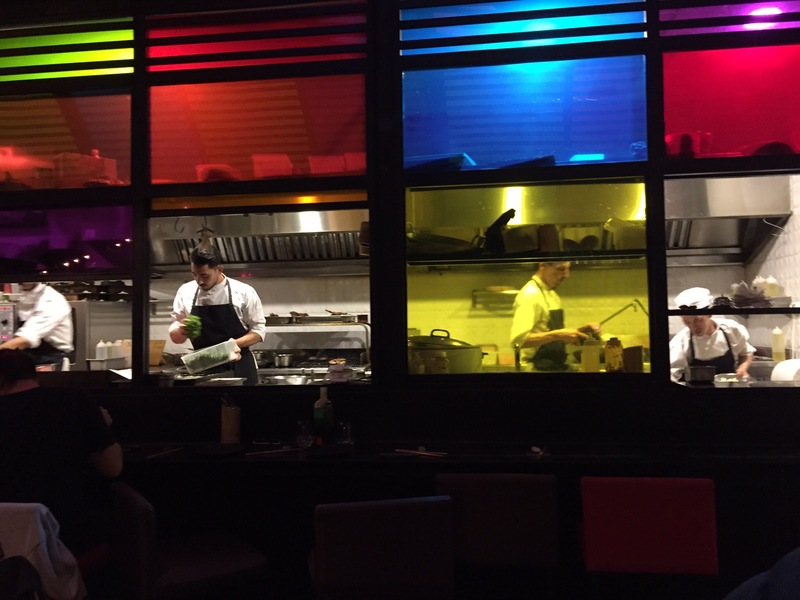 After looking at all the restaurants, we chose Station 9, which rewarded us with a delicious “Asian fusion” meal. Today after sleeping in a bit, doing some light shopping and getting Jim a haircut, we went for Segway Tour of the area. It was a great way for us to cover a lot of territory easily. 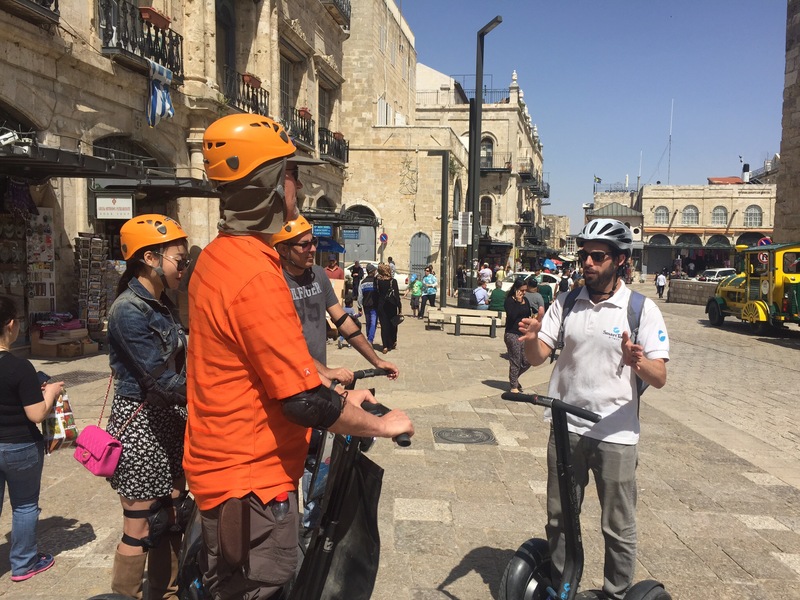 We even got to ride them a bit in the Old City. Jim loves Segways and we both enjoy the smiles we get from most children and many adults as we travel along the local bike paths, sidewalks and pedestrian plazas. We spent our afternoon walking around the Old City. It’s a strange place, a crowded old shopping bazaar mixed with crowded religious sites. 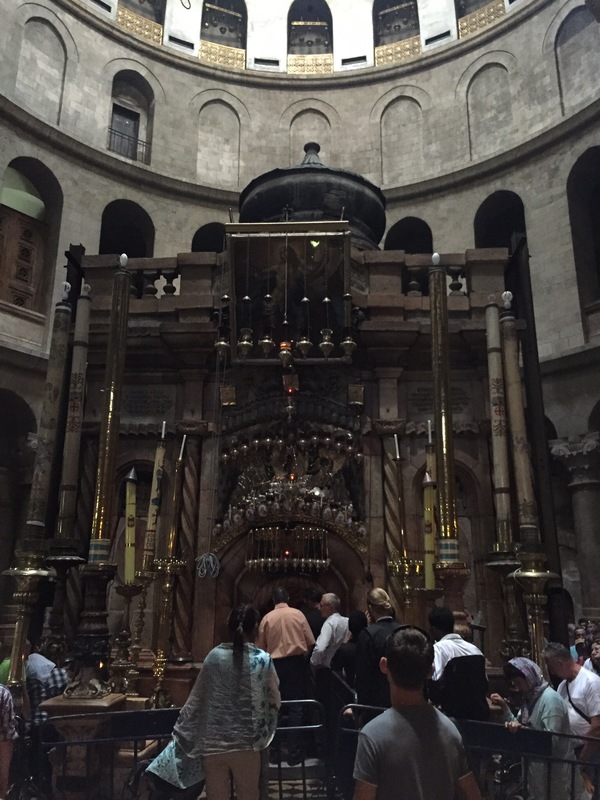 Jim wanted to go to the Church of the Holy Sepulcher. I honestly had no idea what to expect. 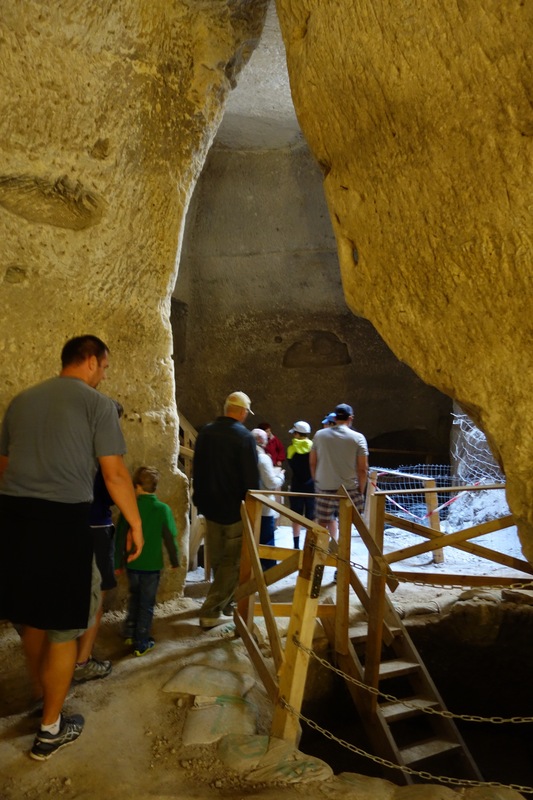 It’s the most important Christian pilgrimage in Jerusalem because it’s supposed to be where Jesus was both crucified and buried. Unlike the sites we visited yesterday in Galilee, I found this dimly lit and very crowded church draining and overwhelming. We ended our first visit to the Old City by grabbing a meal at an Armenian restaurant. The Arminian story is as tragic as the Jewish story. In fact it’s in the news this week because the Pope recognized as “attempted genocide” the systematic slaughter of over 1,000,000 Armenians by the Turks 100 years ago during the Turkish-Russian battles of WW1. Turkey recalled their Vatican Ambassador in protest. 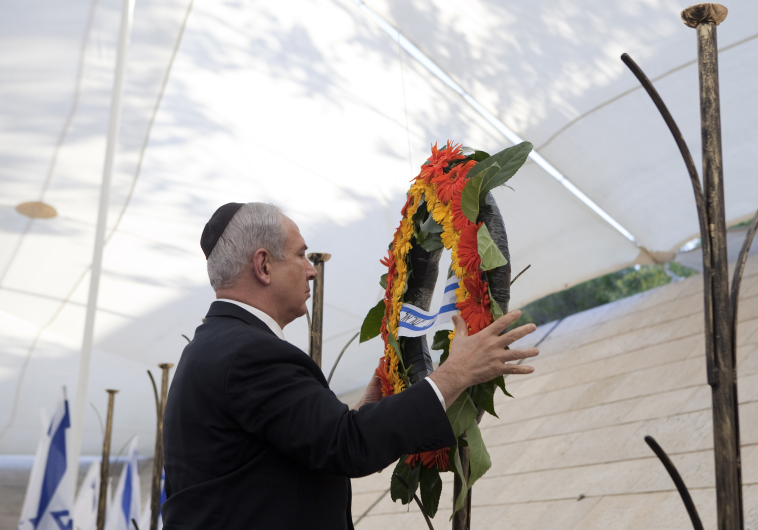 Tonight ends with beginning of the solem Israeli Remebernce Day marking the deaths of 23,320 soldiers and civilians who have died in the wars And terrorism since independence; 116 in the last year. At 8PM, nationwide sirens marked the beginning of this 24 hour, solemn national holiday. There was a moving ceremonyat the Western Wall that we watched on TV. Unfortunately, there was no English translation but the emotions of the widows, widowers, orphans and parents of recently fallen soldiers was still very moving. 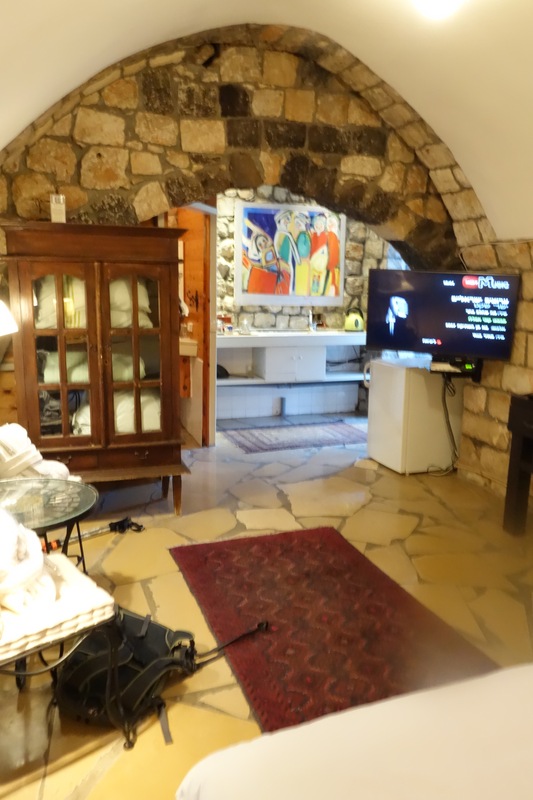 As I finish this blog entry we are watching a beautiful memorial concert on TV that is taking place just outside the walls of the Old City. If we mute the TV we can also hear it outside our hotel room In the distance. 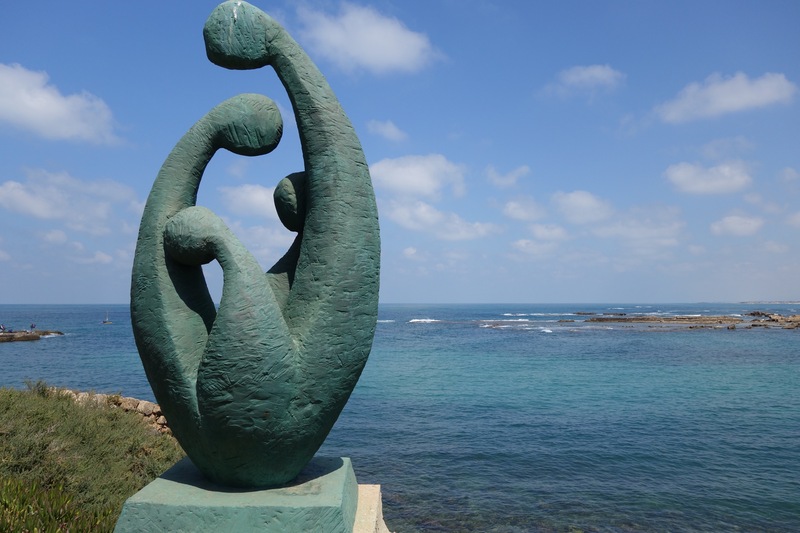 Yesterday, we ventured out of the new world of Tel Aviv and drove north to northern Galilee. We’ve done so much in the last two days it will be hard to explain it all. 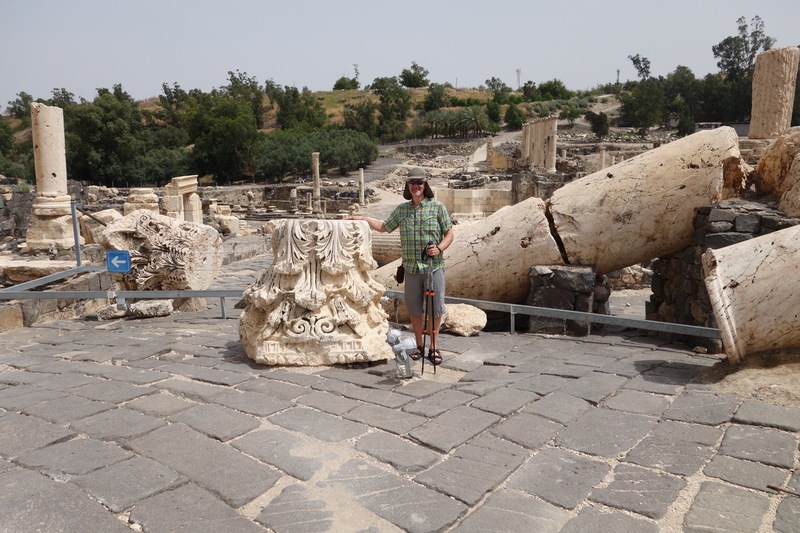 Our first stop was Cesarea, the location of Herod’s Capitol & personal residence, and the location of the first man-made port. Herod was a Jew who betrayed the Macabee King and conquered Israel for the Roman Empire. In return, the Romans made him King of Judea for life. 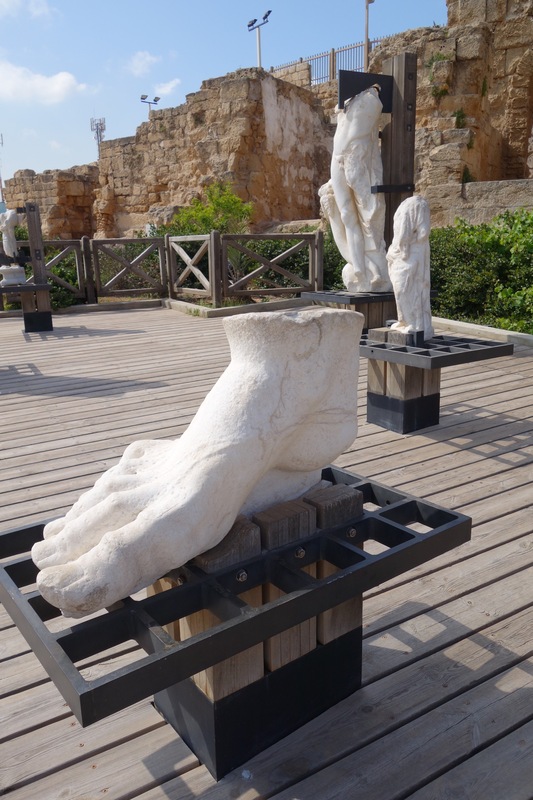 Herod was quite the engineer/architect & built the impressive artificial port city of Ceasaria, the palace-fortress of Masada, and rebuilt the Temple in Jerusalem. 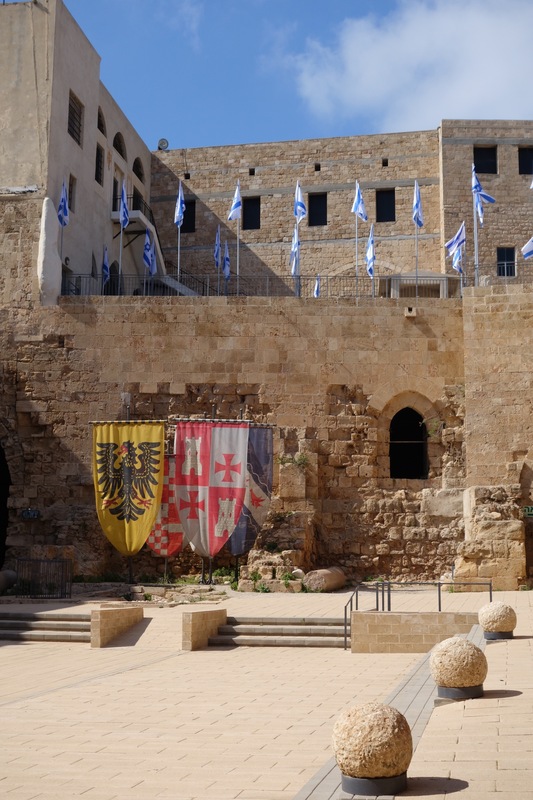 Ceasaria was repeatedly conquered over the centuries until it was razed to the ground by the Islamic Mamluk Empire at the end of the last Crusade. The area is stunning and a place where locals go to enjoy the beautiful coastline & antiquities. In the early 1900’s the land was purchased and redeveloped by the Baron Rothschild. Locals now enjoy the beach, music and food. 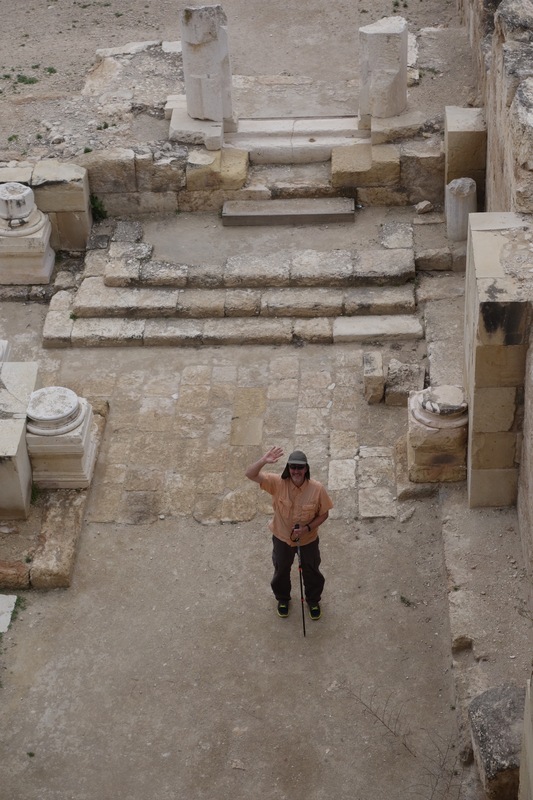 Herod built quite a nice palace as you can see by the remains of his personal swimming pool. The whole area was supplied with fresh water from the aqueducts from Mt. Carmel. 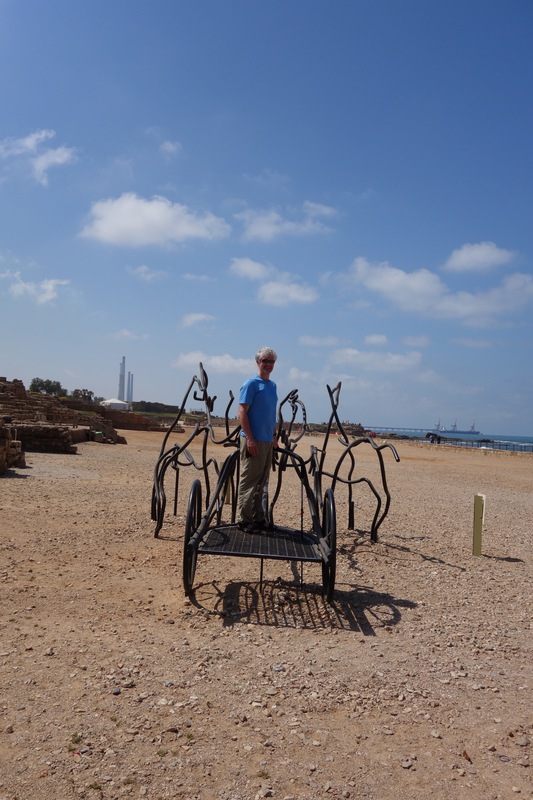 Jim particularly liked the huge circus ground where the Ben Hur-like chariot races were held with an expansive view of the Mediterranean Sea. Much of the ancient port is now underwater (due to devastating earthquakes in the 2nd & 8th centuries), so it’s a great place to scuba dive. That’s something we hope to do another time. From Cesarea we headed north to Acre. 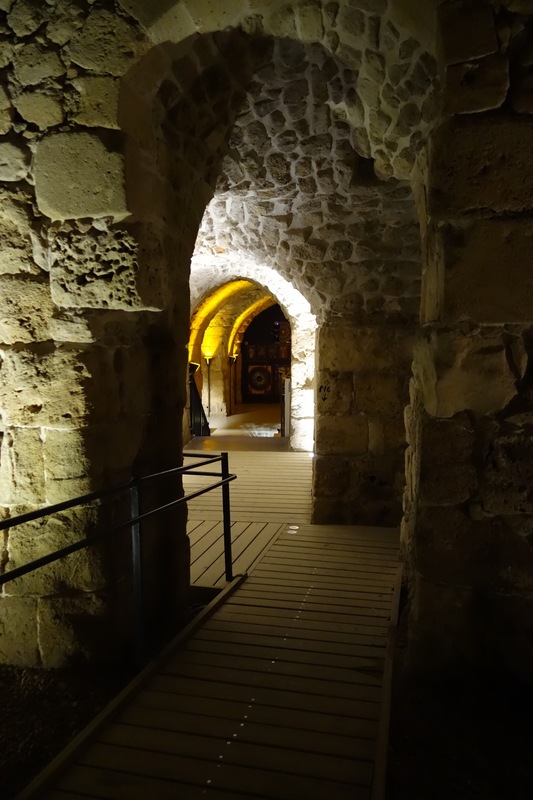 Acre is a large Israeli Arab city that contains a huge Crusader Fortress and underground archeological site. Archeologists discovered 30 years ago that most of the Fortress was underground but had been filled with dirt over the ages. We walked through just a bit of it & were very impressed. The above ground area was the site of the Main British prison during the decade prior to the Israeli Declaration of independence. Clearly, they didn’t learn from the relatively recent situation in India and although ordered not to, the local military leader hung 29 Jewish patriots before the rest were freed in a big prison break. Ari’s Uncle was one of the death row prisoners who escaped at that time (as shown in the movie Exodus). From Acre we drove farther north to Haifa, near where Ari lives. 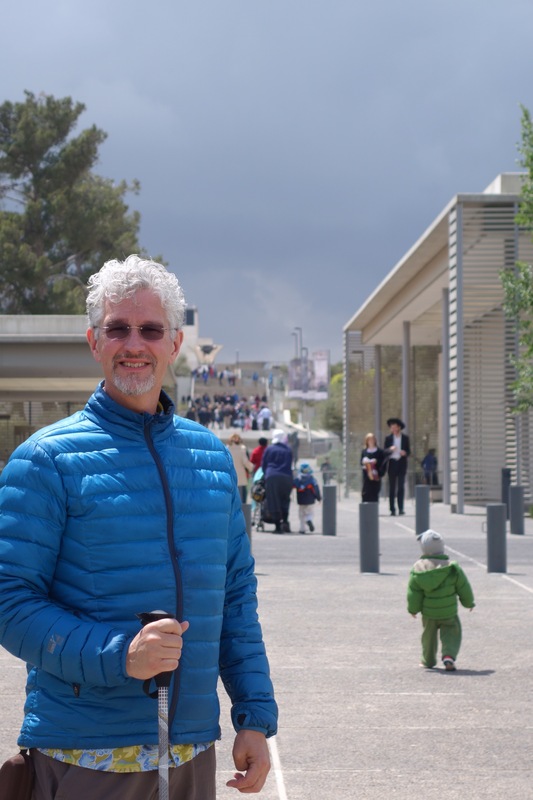 After seeing the stunning view from both the bottom and top of the beautiful Baha’i Shrine & gardens, we stopped for delicious Falafel and Shwarma pita bread sandwiches at Ari’s favorite local fast food restaurant. 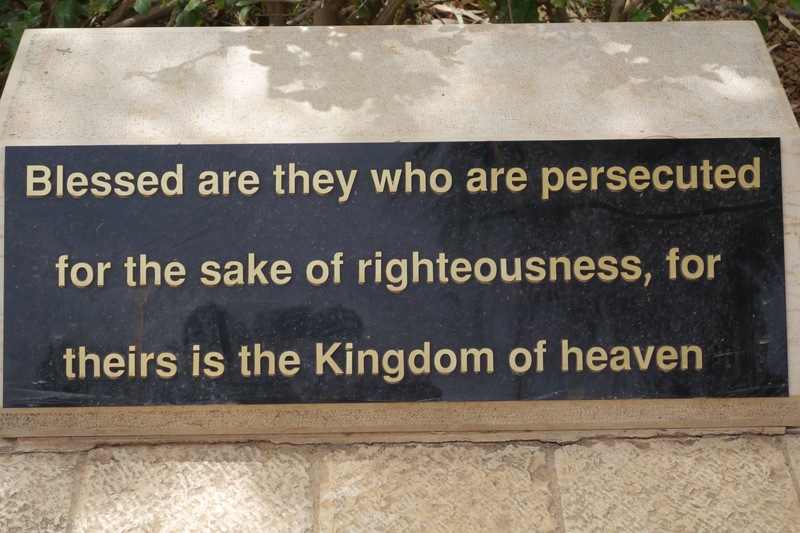 Interestingly, the Baha’i (and the Druze and others) are “latter day Saint” offshoots of the Shiite branch of Islam who are still often persecuted outside of Israel for believing in more recent “latter day” Prophets who supplemented the teachings of Mohammad. 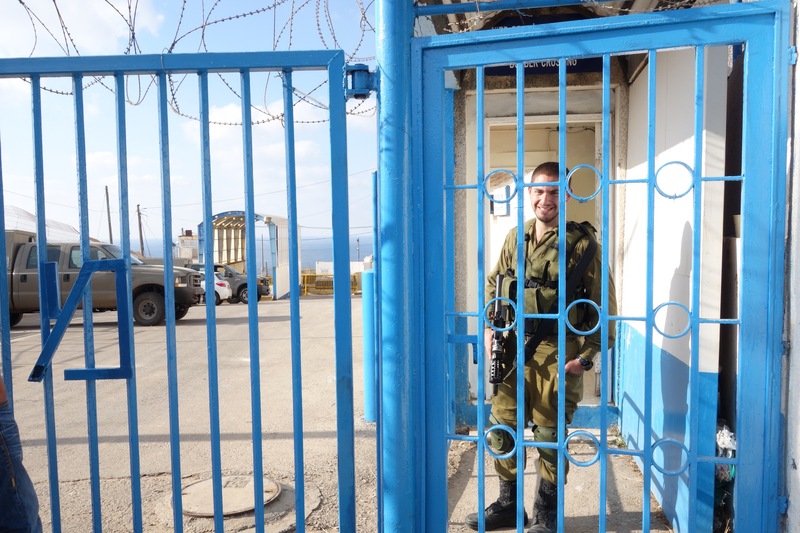 From Acre we drove to Israel’s northwest border, where it adjoins Lebanon. 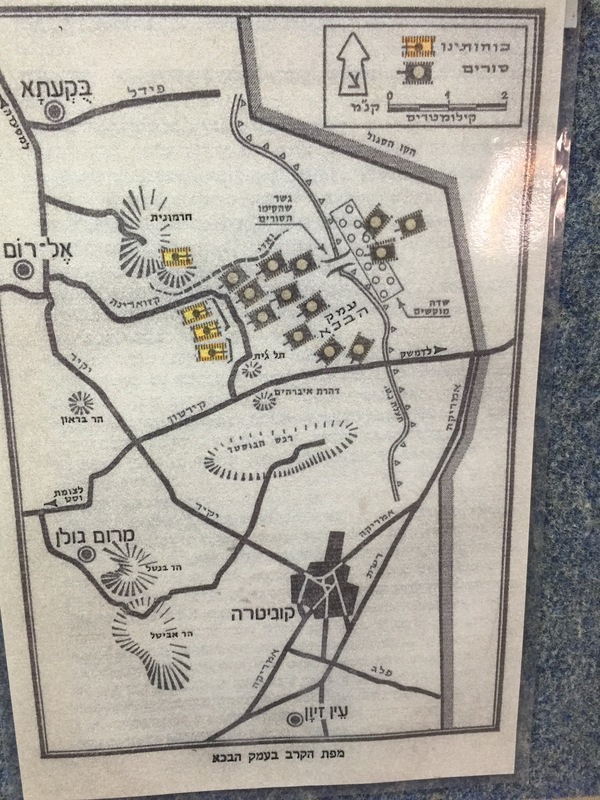 This is where the Palmach originally were trained by the British to help with the fighting in Lebanon during WW2. 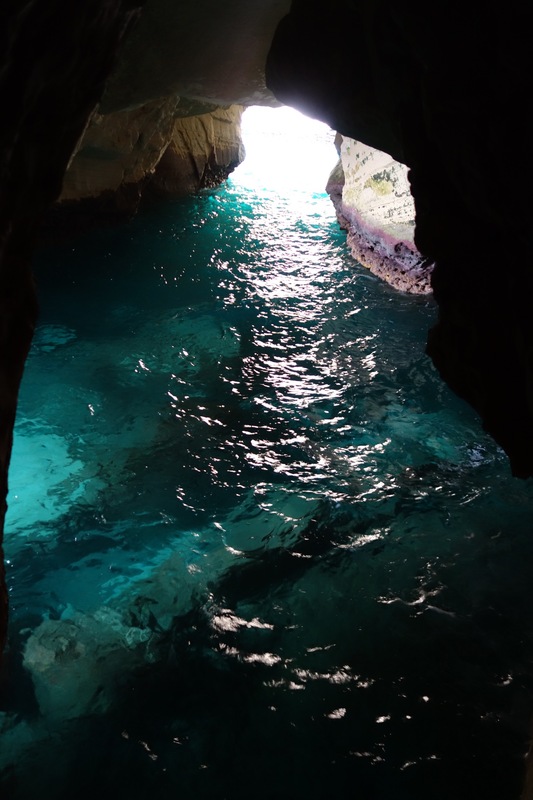 The British built a train tunnel through the coastal hills into Lebanon that has since been abandoned but which exposed a beautiful grotto (coastal caves). Because there are no seals or sea lions here it is clean and beautiful and filled with the echoing sounds of the surf flowing in and out of the interconnected caverns. We walked to the border and took a picture. It really is hard to believe we were so close to Hezbollah or as Ari likes to call it “Hezbollah-stan”. Finally, we drove along the (safe) New Northern Road vs the sniper-accessible old Northern Road. 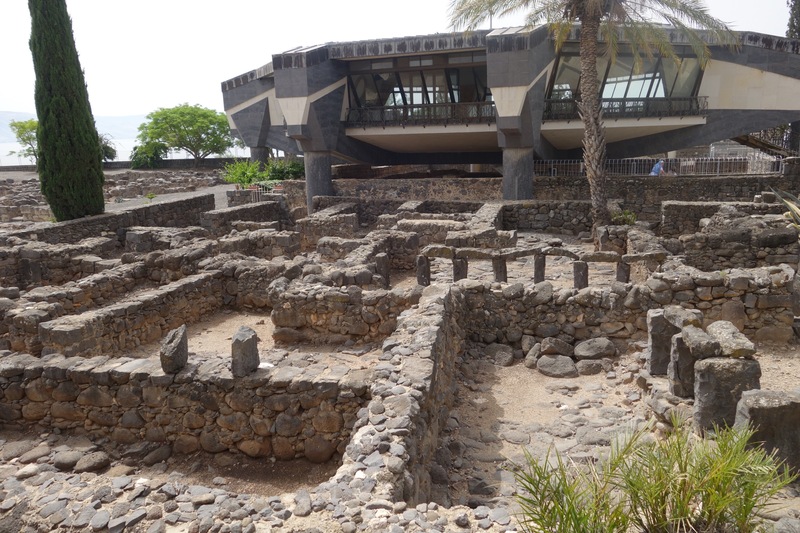 We drove past really beautiful rolling, wooded hills, with Lebanon often in sight, until we reached our destination: Pina Barosh, one of the first early pioneer settlements in Israel (preceding the first kibbutzim by more than 30 years). We checked into our very artistic, rustic yet elegant hotel (made out of a 100 year old stone stable) with beautiful views of the Golan Heights on the other side of the green Hula Valley. Our room has a romantic, covered outdoor hot tub. We ended our day with a soak and then collapsed in bed. 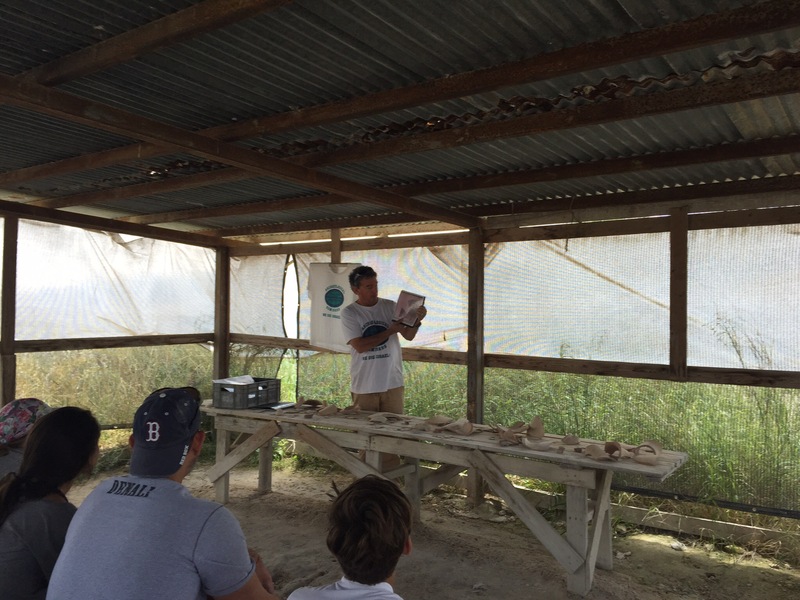 Today, we woke early for a jeep tour from a local, Ijal, who immigrated to Israel from the Soviet Union when he was just 6. Baron Rothschild also purchased land here and helped many of the early settlers. We drove through a local Kibbutz where many local immigrants from one of the “lost tribes” in Africa begin their new lives in Israel. 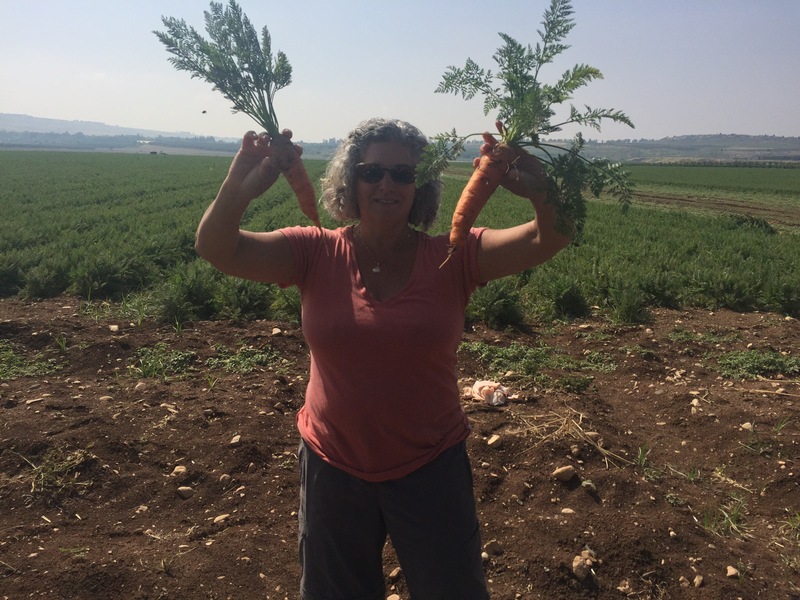 Ijal then drove the jeep through the farming areas of the kibbutz where I picked carrots and oranges and we saw truckloads of just harvested fresh peas. Yum Yum! 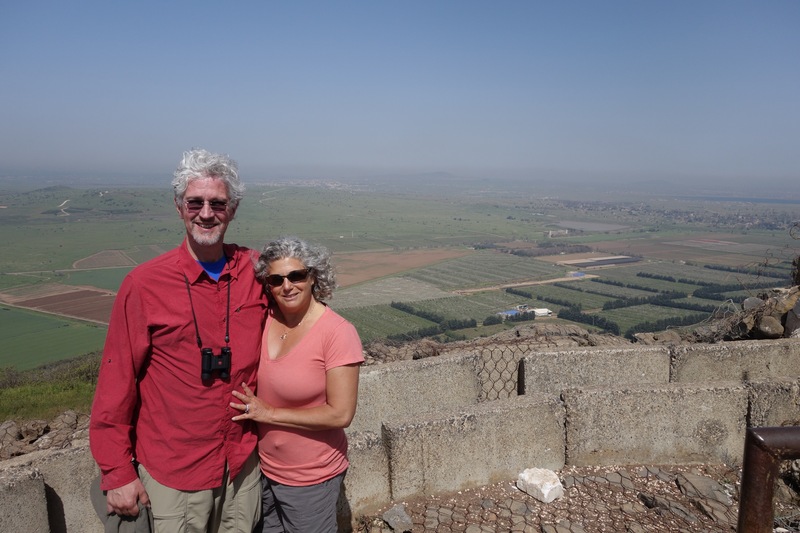 After that, we drove past the site where Deborah’s tribe of warrior women defeated a Canaanite king in ancient times, then over the Jordan River and past fields blocked by barb wire and signs marking the minefields left behind by the Syrians after the 6-Day War in 1967. 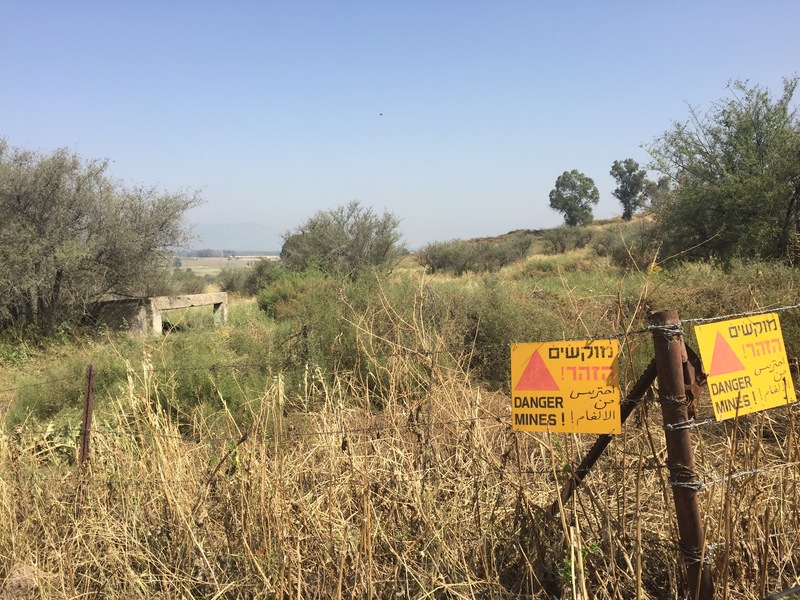 The Syrians have never provided the maps necessary to clear the mines, and the land is too steep and rocky for mechanized mine clearing techniques so much of the land immediately to the east of the Jordan river is unusable. The mines still go off occasionally when cows knock down the fences, wander in, and trigger a mine explosion. 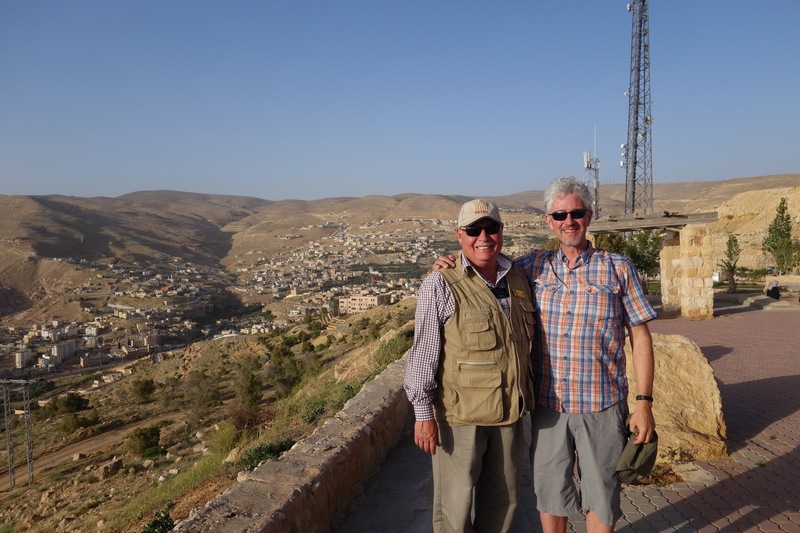 Ijal delivered us to Ari around noon and we continued our tour on paved roads. We drove by the Naot shoe factory at kibbutz Naot Mordechai where I did my part to help the Israeli economy by buying the very comfortable Naot shoes at a nice discount to the U.S. retail price. 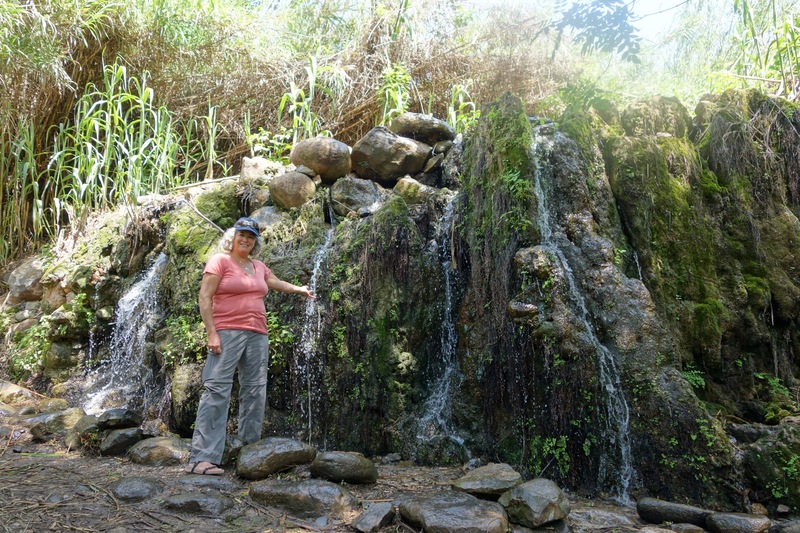 Before the intensity of the Golan we headed down to see one of the sources of the Jordan River: the Dan Spring. 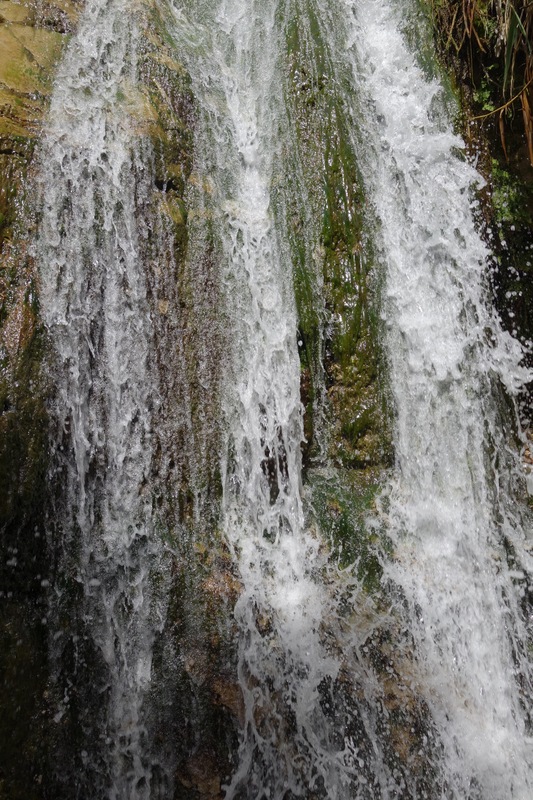 The gushing water was spectacular and the surrounding park very beautiful. Of course I had to walk in th pools where the water was cool but refreshing. Then it was up the big hill to really get a sense of the Golan. 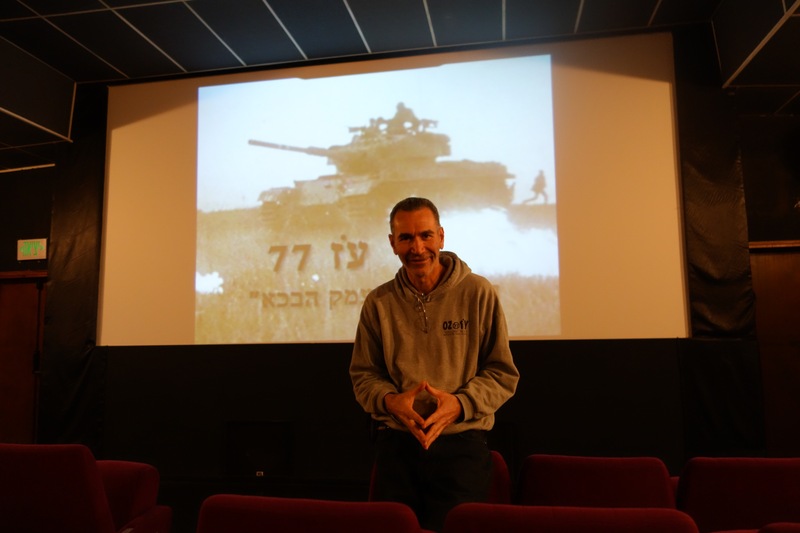 Our first stop is in a Kibbutz that showed a movie about the 1973 Yom Kippor War tank battle in the “valley of tears”. The myth was that Israel was surprised by the simultaneous attack by Egypt & Syria, but their there is lots of evidence now that Israeli leaders actually had lots of advanced warning. 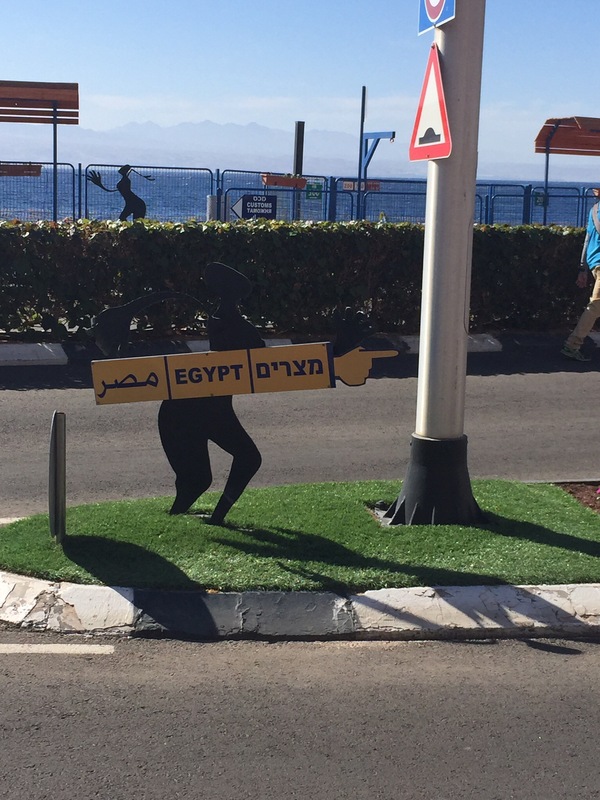 For complicated geopolitical reasons involving Russia, Egypt and the U.S., Moshe Dyan agreed with the U.S. to wait for the “surprise” attack rather than pre-empt it. Unfortunately, it was a mistake and Israel came close to being destroyed, losing 4000 soldiers in just 3 weeks. The entire population of Israel at the time was only 2.5 million. So 4,000 casualties is equivalent to all the soldiers the USA lost in the entire Vietnam war, but over only 3 weeks. Because of the losses, Golda Mier had to resign as Prime Minister & her Labor Party was defeated for the first time in the next election. 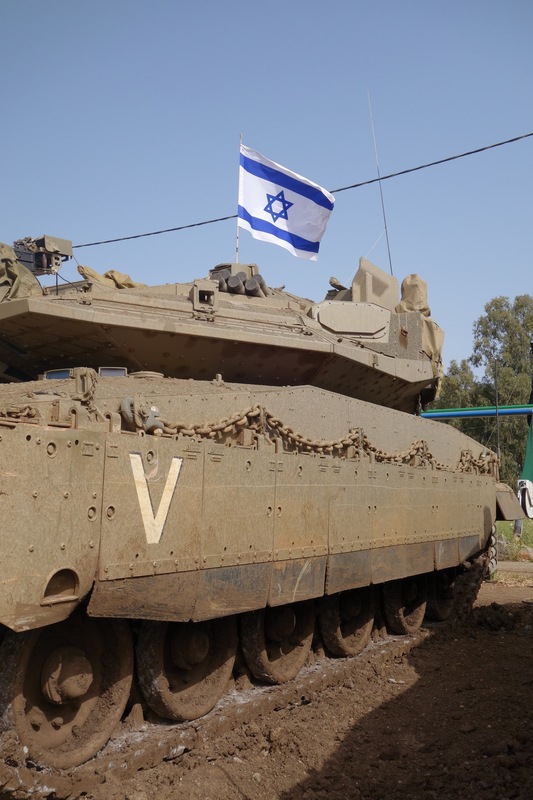 In the tank battle on the Golan, Israel had only 40 tanks to Syria’s 800. It was a remarkable victory that only happened because Israel had the high ground. 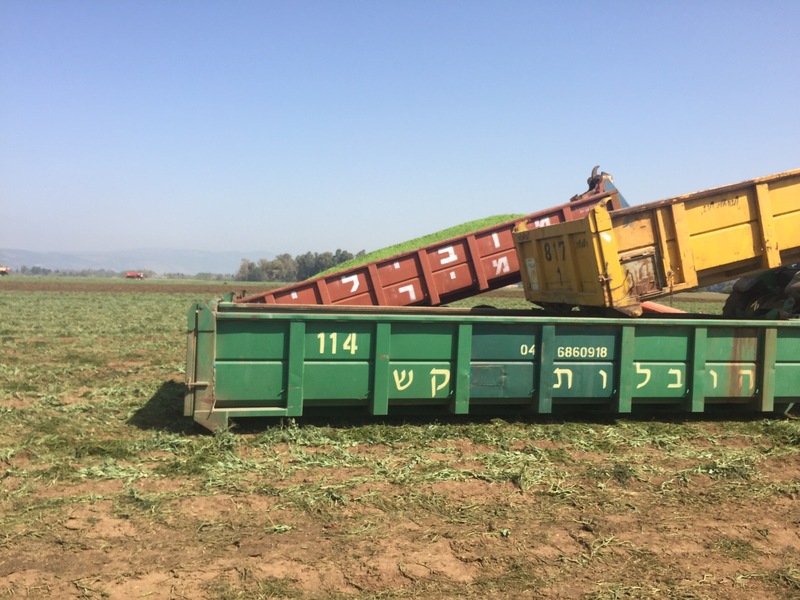 The IDF soldiers were incredibly brave and the tank commander bluffed by sending all his tanks forward, even when the ran out of ammunition, causing the Syrians to pause, thinking Israel had a much larger force. 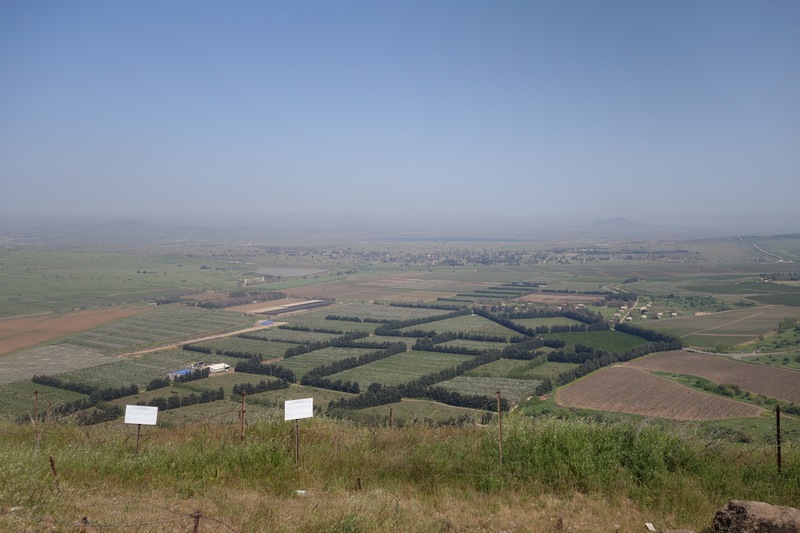 Standing on the view point at the top of the Golan Heights Valley looking East into Syria and North to Lebanon it is clear to us that Israel can never give up the Golan and still have defensable borders. It is insane for any American President to ask for it in any negotiations or for any Israeli Government to offer it. 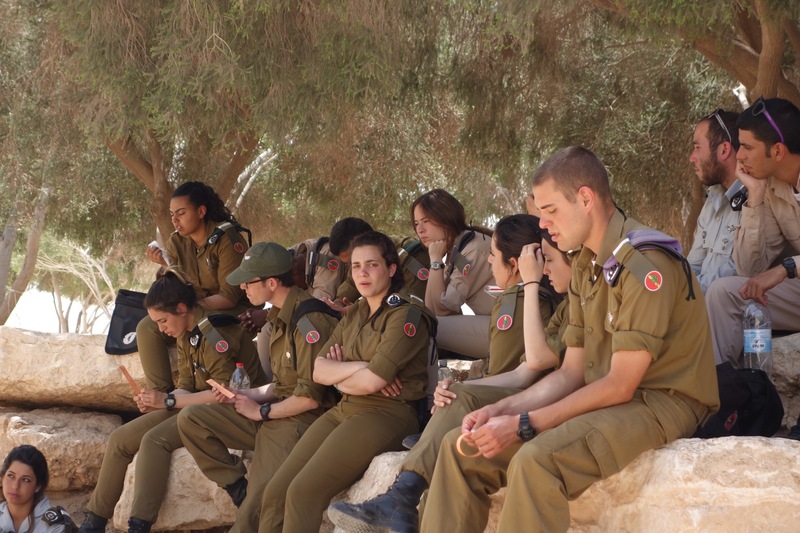 Our guide Ari has a strong military background and is a great source of information. It’s impossible to share it all here, but it is enlightening and thought provoking. We have a lot of reading to do when we get back home. On our drive today we saw a fox and freshwater turtles along with beautiful flocks of storks. 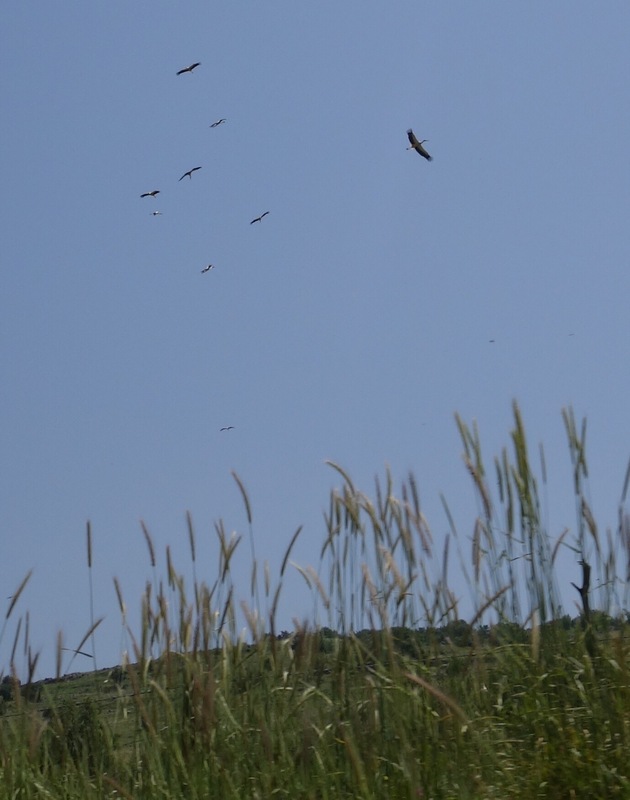 This area is filled with flocks of migrating birds. 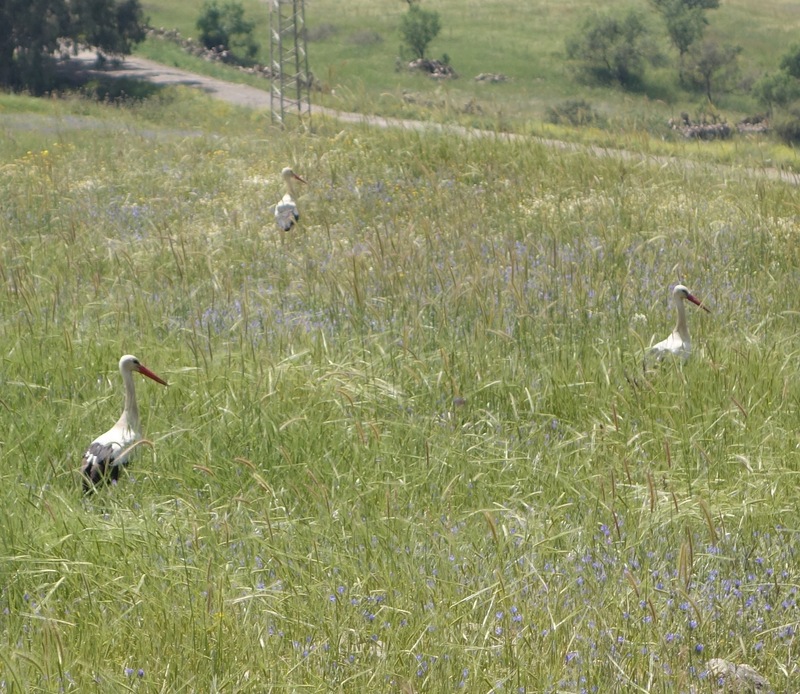 Most have moved on by his time of year but some storks reman. From there we went to Tsfat, home of Kaballa, the Jewish mysticism . It’s a hilltop old town with lots of Orthodox Jews, beautiful views and lovely art galleries. We met a very nice couple at dinner tonight. Israel and Yehudit Coutin. He’s an American born Jew and she was born in Haifa. They now live In LA but visit the nation of Israel often. As my sister Rachel says, this area is both beautiful and dark. It’s filled with contradictions. It feels so peaceful and bountiful, and yet it is surrounded by the “Devils in the distance” who have tried repeatedly to destroy Israel & kill the Jews living here, and will unfortunately try again in the future. 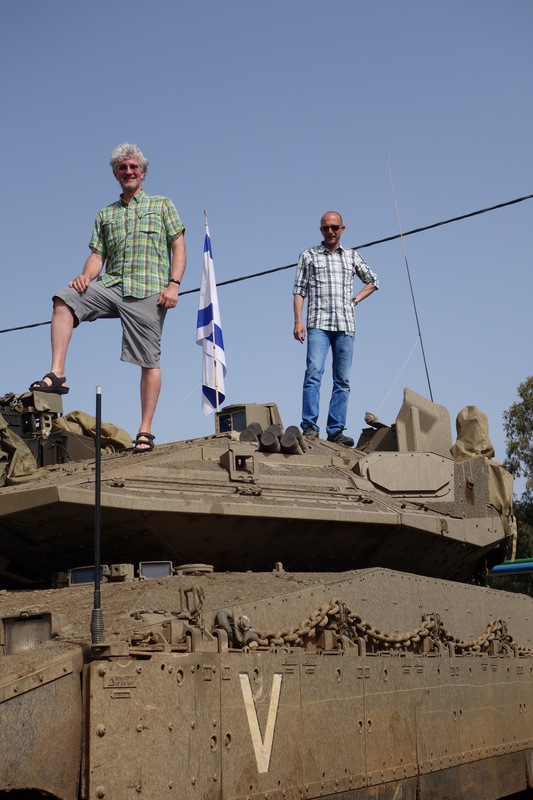 Tomorrow we get up early for a tour of an IDF tank base before heading to the Sea of Gallilee (which is actually a large lake) and other important Christian sites before heading to Jerusalem.